Sakado castle (坂戸城) is located at the top of Sakadoyama mountain, one of over 400 meter from its hillside at the east of central Minani Uonuma city. 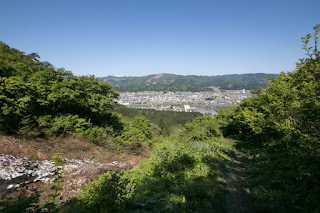 Uonuma area is a narrow and long basin spreads along with Uono-gawa river over 30 kilometer, a large tributary of Shinano-gawa river. 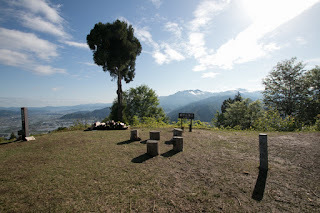 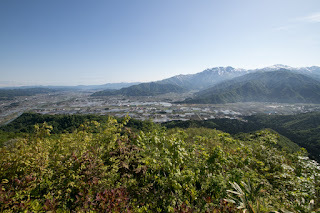 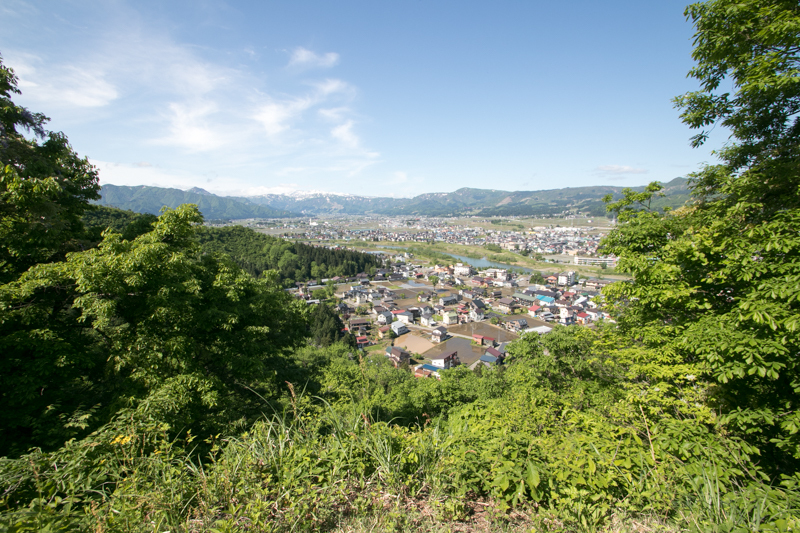 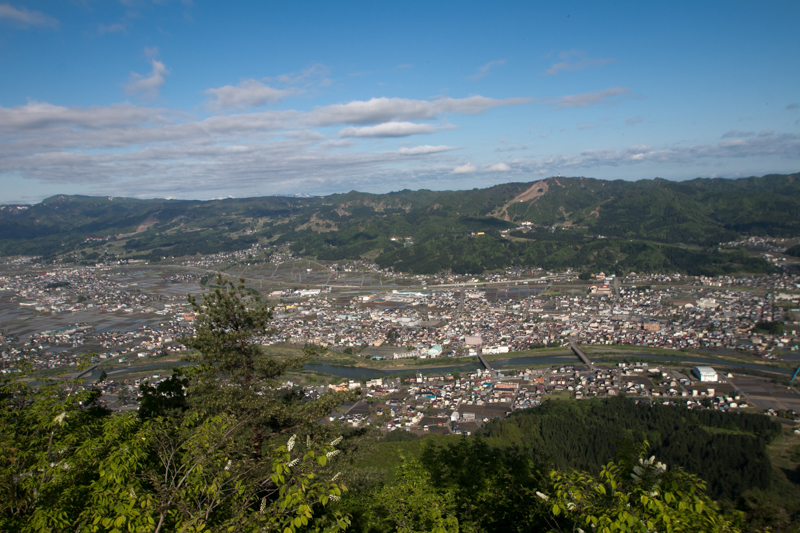 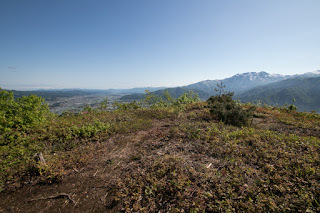 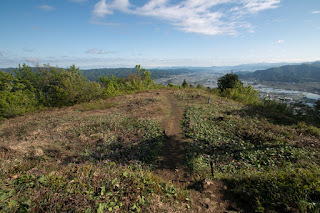 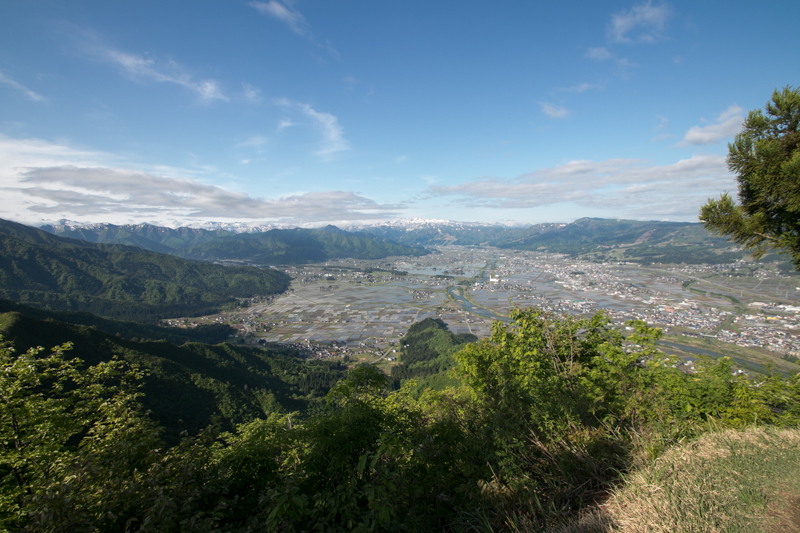 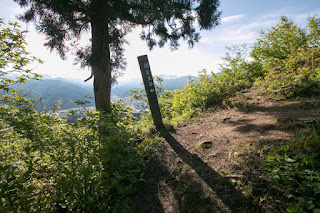 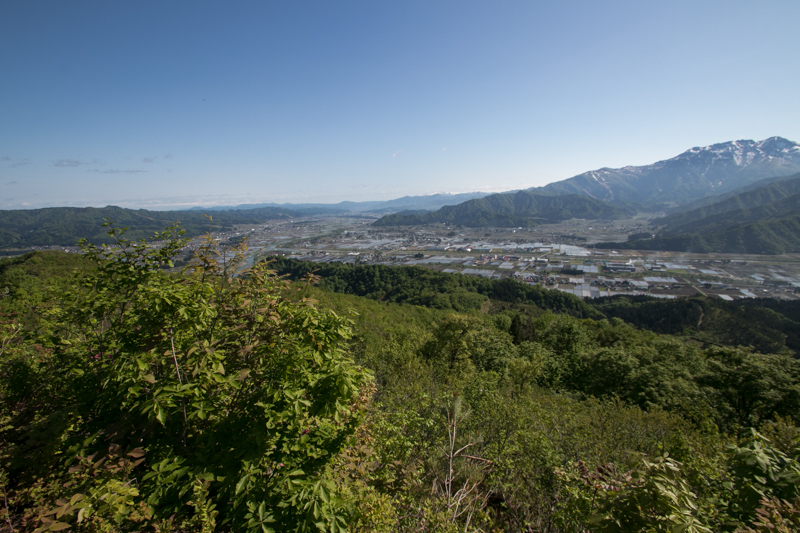 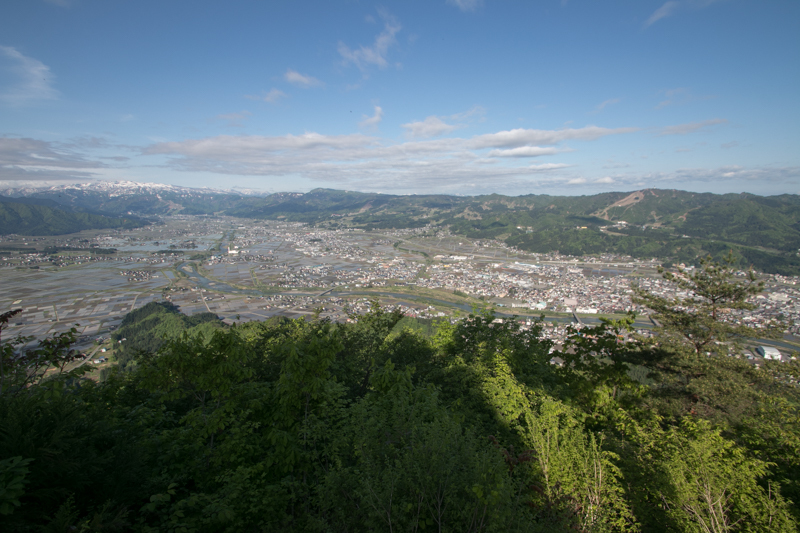 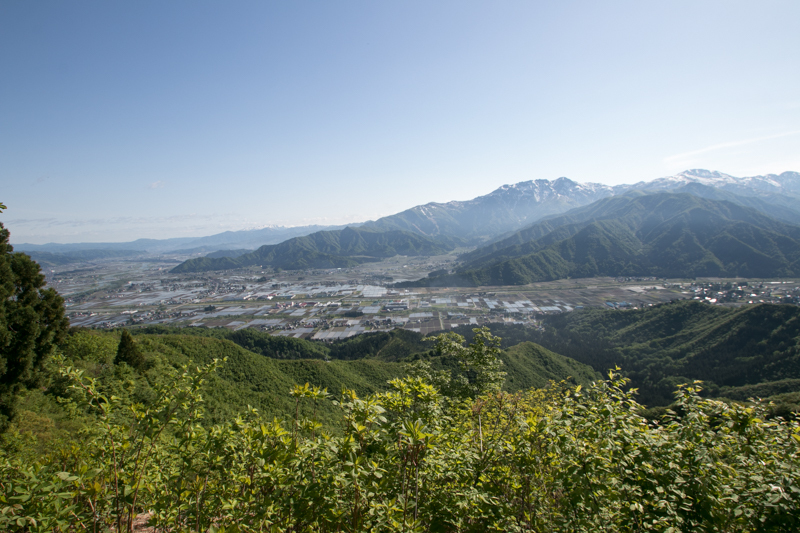 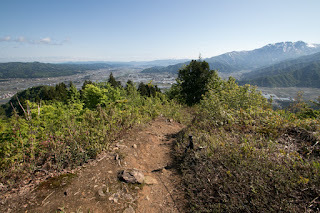 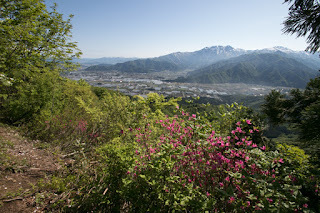 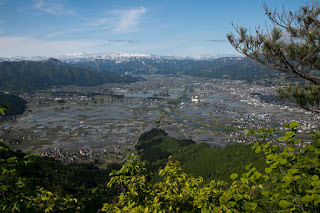 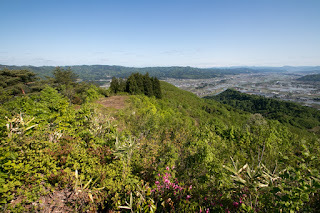 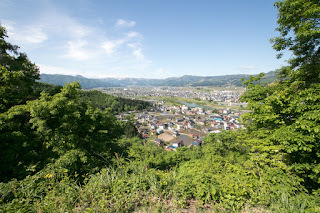 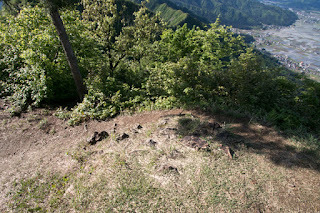 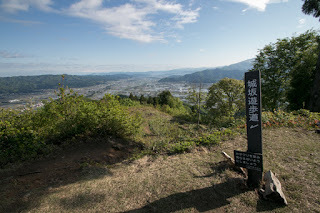 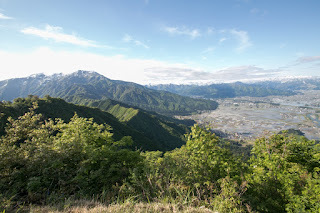 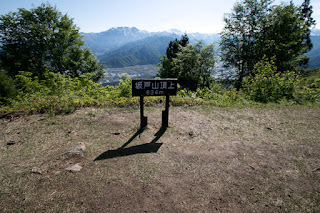 Sakadoyama mountain itself protrudes into the center of the valley from southward, and from the top of the mountain whole part of Uonuma basin is seen. 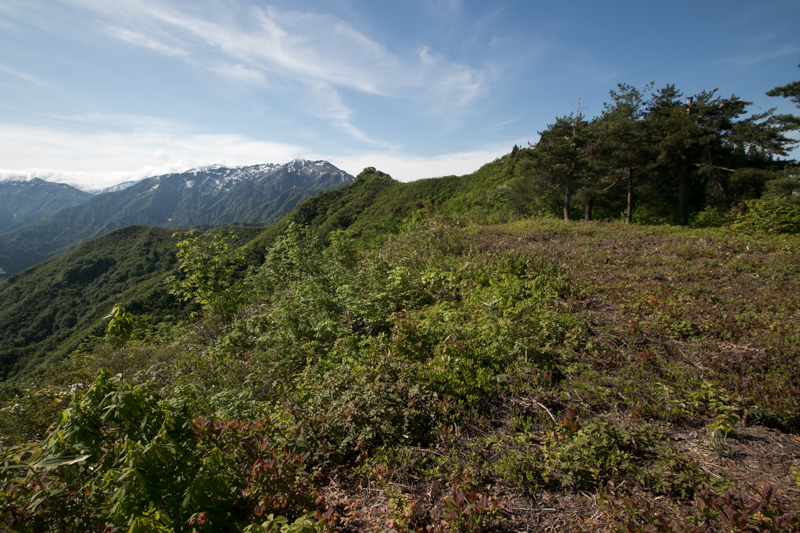 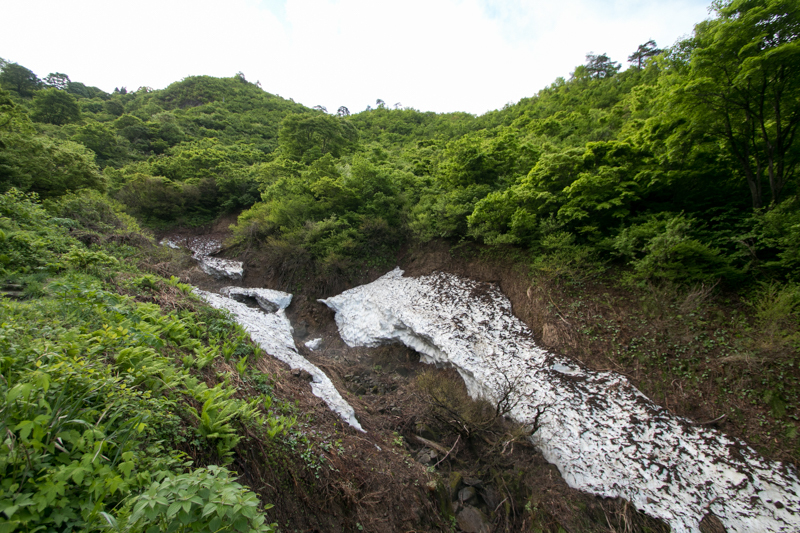 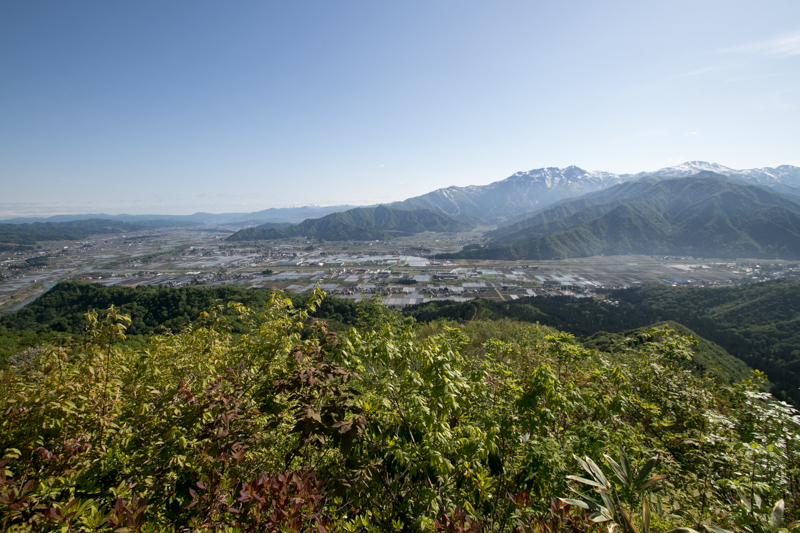 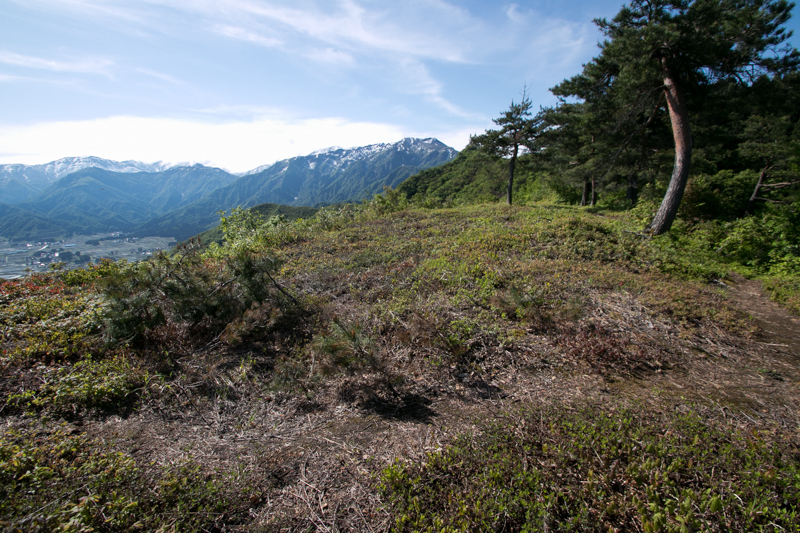 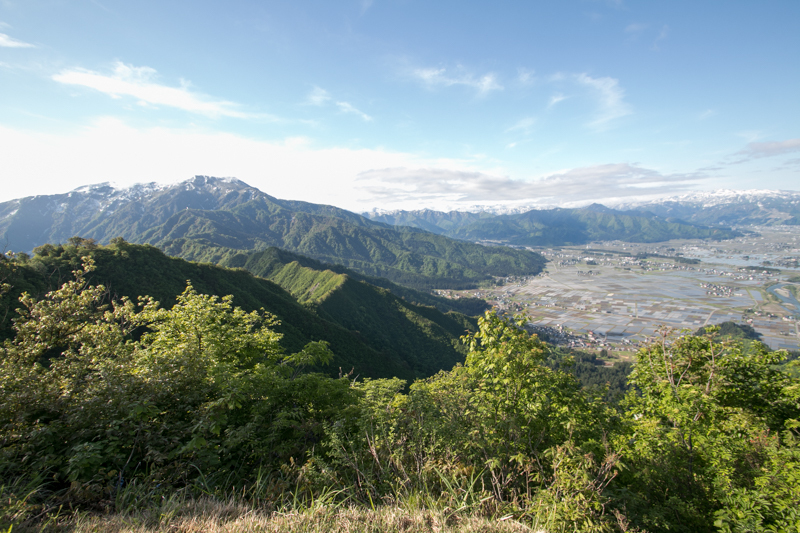 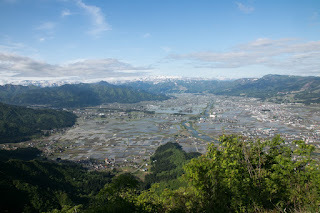 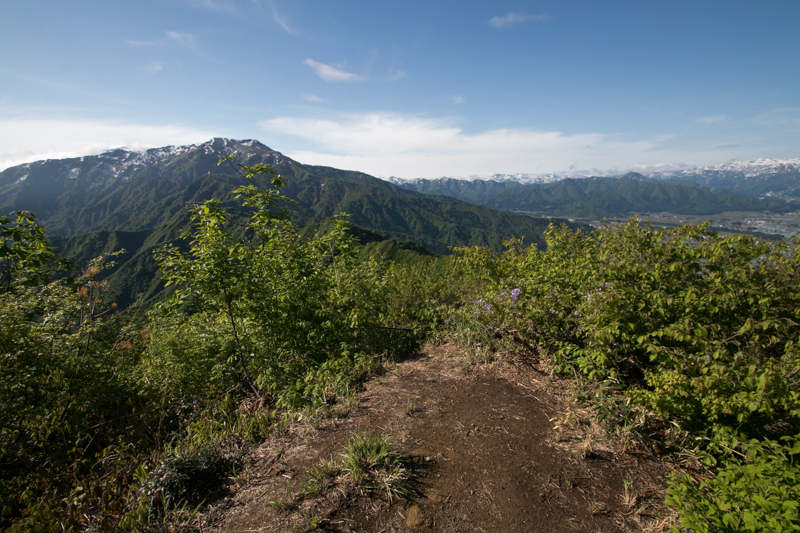 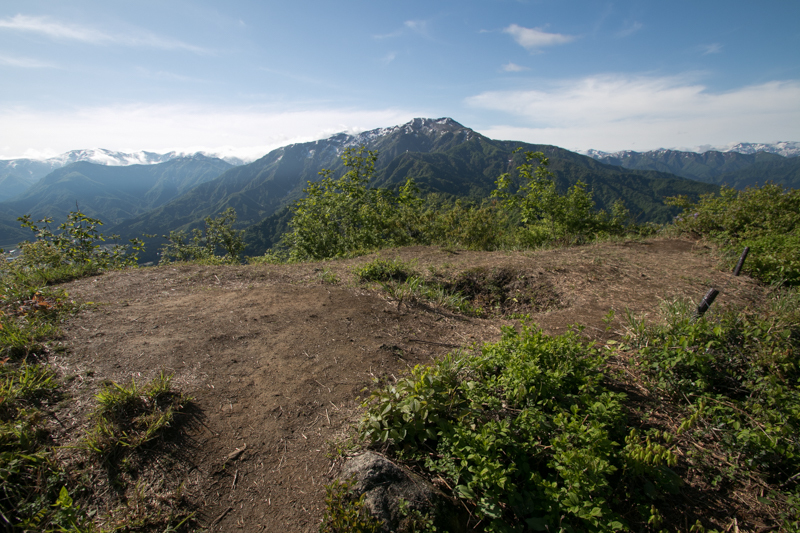 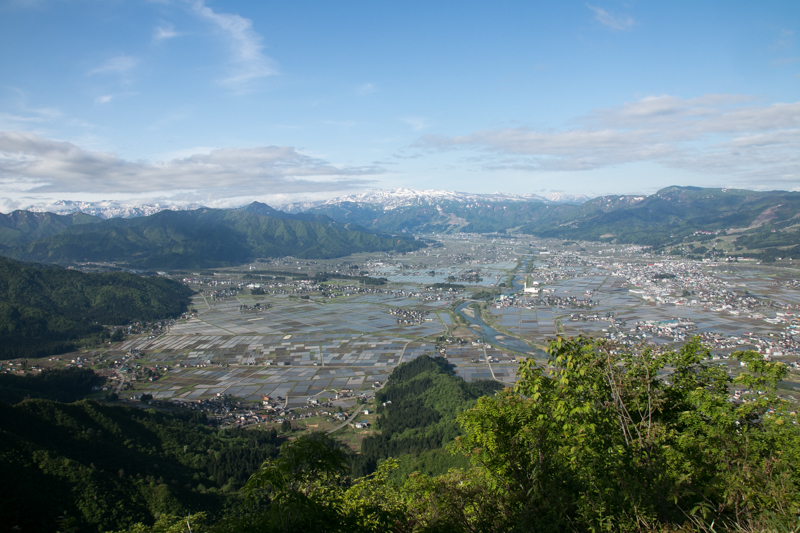 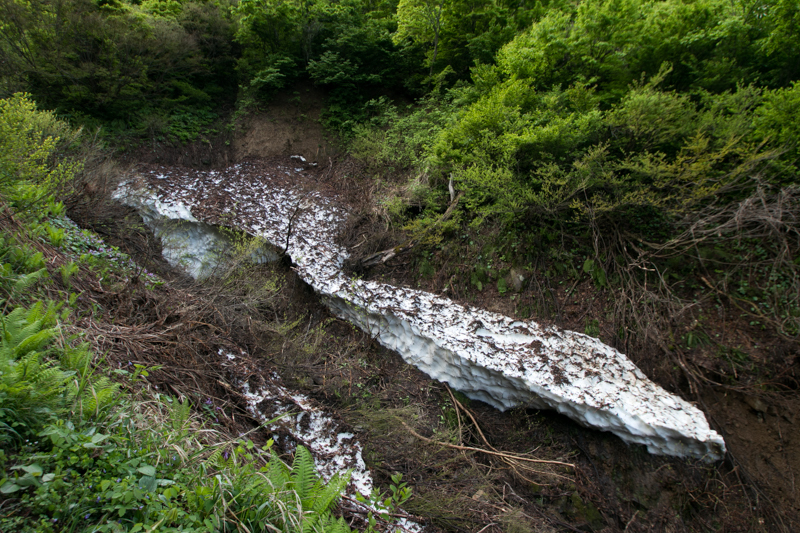 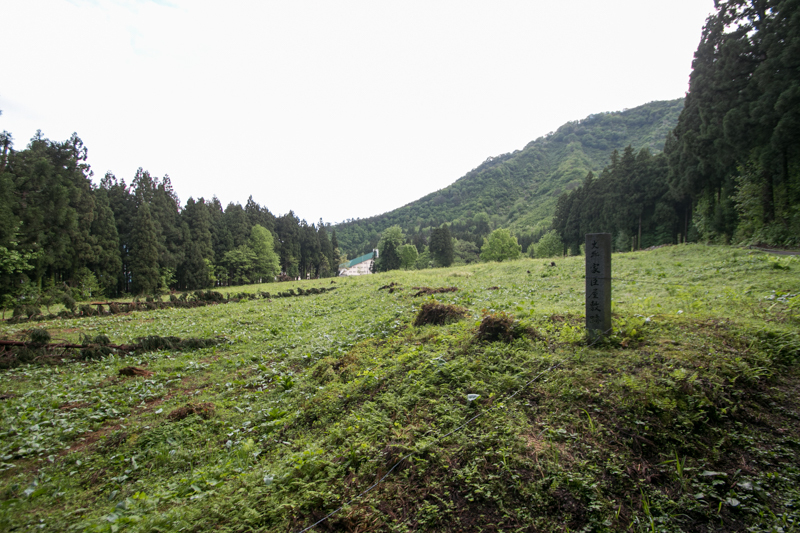 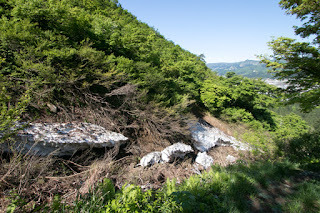 The south edge of Uonuma basin continues to the side of Tanigawadake mountain, a mountainous border separates Kanto plain and Niigata area. 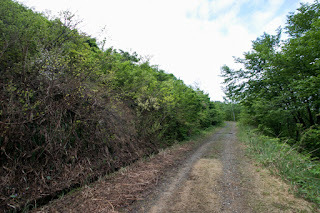 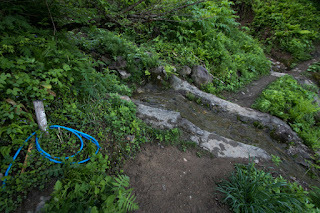 Mikunikaido road passes Uonuma basin and crosses Mikunitoge path had been an important road connecting Niigata area and Kanto plain, and now Kanetsu highway and Joetsu Shinkansen train still runs this basin. 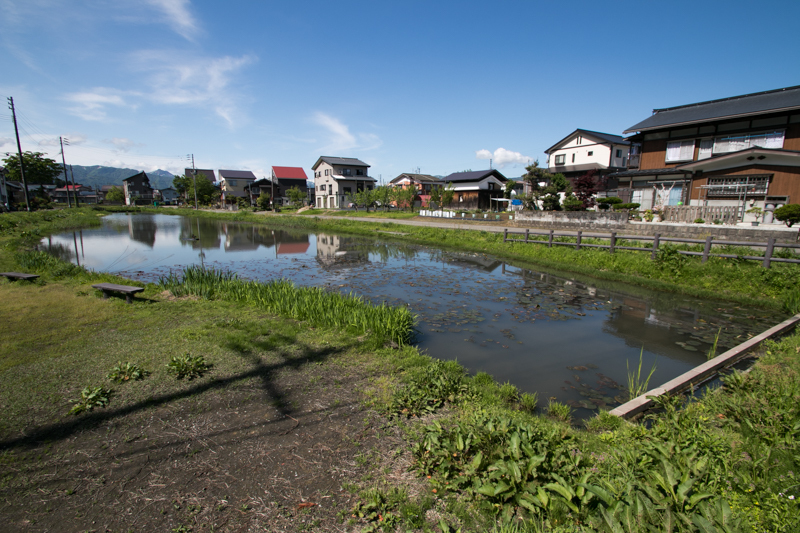 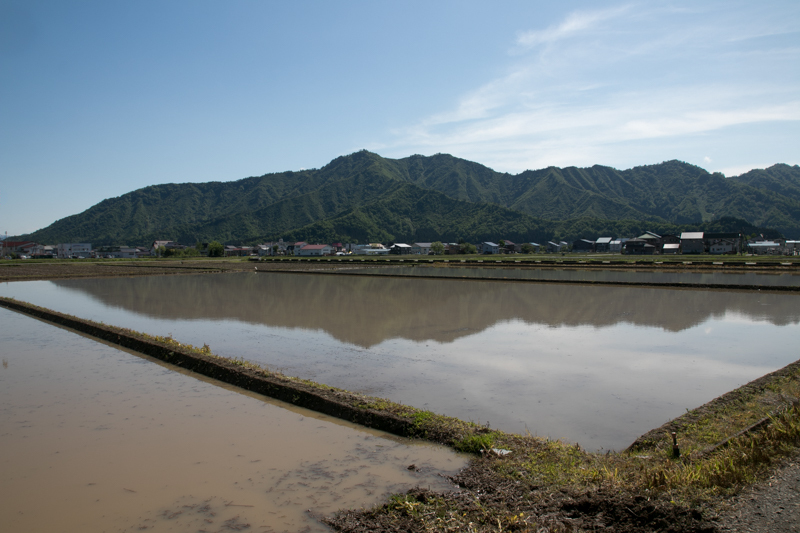 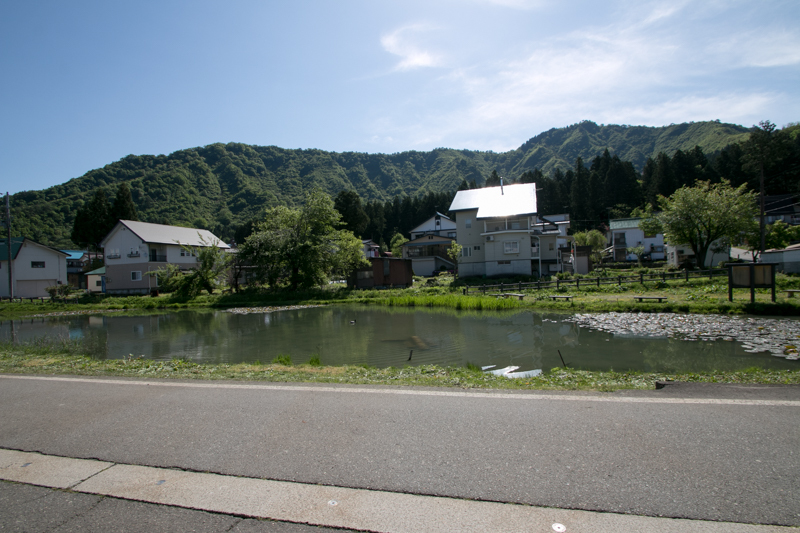 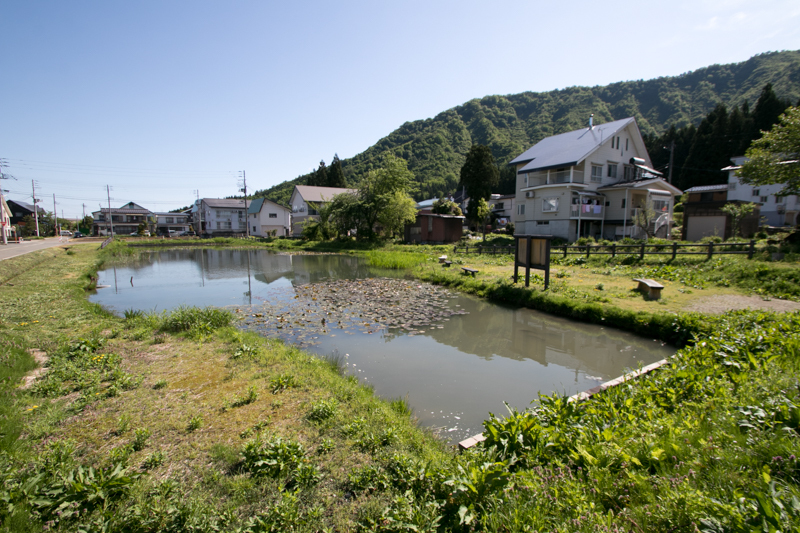 Utilizing its good soil and pure water, today Uonuma area is known for its high quality rice. 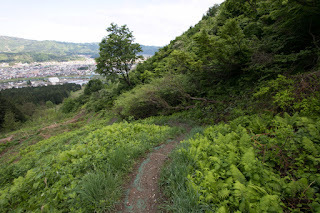 In Kamakura era, Echigo province (Niigata prefecture) was directly governed by Hojyo clan, a virtual leader of Kamakura Shogunate after extinguishment of Minamoto clan. After the fall of Kamakura Shogunate Echigo province was once held by Nitta clan which activated at anti Shoguate campaign under Emperor Godaigo (1288-1339), but after the establishment of Muromachi Shogunate, Uesugi clan which was the close relative of Takauji Ashikaga (1305-1358) who was the founder of Muromachi Shogunate, was appointed as the governor of Echigo province. 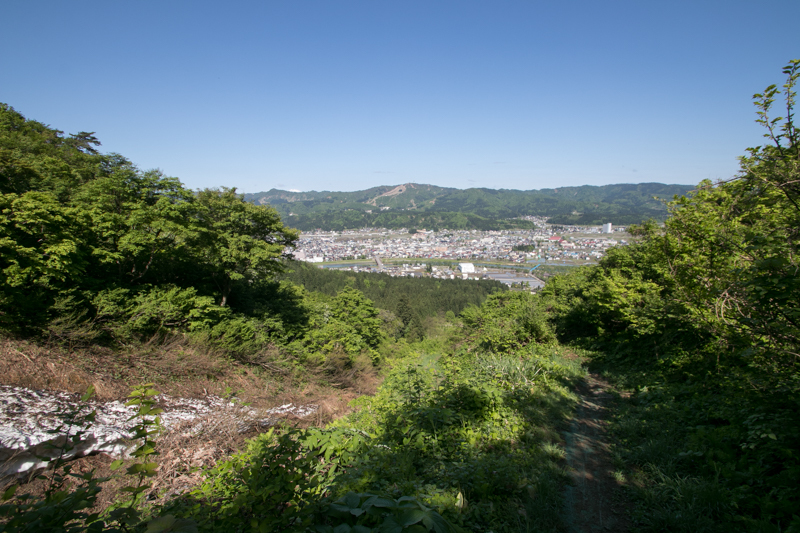 Uesugi clan took Nagao clan to Echigo province as a deputy governor. 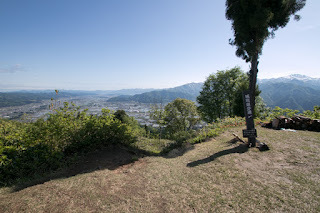 Nagao clan was originally a descendant of Taira clan, and once almost lost their territory by an political conflict under Kamakura Shogunate then served to Uesugi clan. 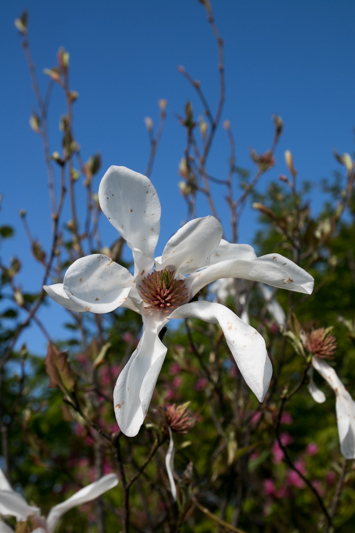 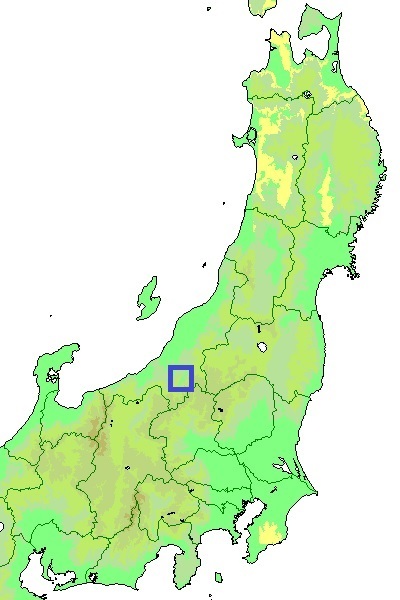 In the latter half of 14th century, Nagao clan separated into three houses, it mean Fuchu Nagao clan at current Jyoetsu city, Koshi Nagao clan at current Nagaoka area, and Ueda Nagao clan resided at Uonuma basin. 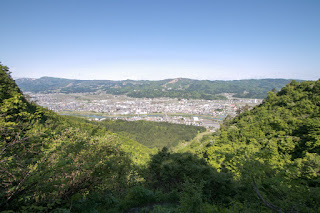 As Joetsu area was the capital of Echigo province at that area, Fuchu Nagao clan became the highest position and succeeded deputy governor position. 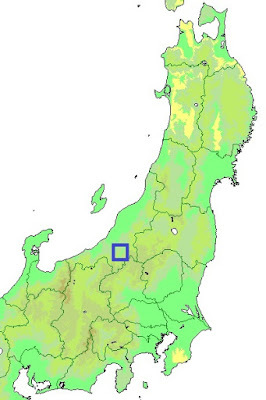 Ueda Nagao clan and Koshi Nagao clan governed middle part of Echigo province under Fuchu Nagao clan. 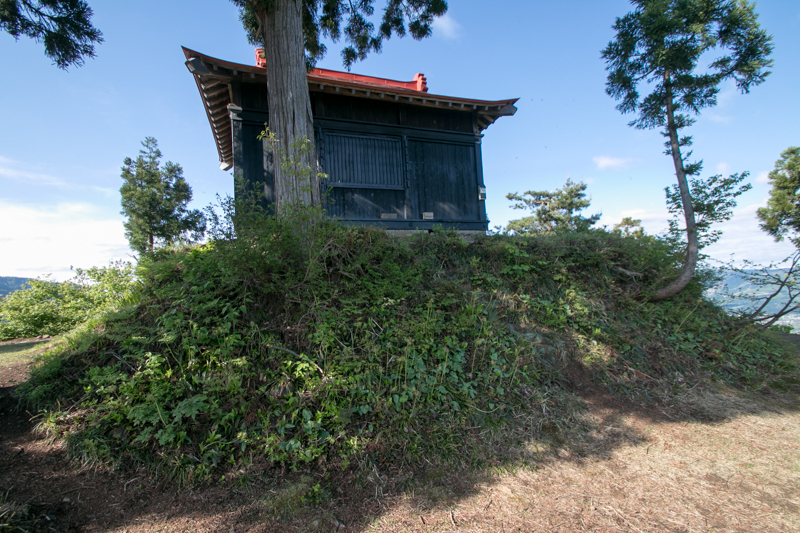 Considering its location small castle might have already existed, but Ueda Nagao clan built Sakado castle in earnest and used it as their residence. 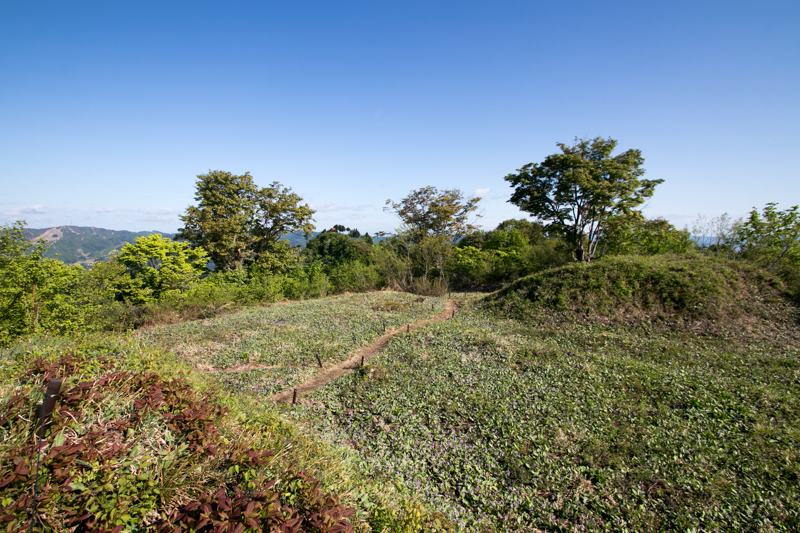 Sakado castle consist of many narrow flat terraces spread over the ridges continues toward north, southeast and southwest from its peak. 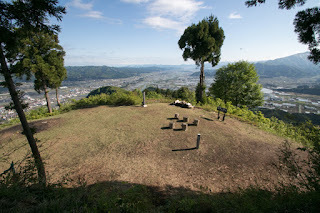 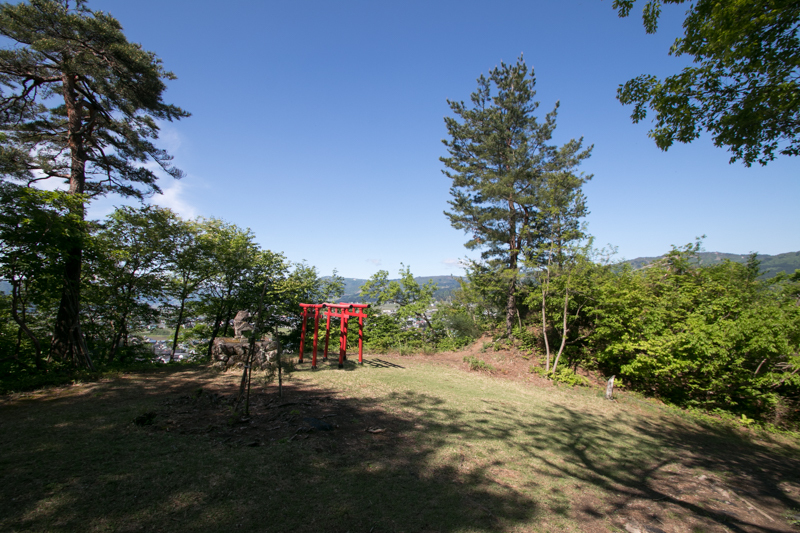 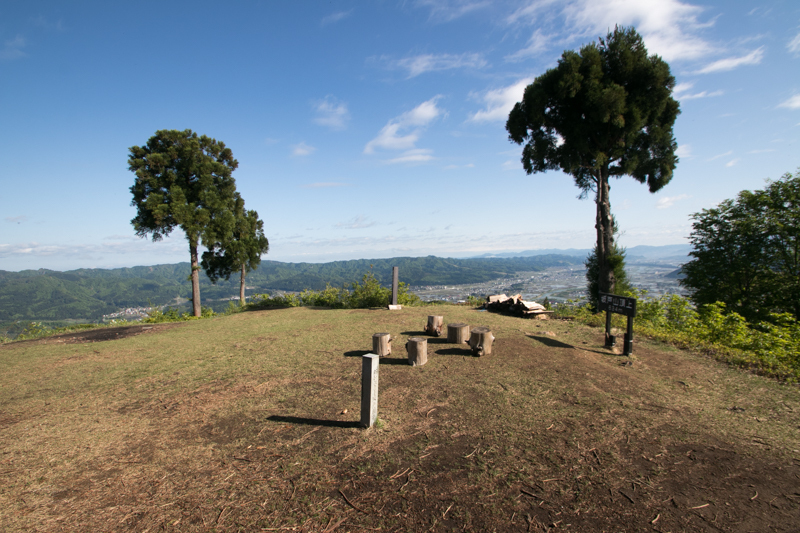 Central area called as Mujyo is a round shaped area of 20 meter diameter, and now used as a ground of shrine. 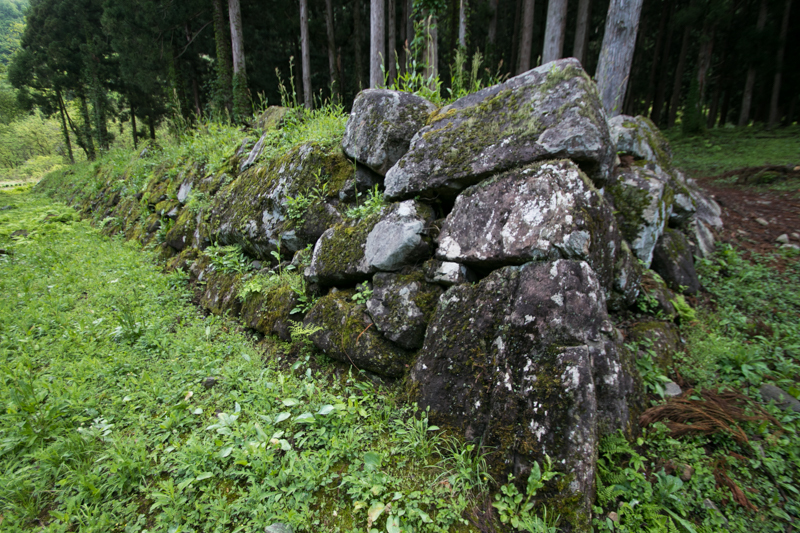 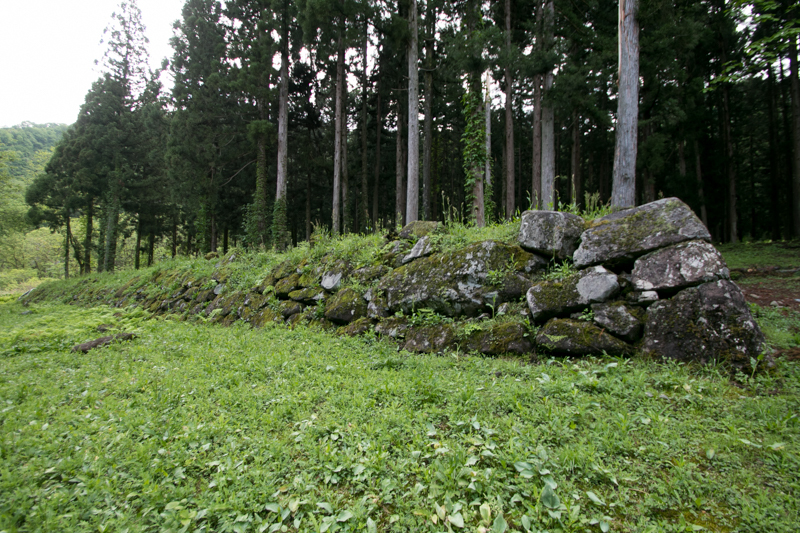 Several large terraces are built surrounding this main area, and later stone walls were added under Hori clan at the entrance to these core area. 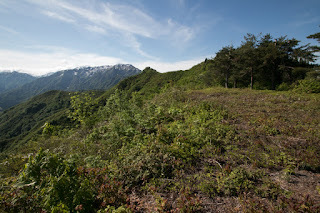 Ahead of the curved ridge continues toward southeast ward, three is an another peak almost same height as the main peak, and a skinny ridge over 100 meter long connects these two peak. 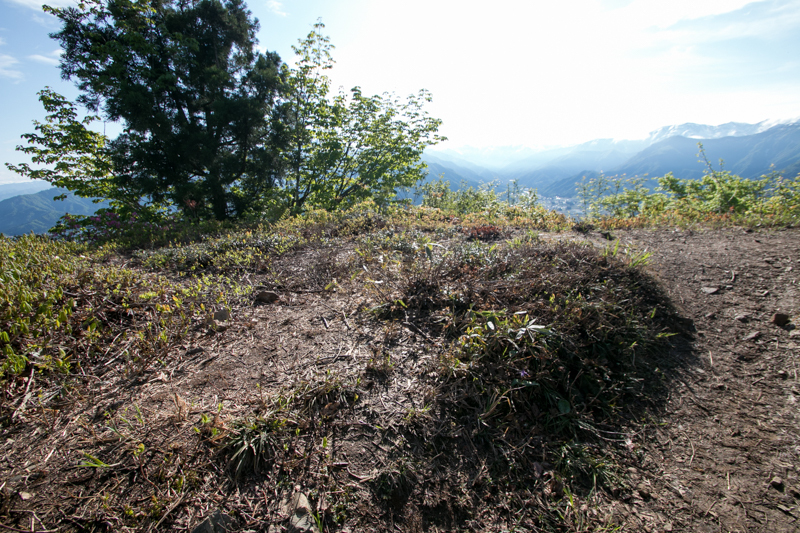 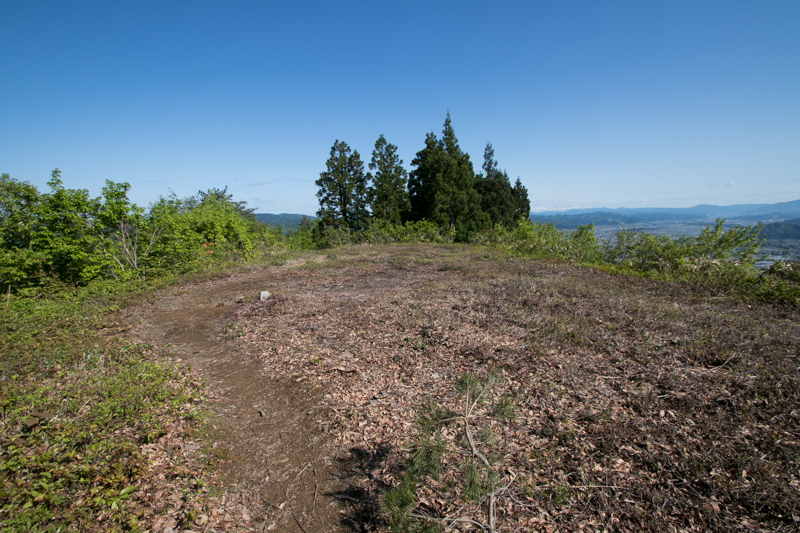 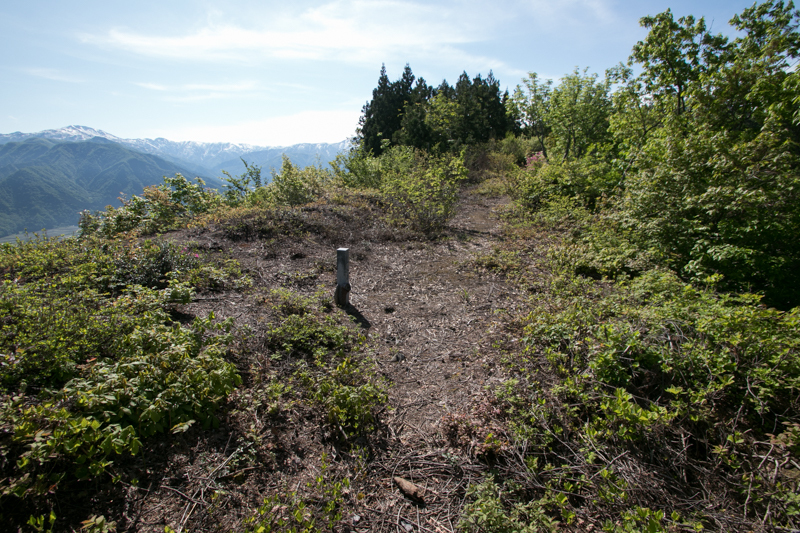 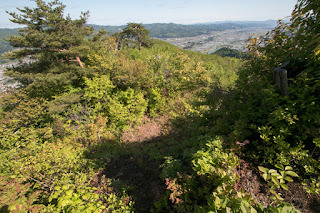 On the top of this another peak there is another large flat area called as Ojiro, and a shaped watchtower basement still remains. 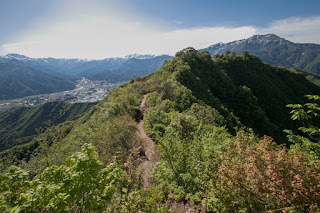 A curved skinny ridge connecting two sheer peaks looks like a suspension bridge in the sky and is quite breathtaking view. 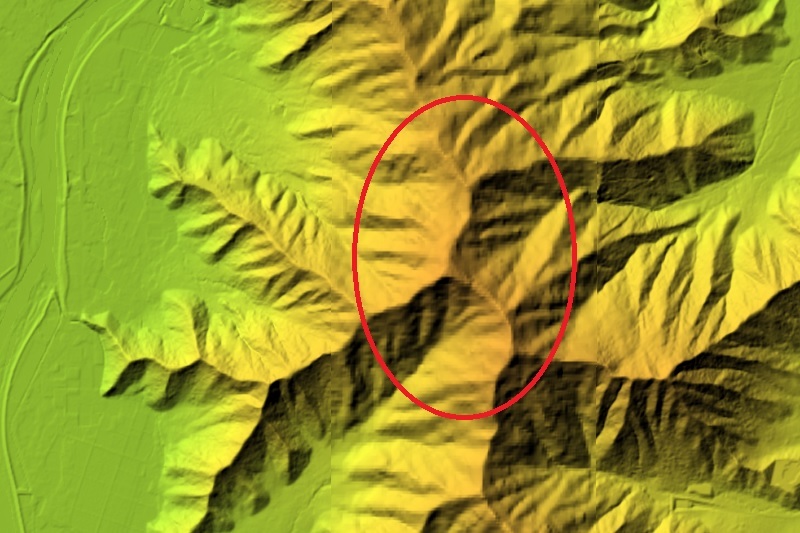 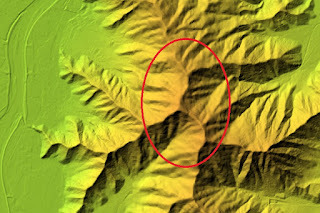 At the north of core areas there is a layer of flat terraces spreads over the slope, and another line of narrow flat terraces continues over 200 meter. 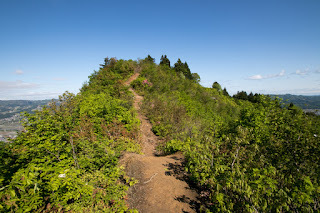 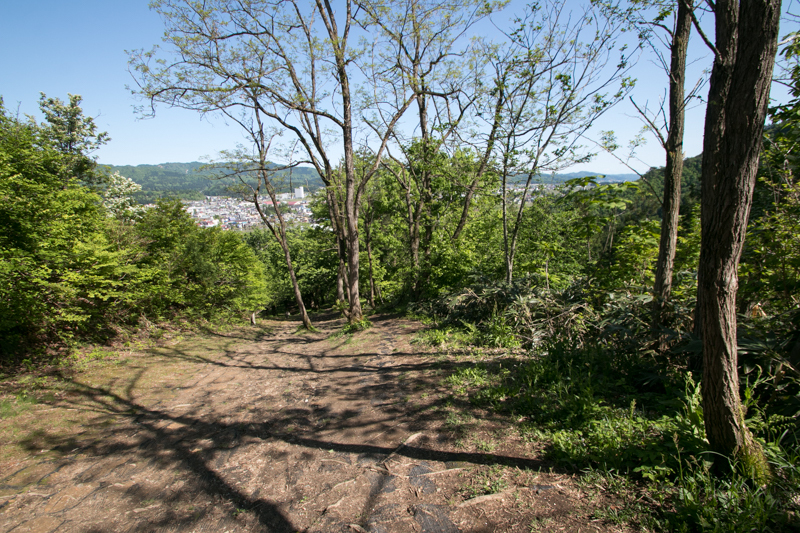 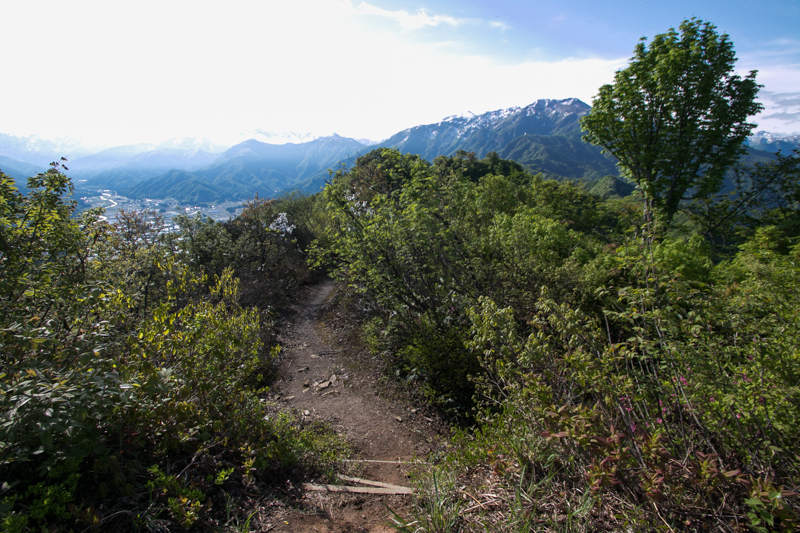 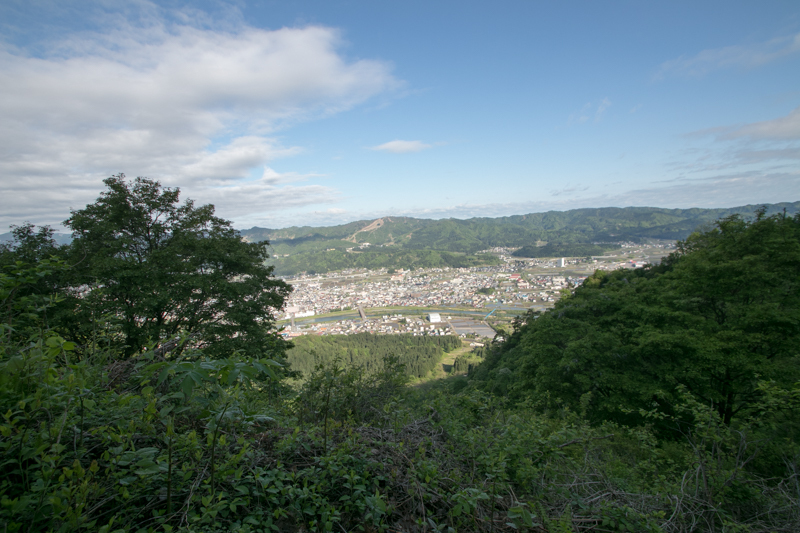 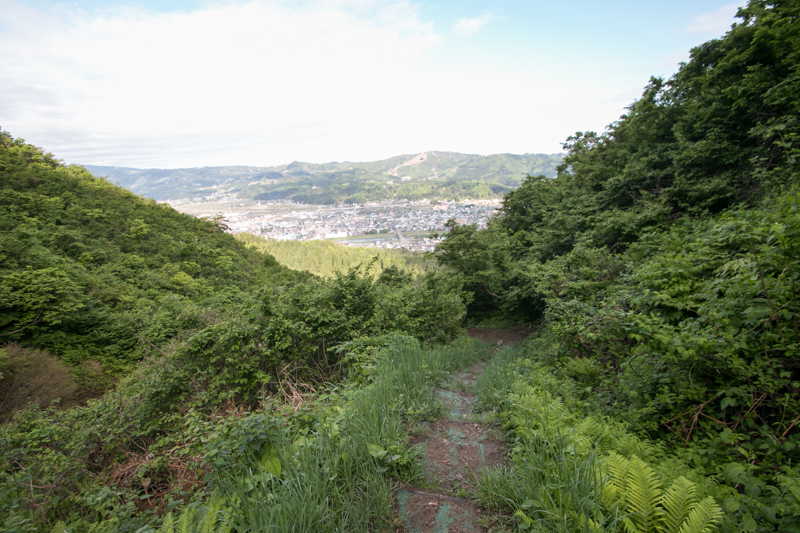 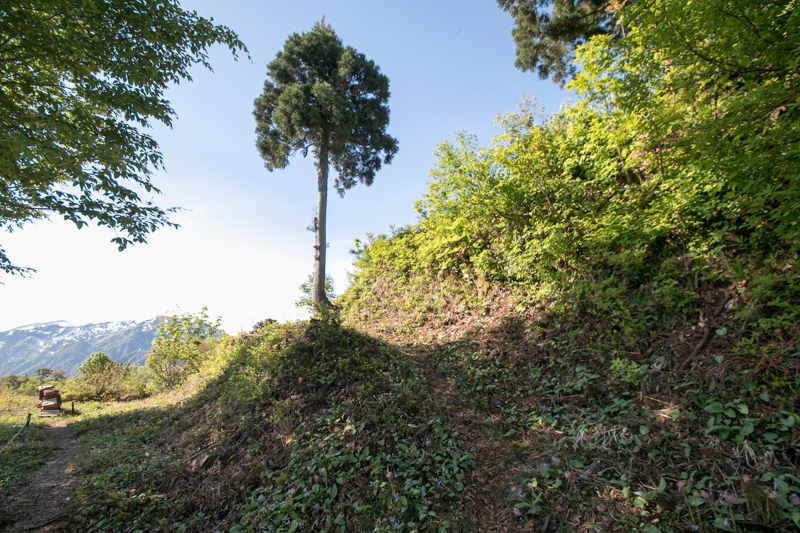 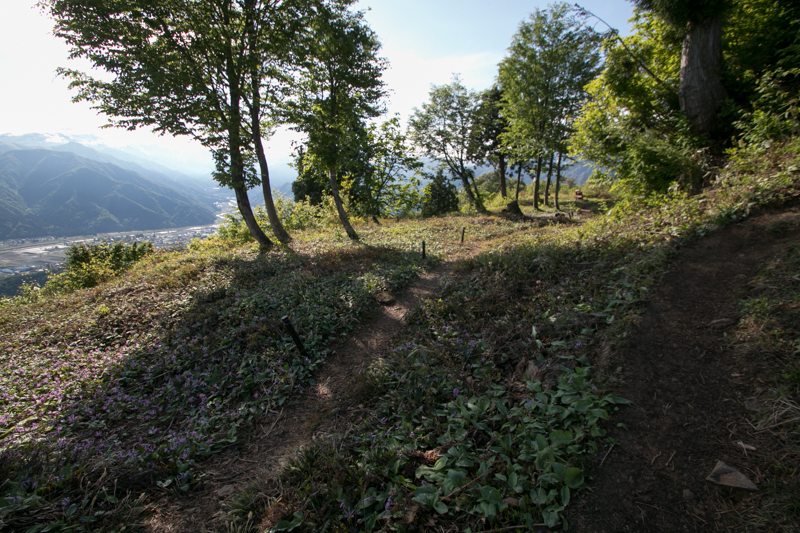 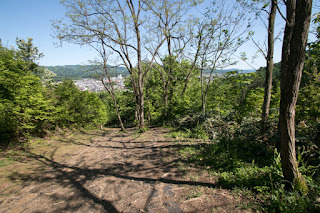 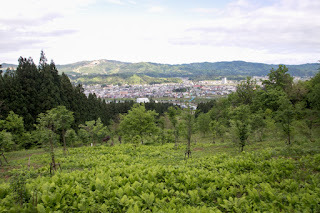 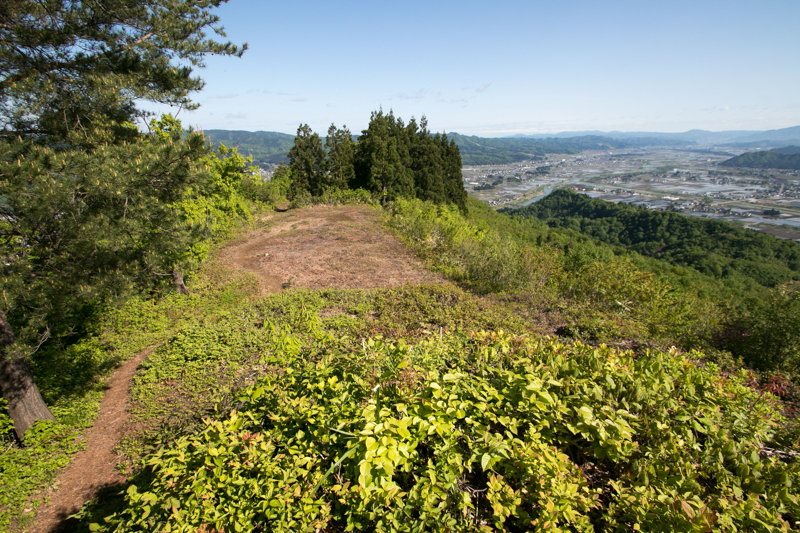 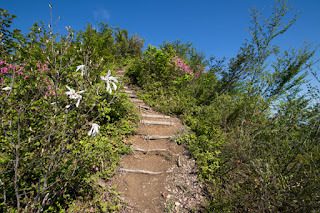 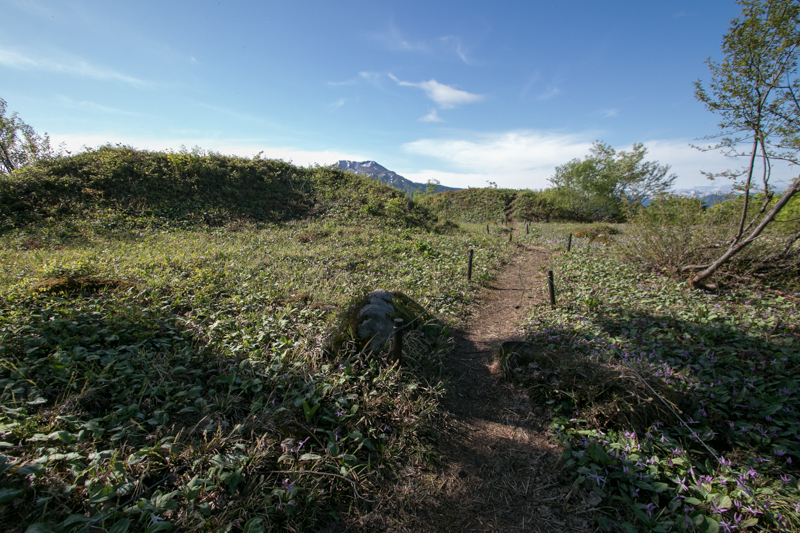 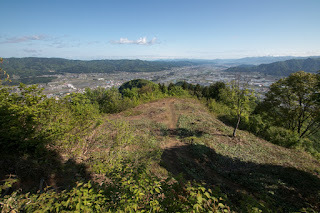 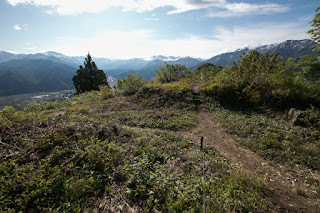 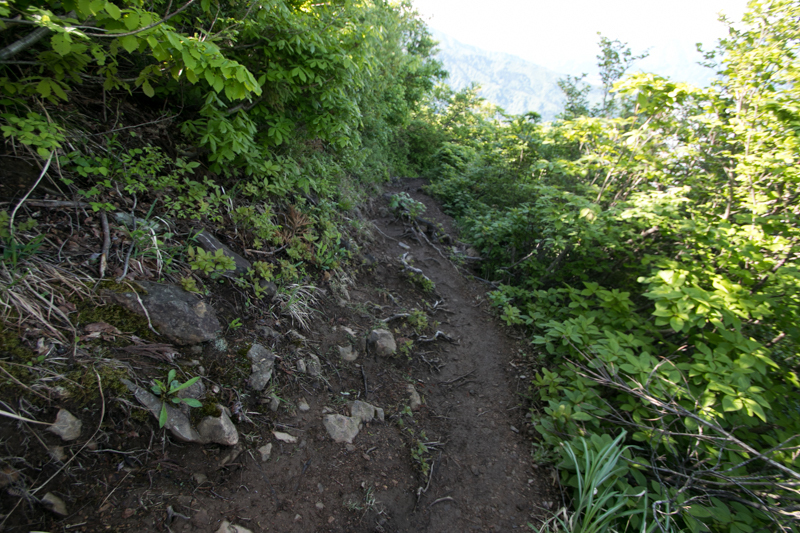 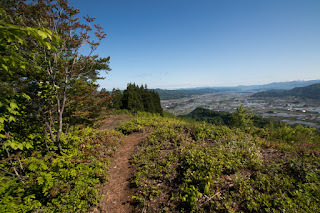 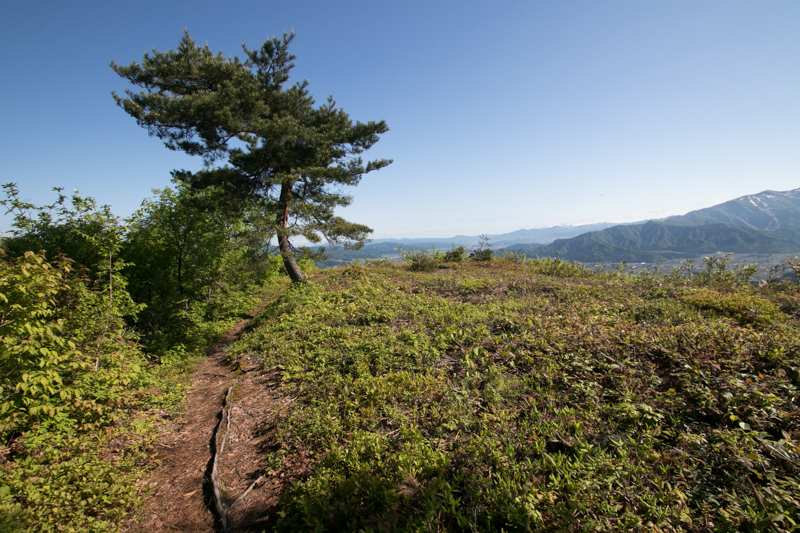 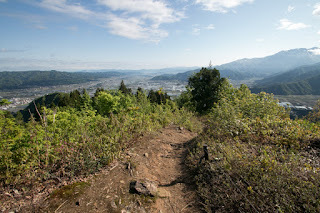 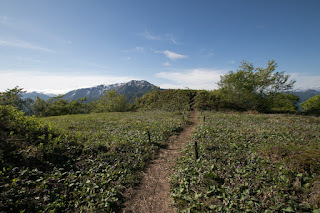 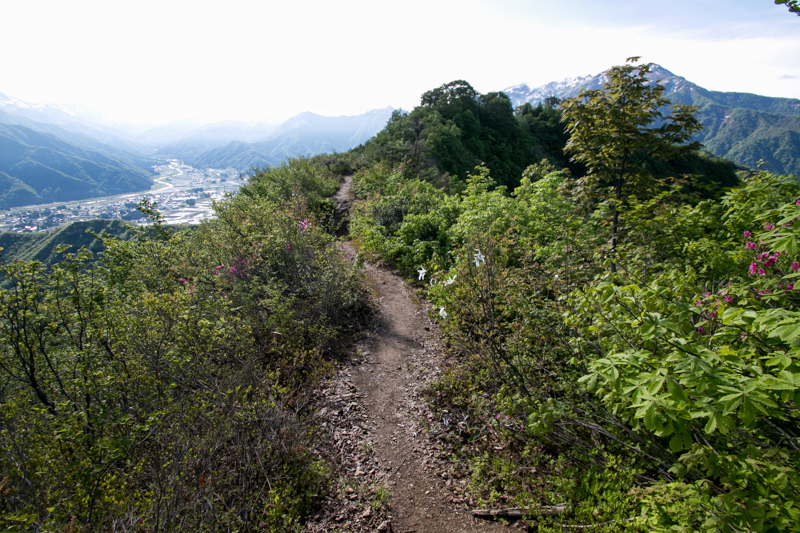 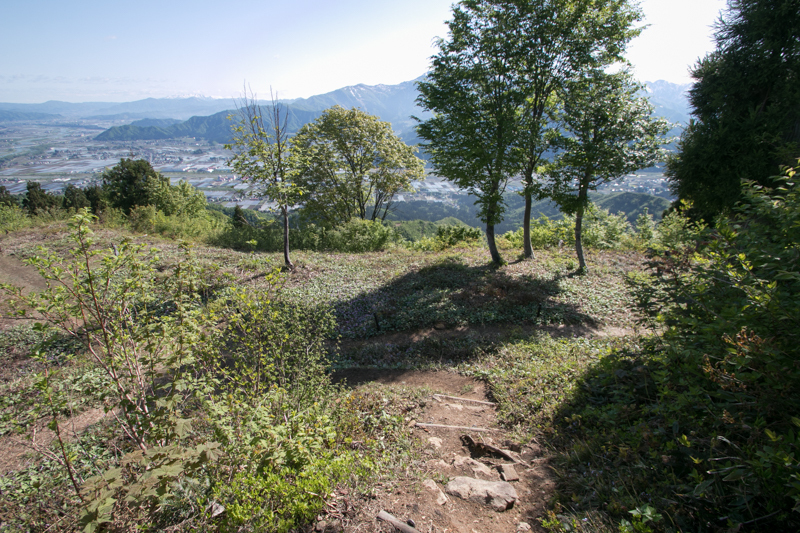 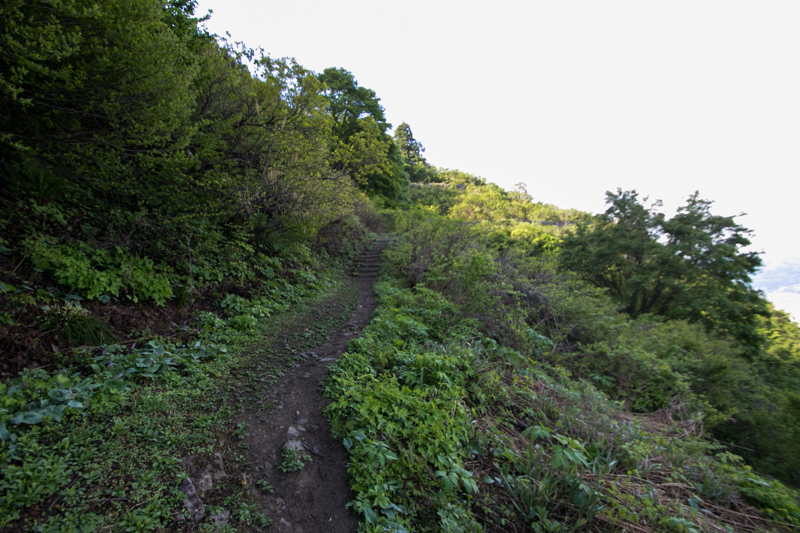 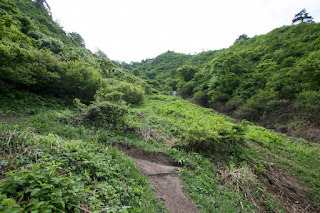 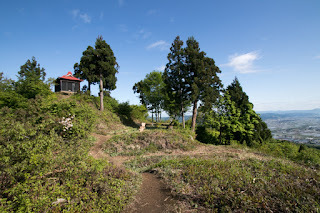 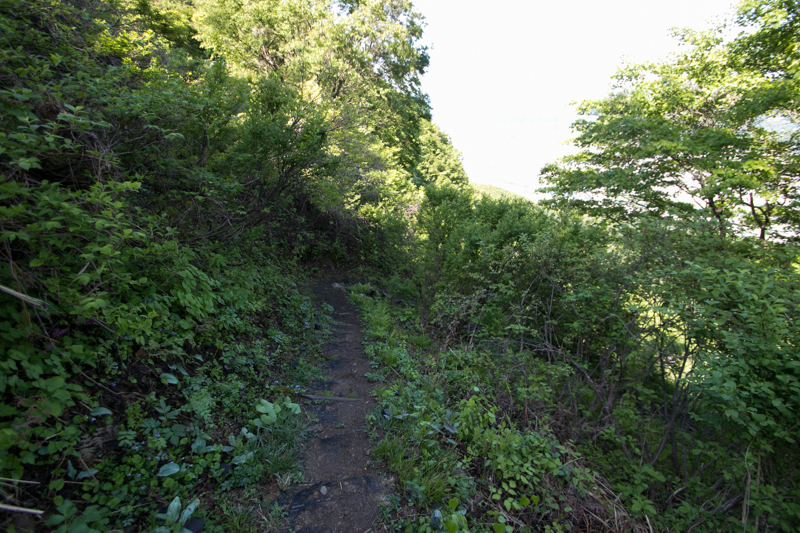 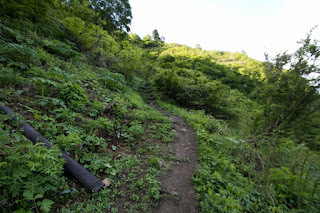 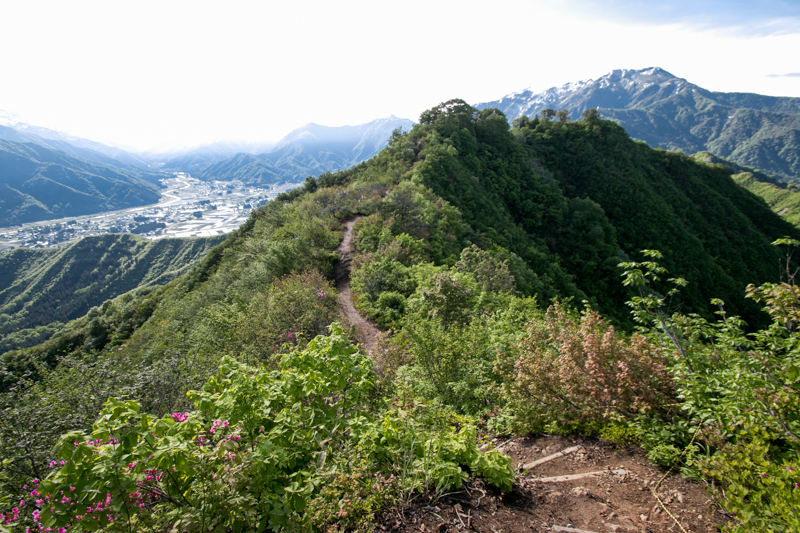 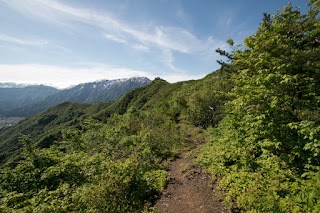 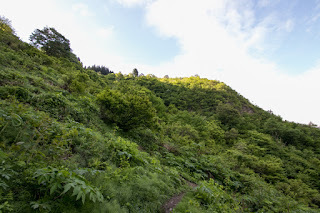 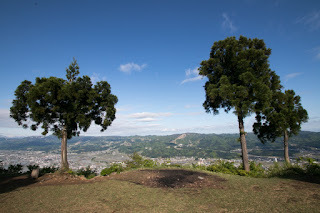 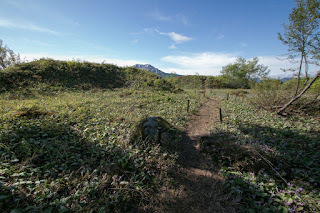 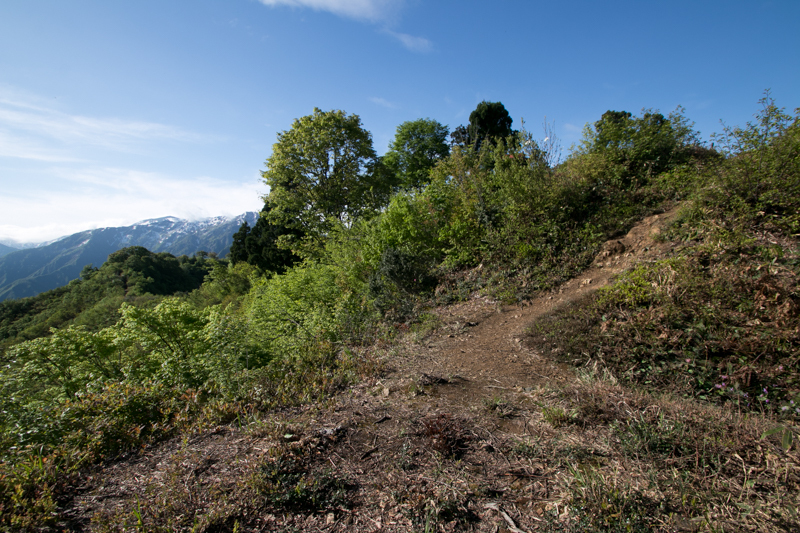 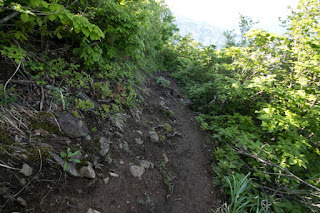 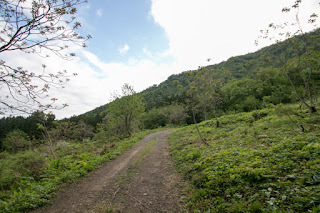 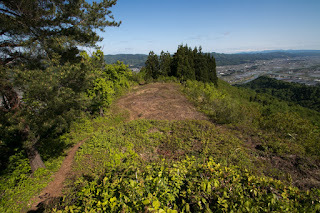 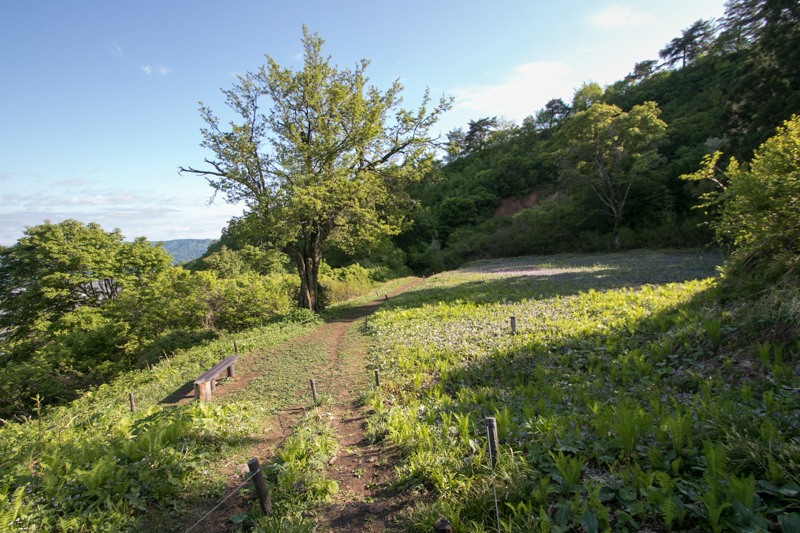 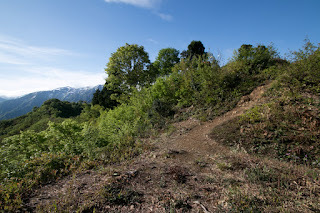 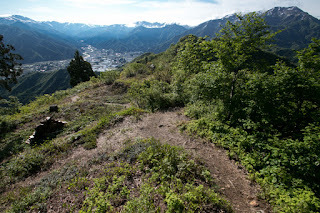 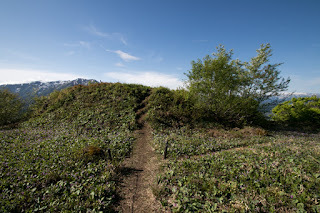 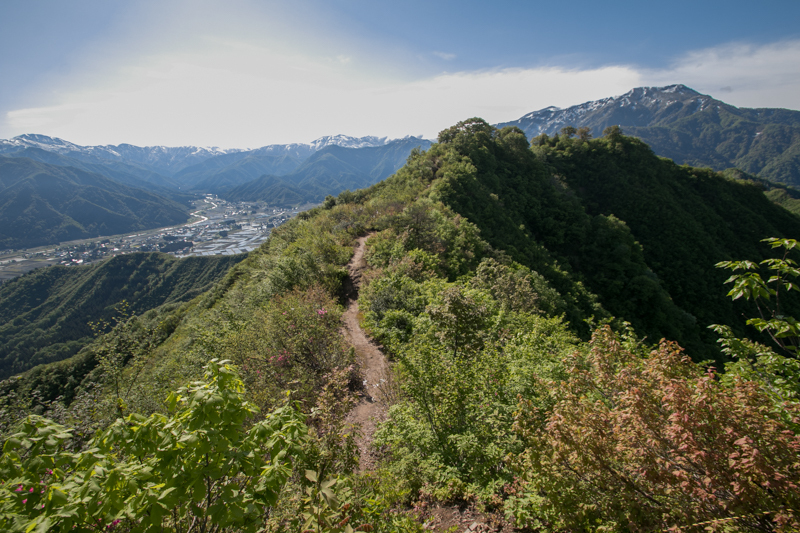 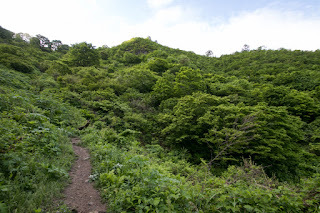 As Sakadoyama mountain is an independent mountain and whole part of hilltop area is protected by sheer cliff, Sakado castle consists of just flat lands separated by dry wall but had an excellent ability of defense. 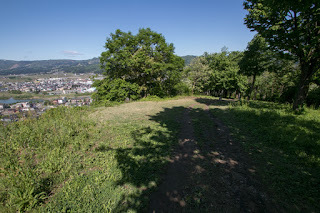 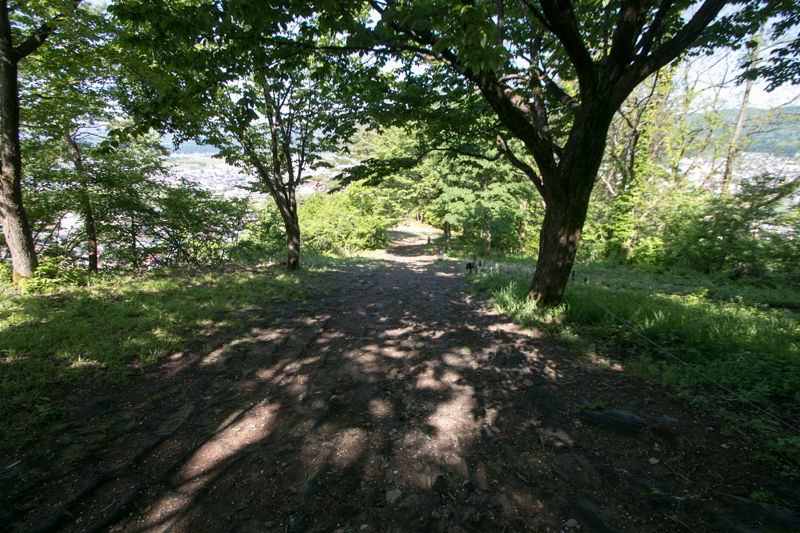 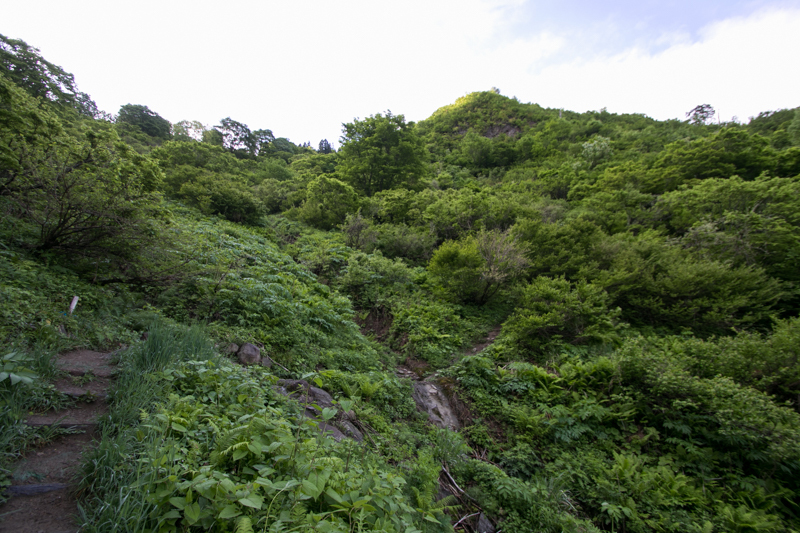 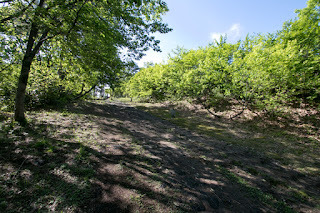 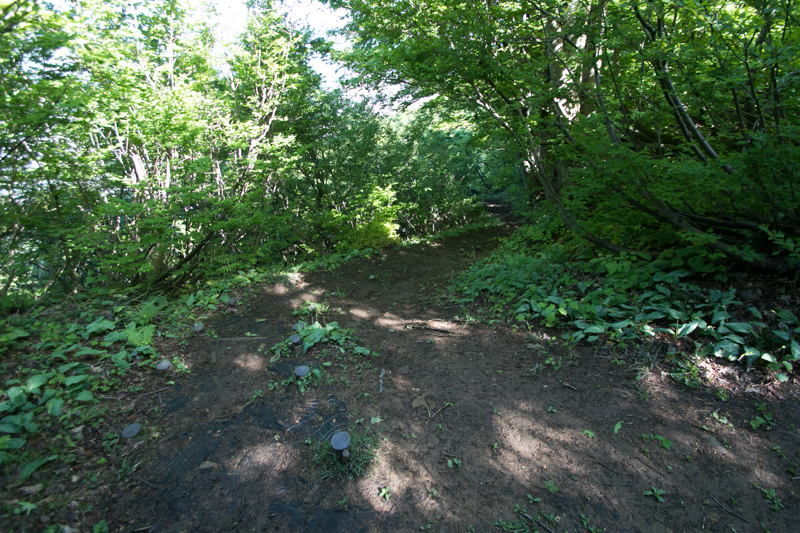 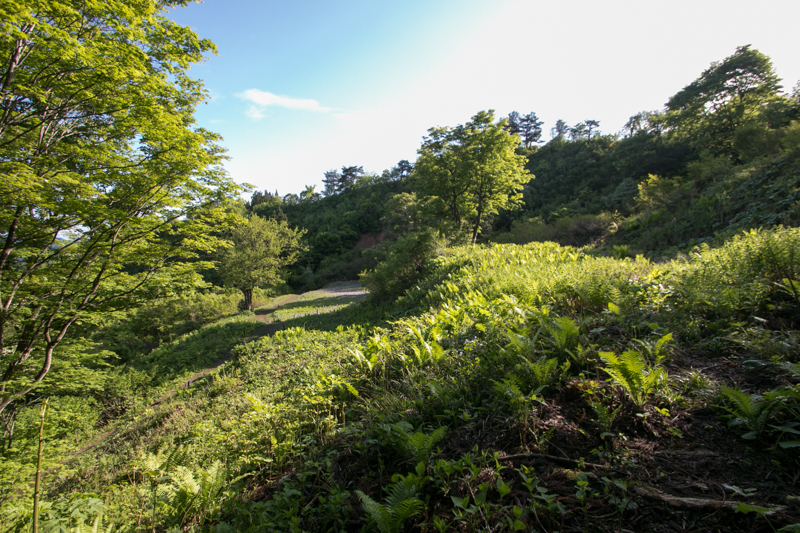 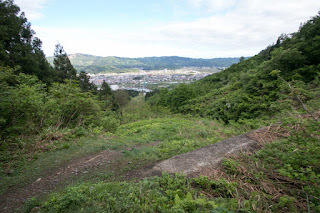 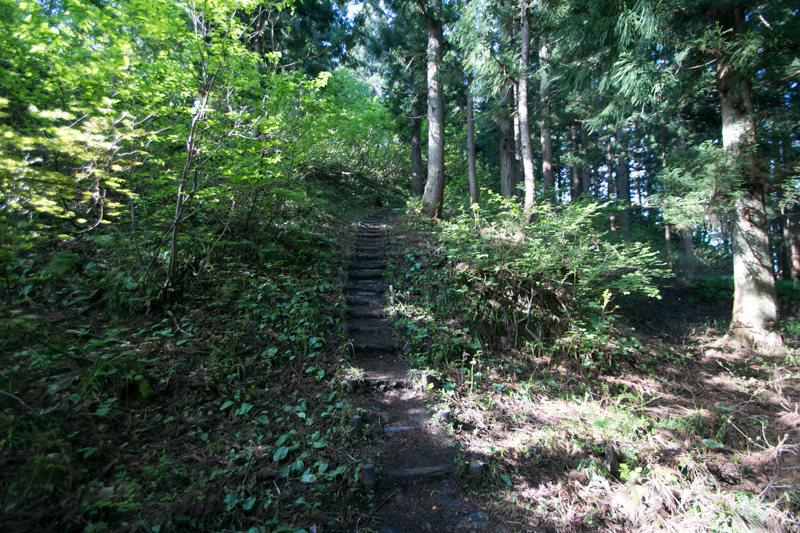 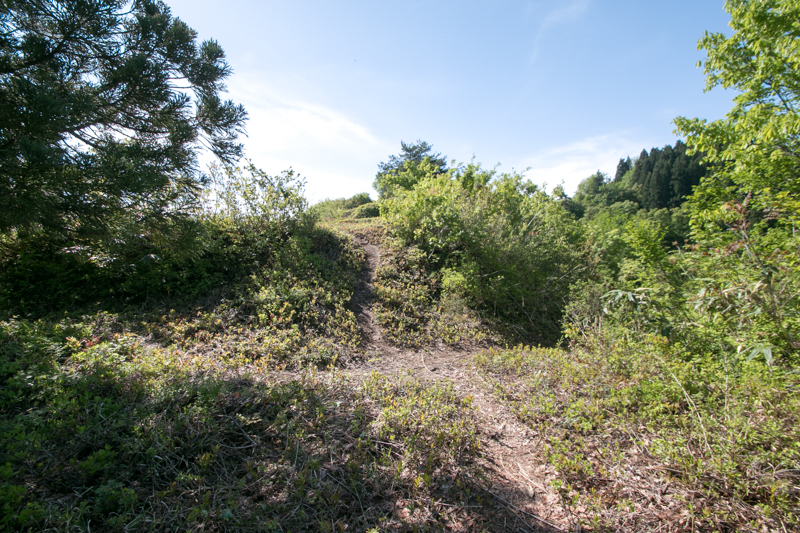 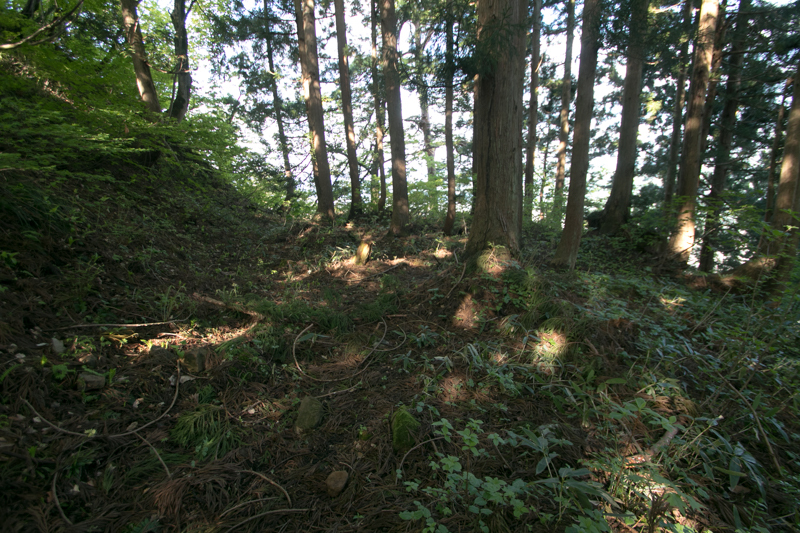 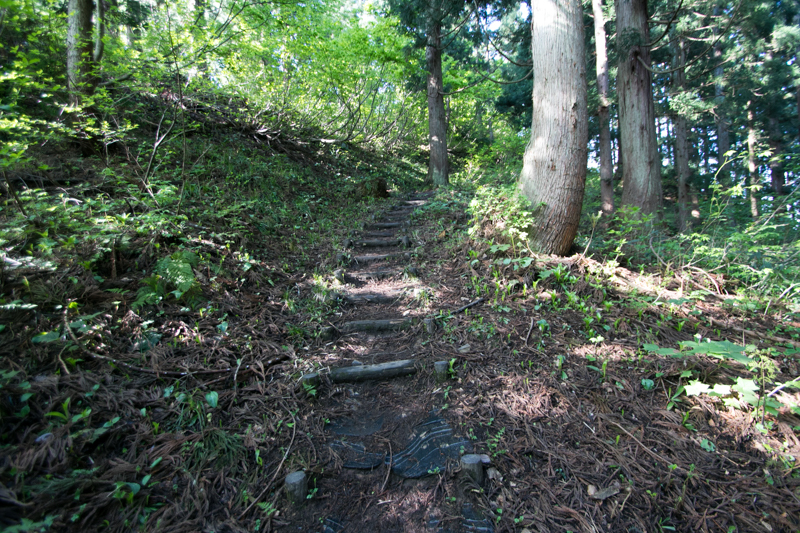 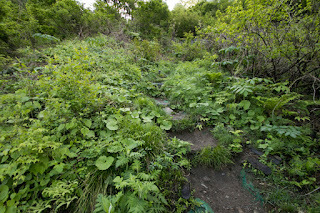 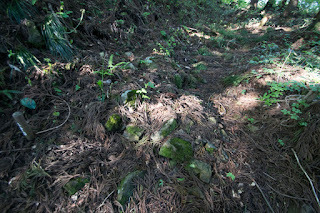 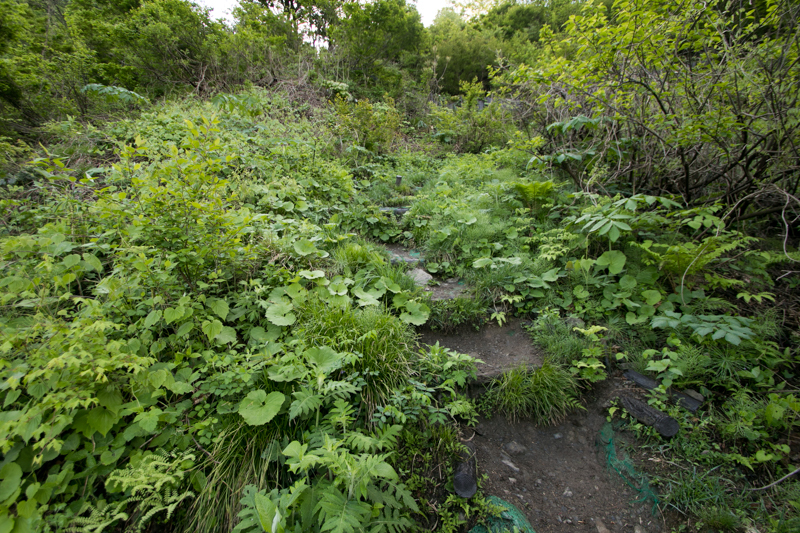 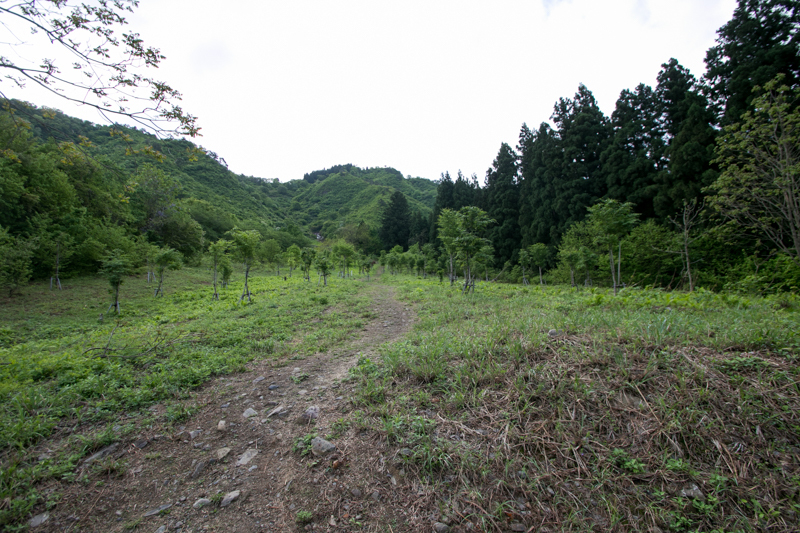 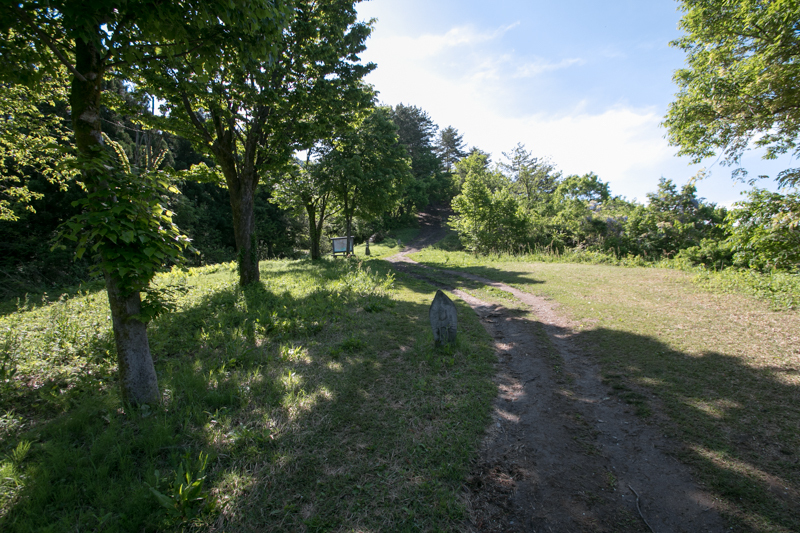 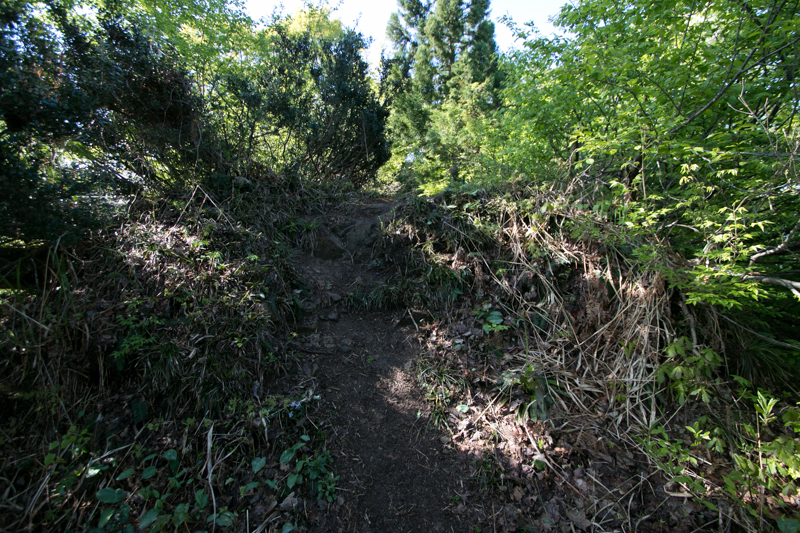 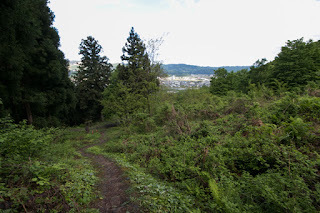 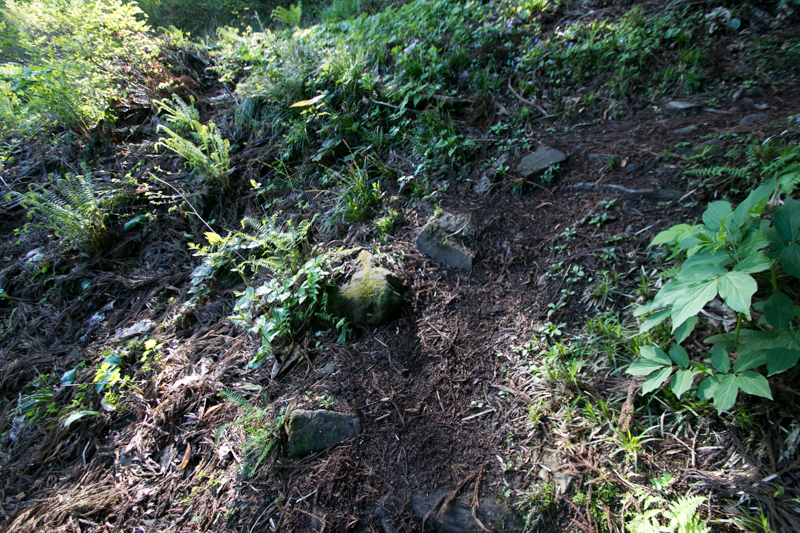 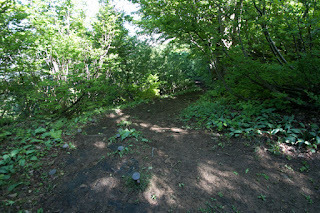 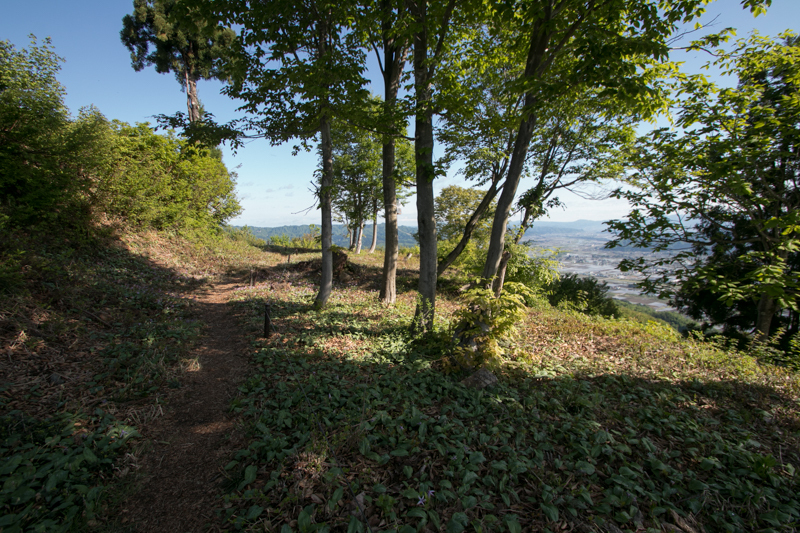 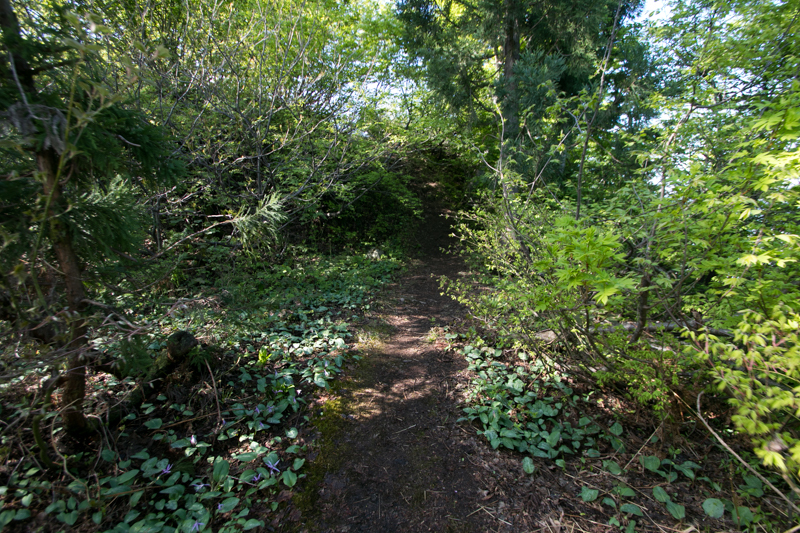 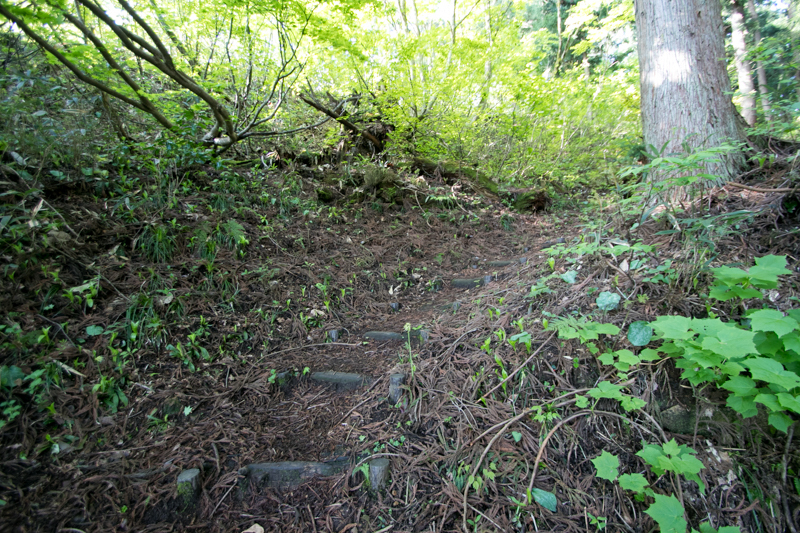 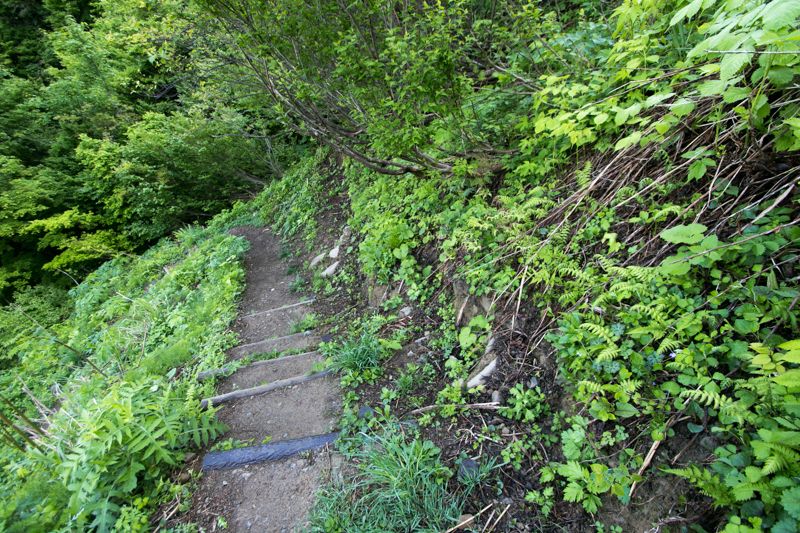 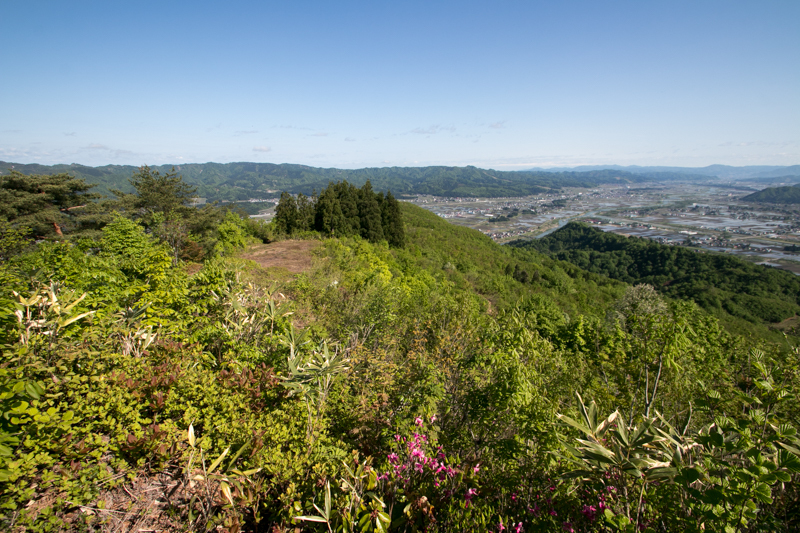 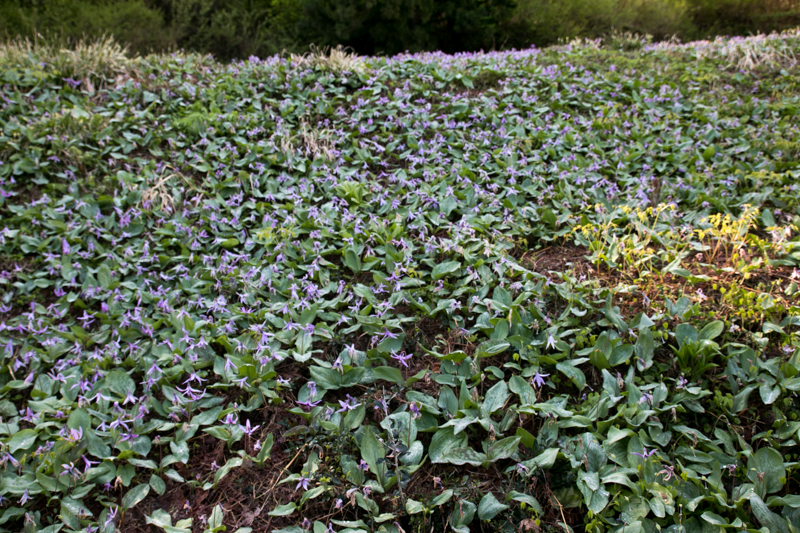 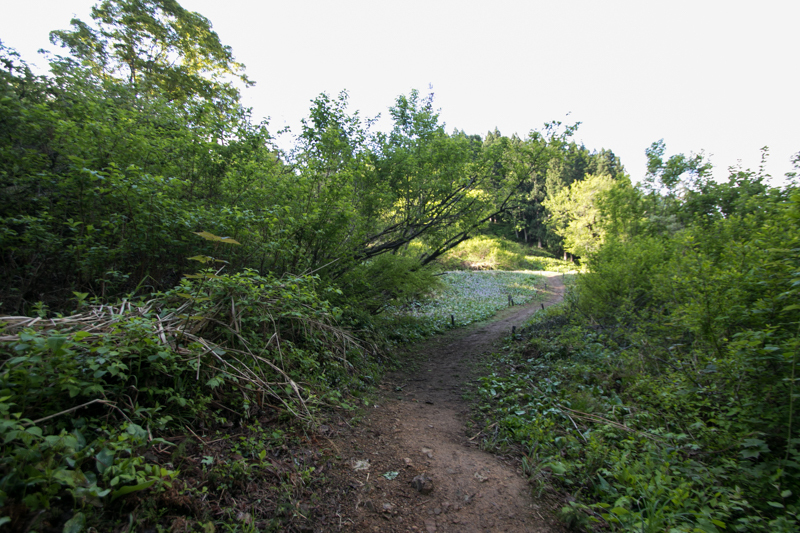 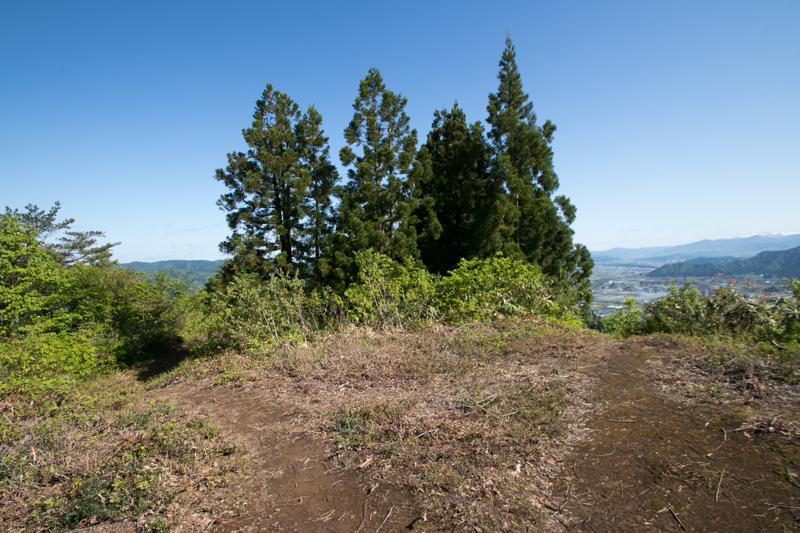 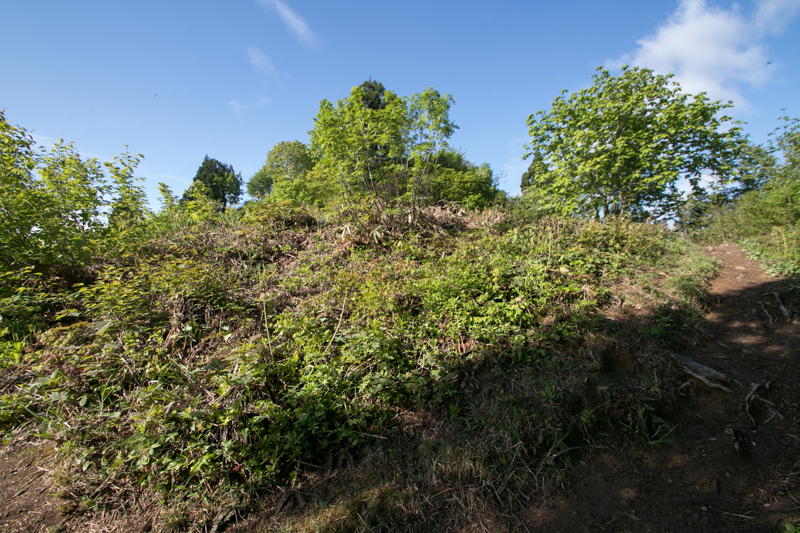 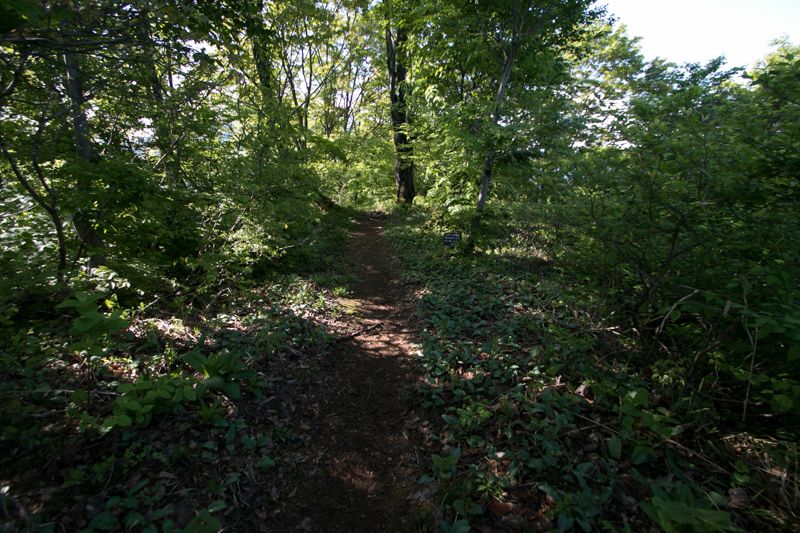 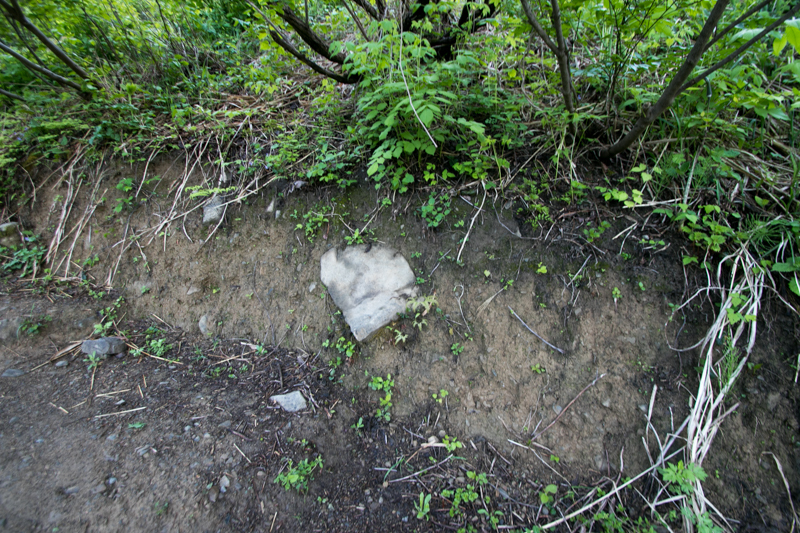 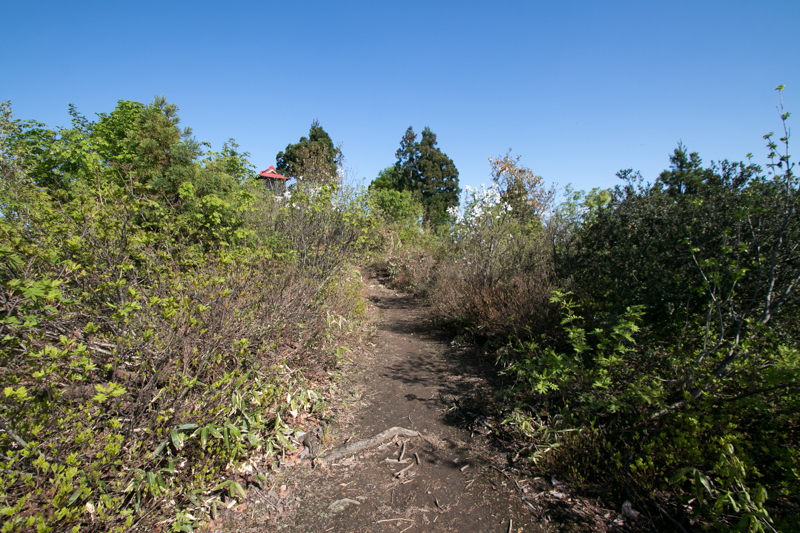 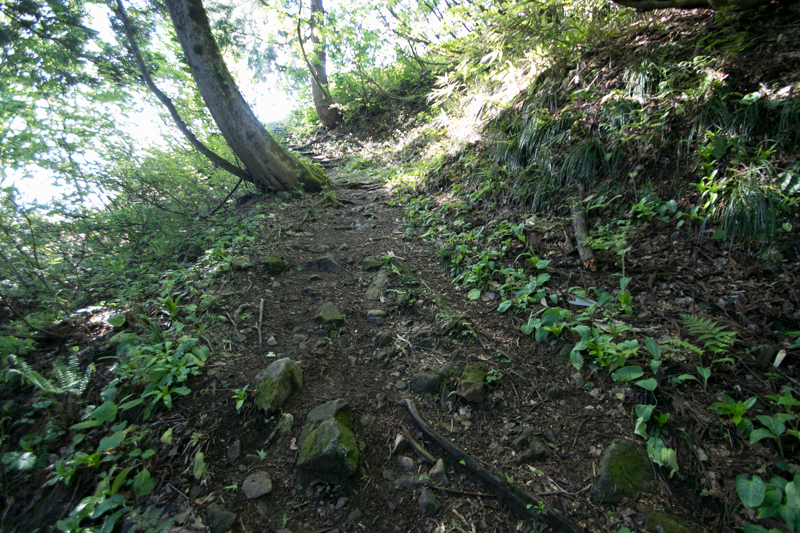 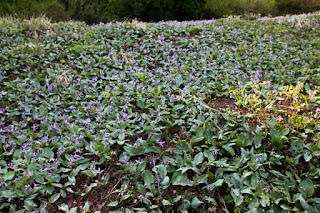 Residence of the lord and castle town existed at the western hillside between the mountain and Uonogawa river. 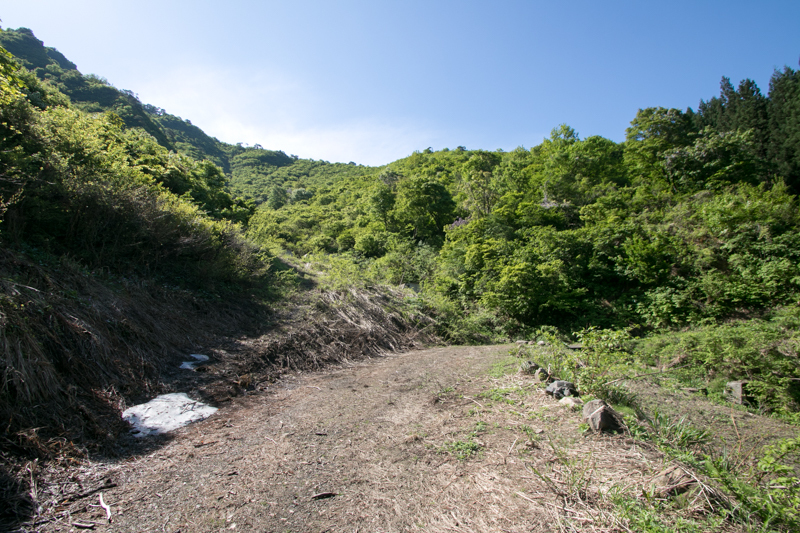 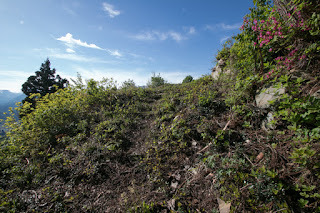 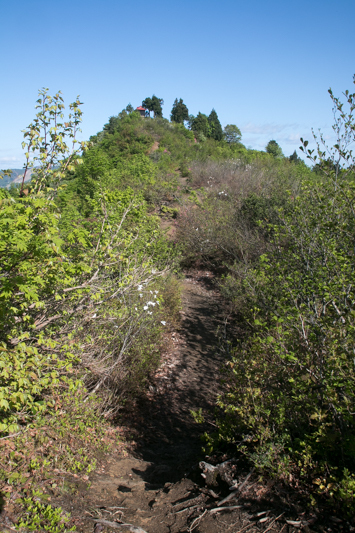 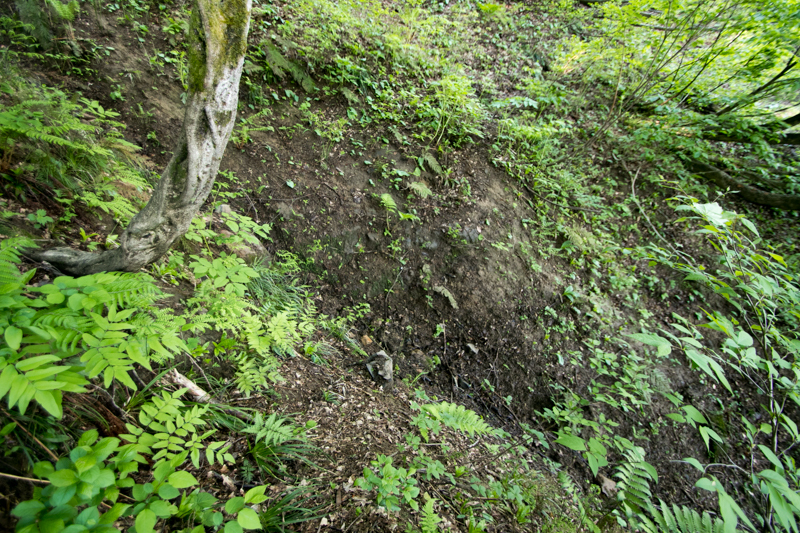 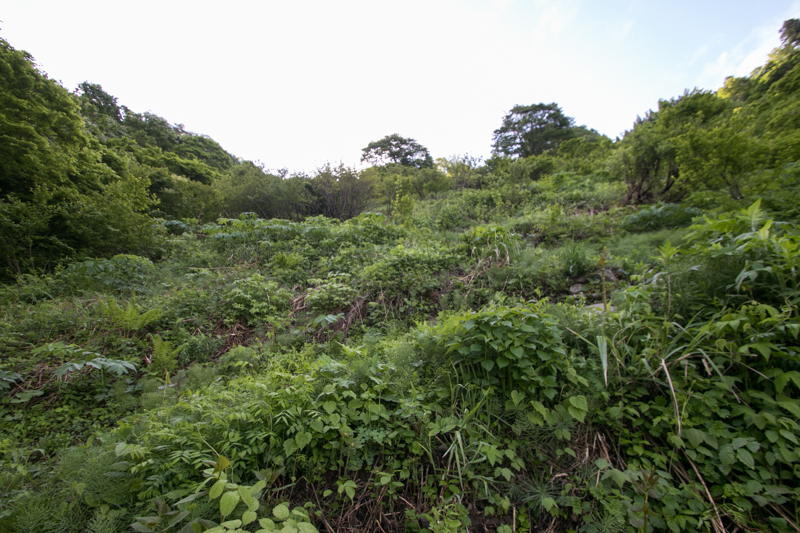 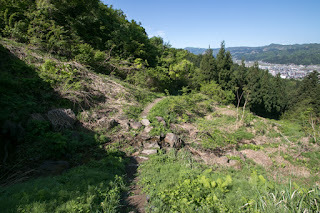 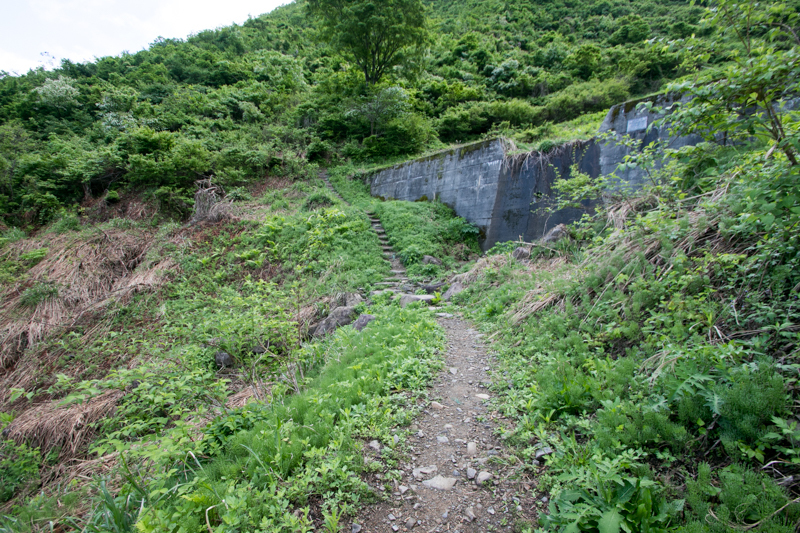 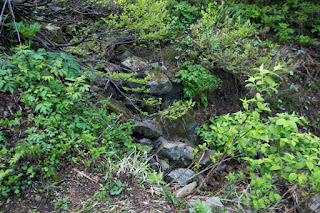 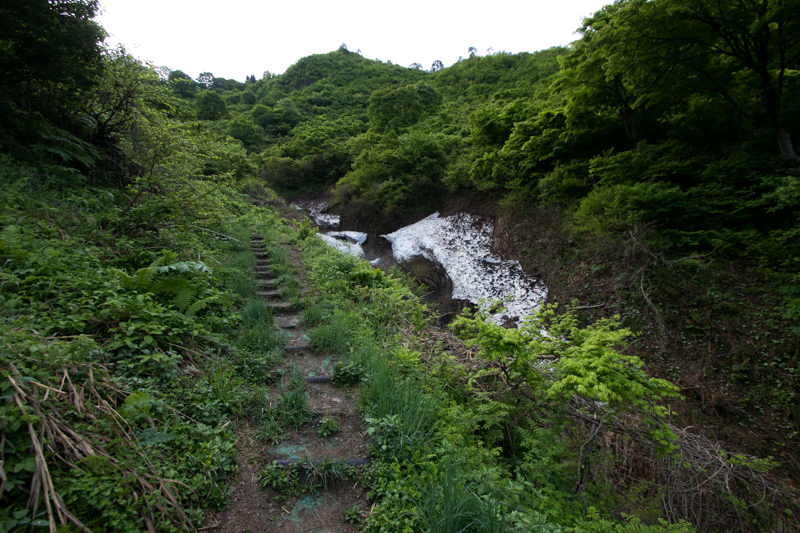 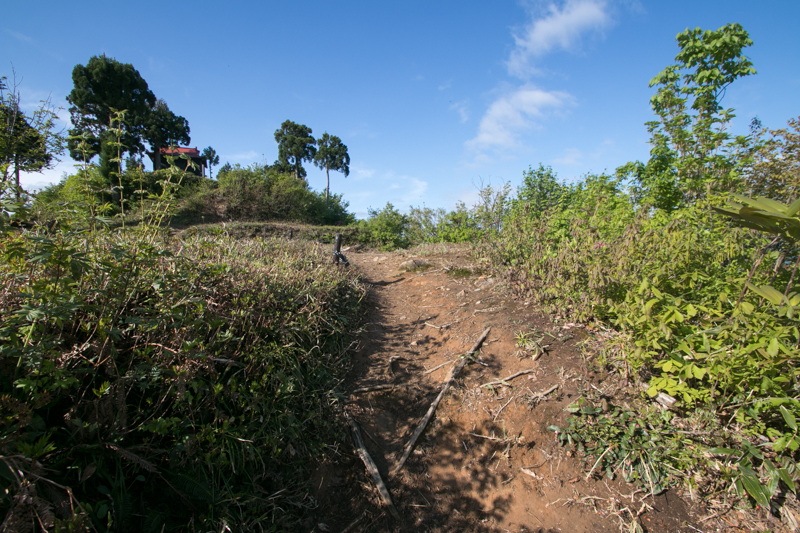 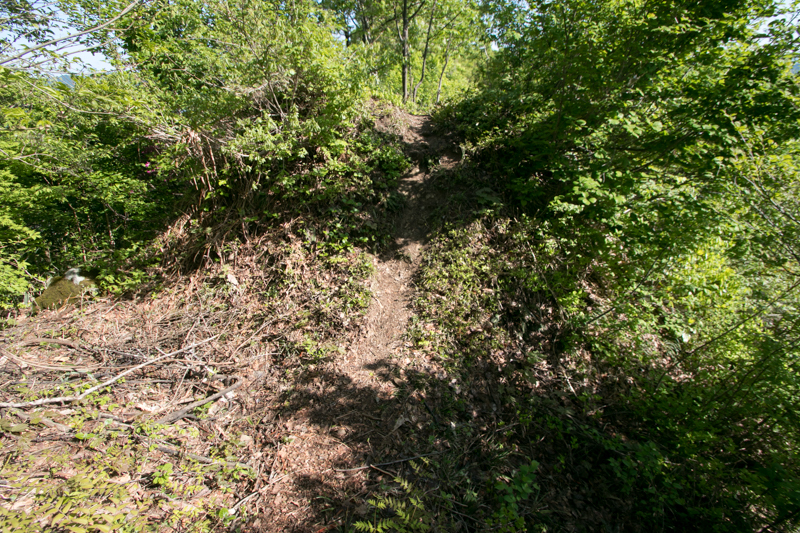 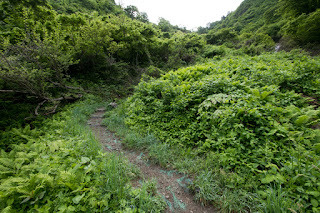 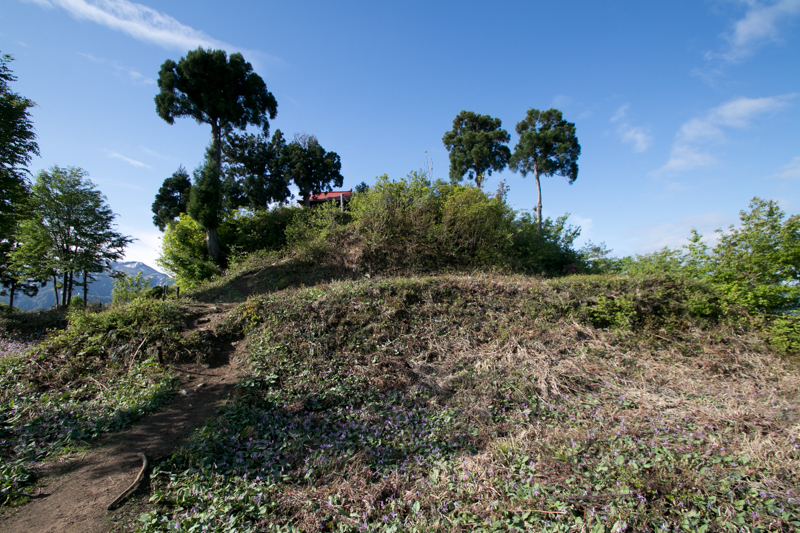 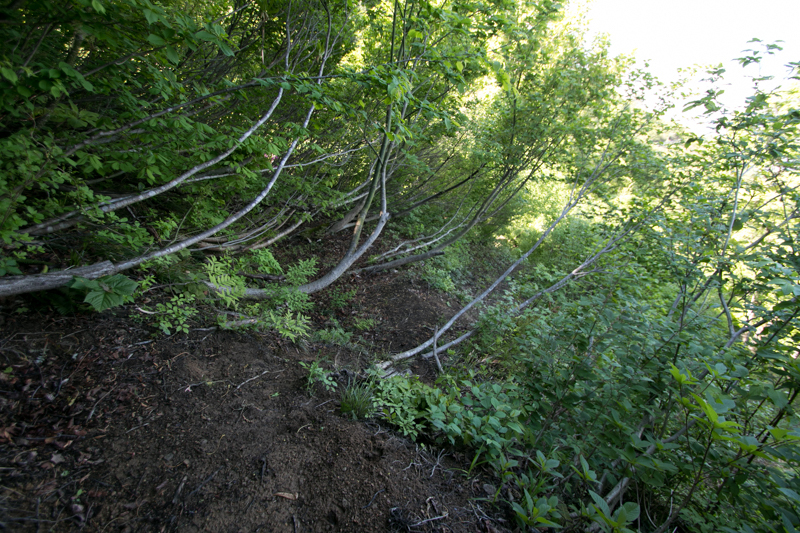 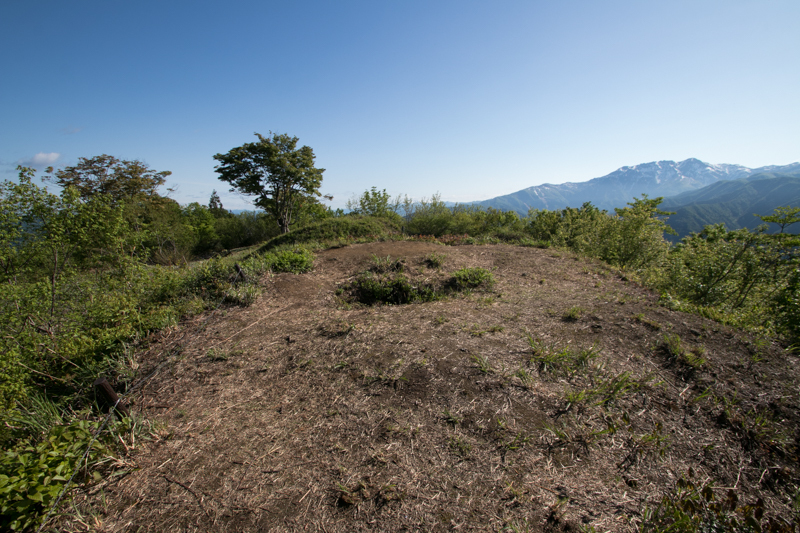 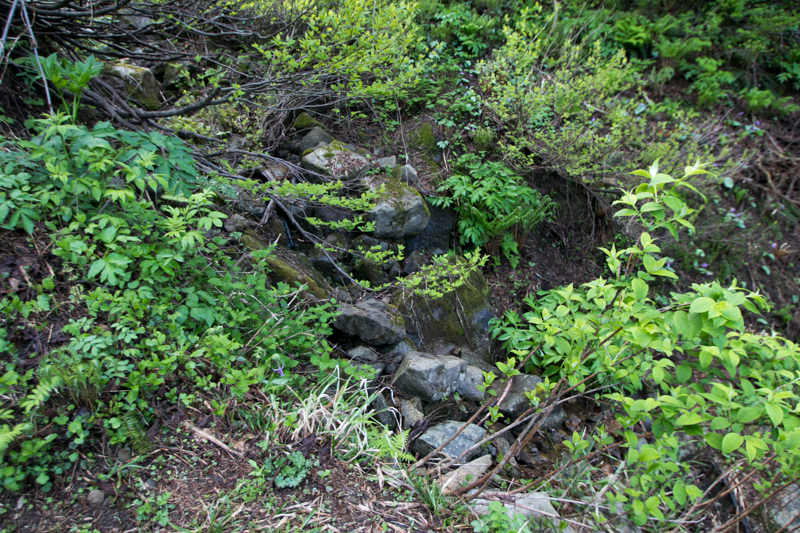 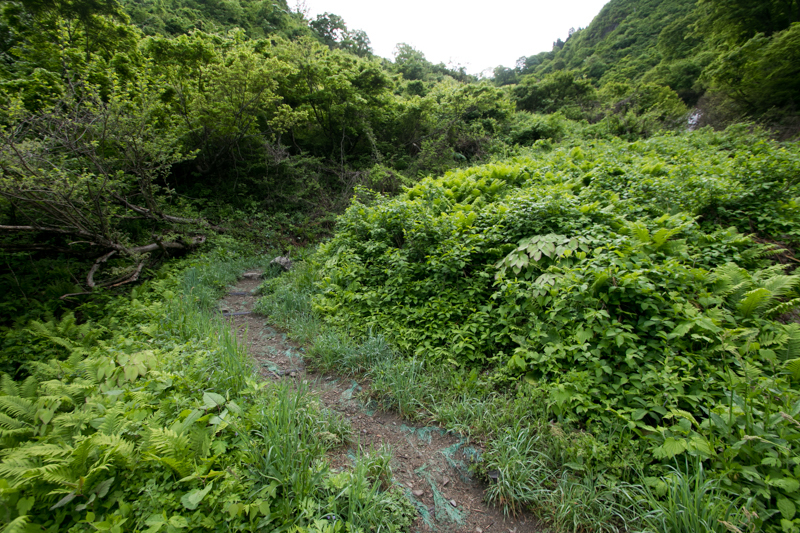 Ruin of water moat in front of hillside area still remain in front of the mountain. 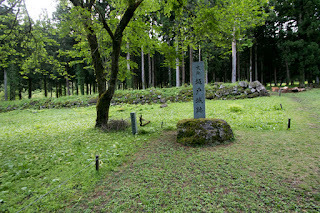 Uesugi clan was nominated as Kanto Kanrei, the general governor of Kanto region from Muromachi Shogunate, and exercised its power throughout the region. 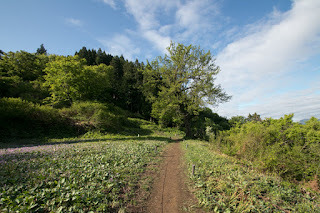 But continuous conflict in 15th century weakened the power and authority of Uesugi clan, and in 1507, Tamekage Nagao (1489-1543), the leader of Fuchu Nagao clan, defeated the governor of Uesugi clan and succeeded uprising. 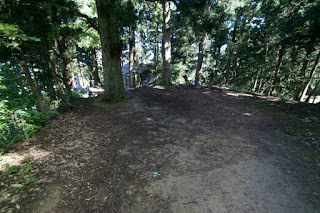 But Tamakage could not stabilize his authority then internal conflict with other lords continued. 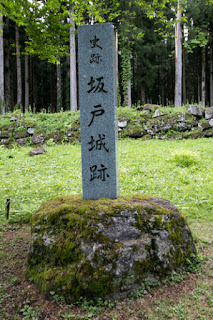 In 1543, Tamakage died in ill and his eldest son Harukage Nagao (1509-1553) succeeded leader position. 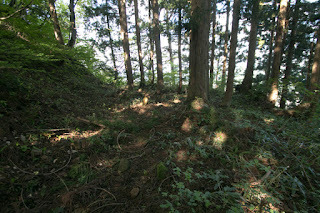 But Tamekage was not so talented and weak then could not control local lords. To suppress the rebellion of local lords, Harukage ordered his younger brother Kagetora Uesugi (1530-1578, later Kenshin Uesugi) to defeated non obedient lords, and Kenshin later praised as the god of war showed his talent and quickly finished the rebellion. Seeing such situation, local lords of Echigo province forsake Harukage and supported Kagetora as their leader. As the mother of Kagetora was the person of Koshi Nagao clan, Kagenobu Nagao (?-1578), the leader of Koshi Nagao clan, belonged to Kagetora. 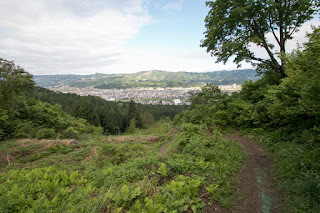 On the other hand, Masakage Nagao (1526-1564), leader of Ueda Nagao clan, still supported Harukage, considering its rivalry against Koshi Nagao clan. 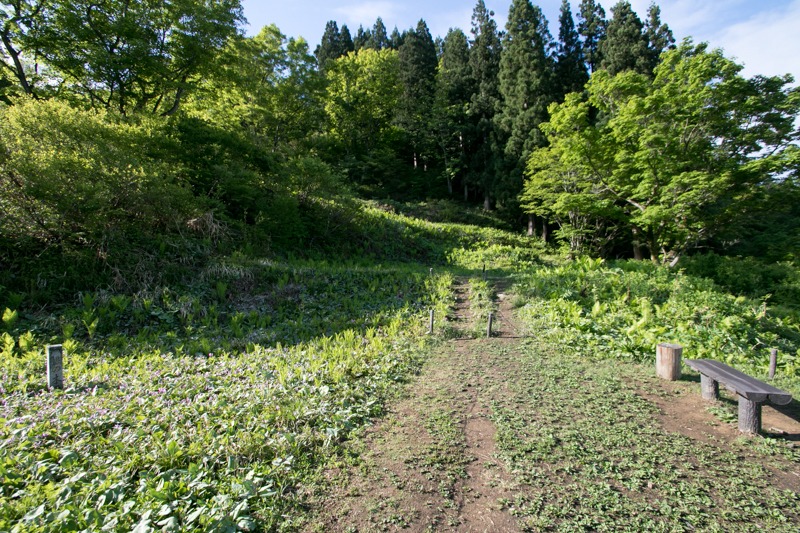 Finally in 1550, Kagetora became an adopted son of Harukage and succeeded leader position of Fuchu Nagao clan. 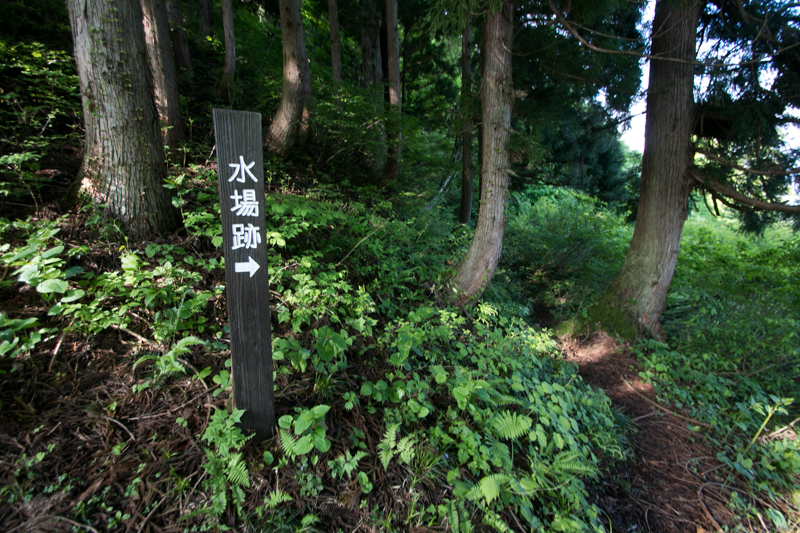 Masakage Nagao was dissatisfied with this decision and raised army against Kenshin. 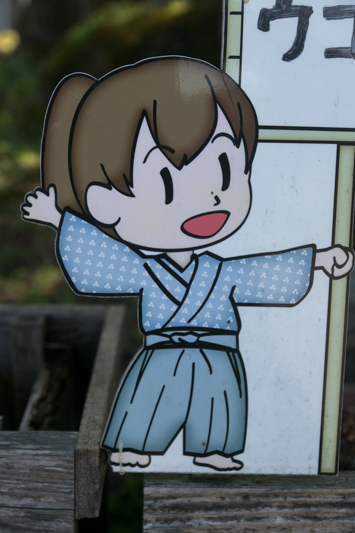 But Masakage was defeated by Kagetora then followed to Kenshin, and married with Sentoin who was the younger sister of Kagetora. 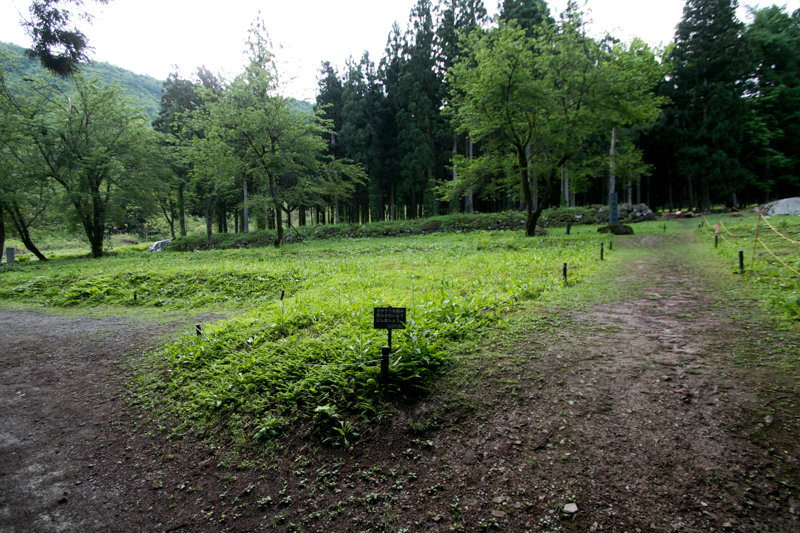 After that, Ueda Nagao clan supported Kagetora as an important relative and contributed to its expansion. 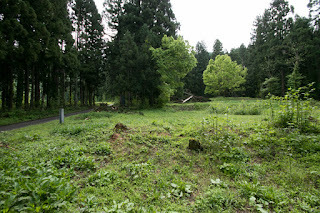 In 1550, Uesugi clan which was formerly the master of Nagao clan was defeated by Hojyo clan, a warlord of Sagami province (Kanagawa prefecture) and exiled to Echigo province. 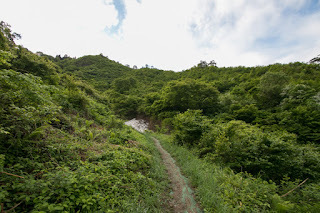 At the same time, Shingen Takeda (1521-1573), a warlord of Kai province (Yamanashi prefecture) advanced to Shinano province (Nagano prefecture), and defeated local lords such as Ogasawara clan or Murakami clan also seek assistance to Kagetora. Kagetora renamed to Kenshin Uesugi and fought fierce battles with Hojyo clan or Takeda clan. In 1564, Masakage Nagao died in accident, but his son Akikage Nagao (1556-1623) became an adopted son of Kenshin who did not marry and have son then named as Kagekatsu Uesugi. But Kenshi had adopted another son Kagetora Uesugi (1554-1579) who was accepted from Hojyo clan at the time of alliance, and did not decide his successor from two adopted son. 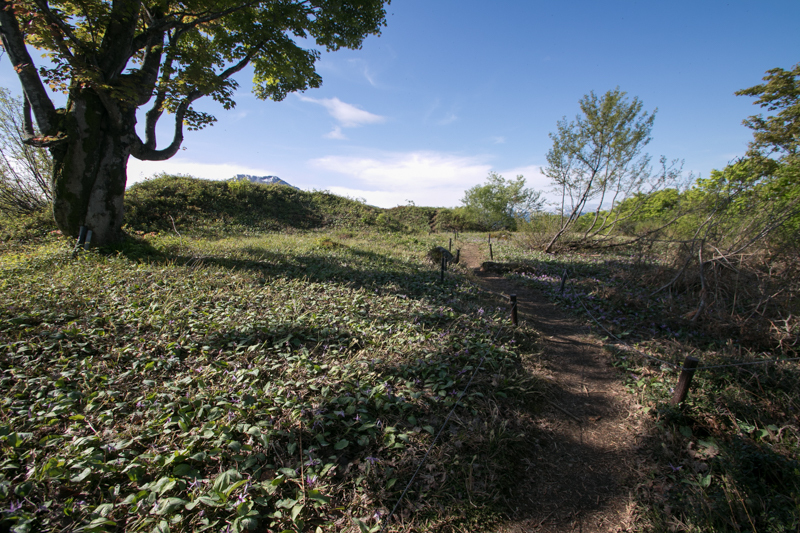 In 1578, Kenshin suddenly died in ill, and these two successor promptly started internal conflict named as "Otate no Ran" for next leader position. 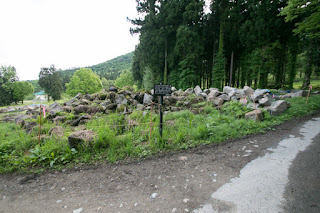 Kagekatsu Uesugi who was supported by close guards of Kenshin captured Kasugayama castle, the main base of Uesugi clan then Kagetora left the castle and besieged at Otate residence near Kasugayama castle. 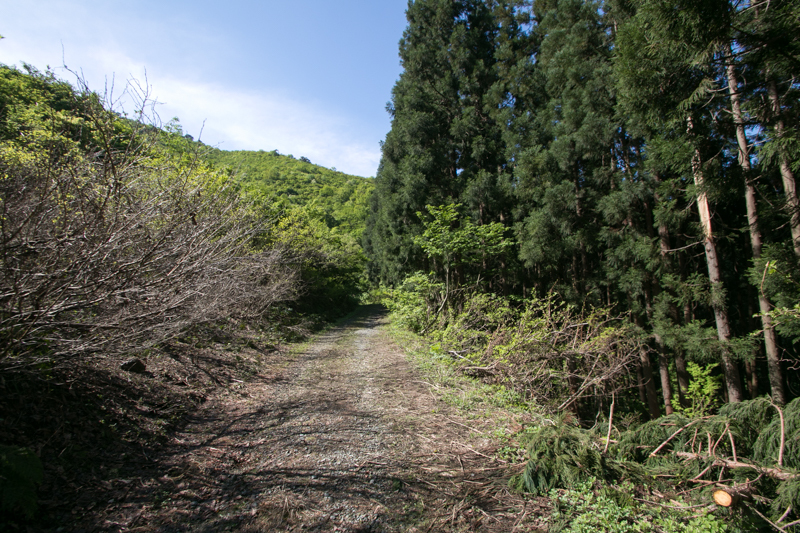 Needless to say, Ueda Nagao clan belonged to Kagekatsu who was the person of Ueda Nagao clan. 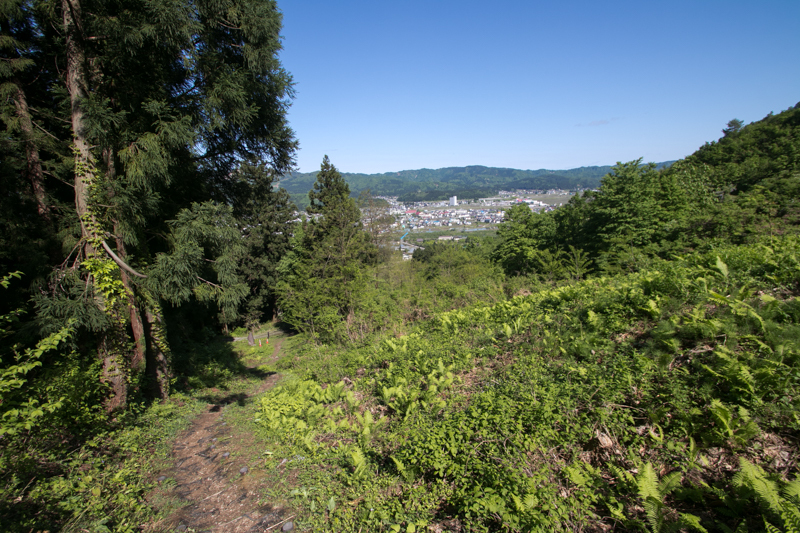 But large local lords including Koshi Nagao clan supported Kagetora, and shut the communication between Kasugayama castle and Uonuma basin. 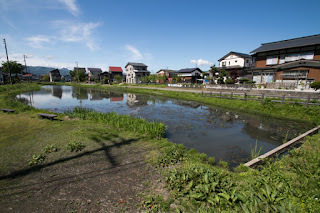 And more than anything, Kagetora was supported by strong neighbor warlords such as Hojyo clan which was the birthplace of Kagetora and its ally Takeda clan. 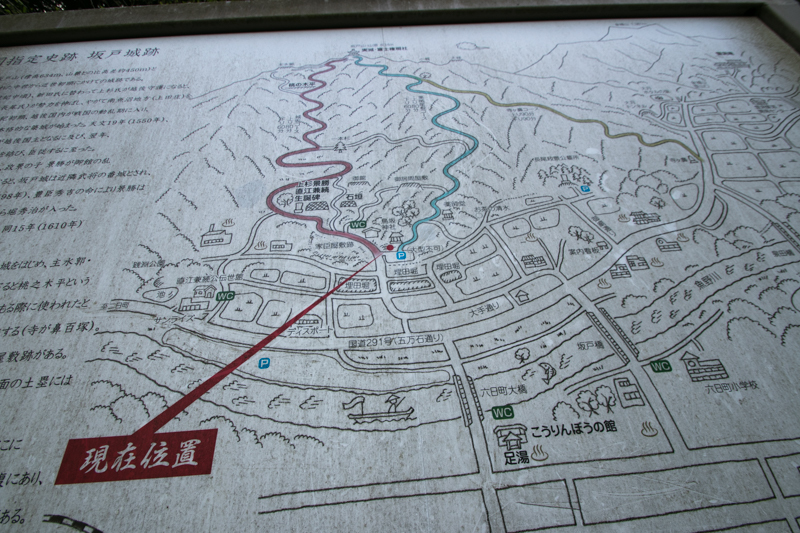 In 1578 summer, Hojo clan sent a overwhelming reinforcement army to Kagetora passing Mikuni-Toge pass and let Takeda clan attack Uesugi clan from Shinano province. 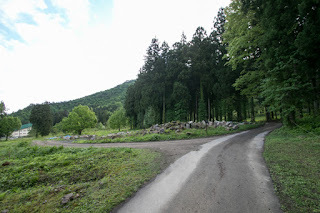 Kagekatsu fell into severe situation, but utilizing anxiety of Takeda clan which might be surrounded by overwhelming Hojyo clan after the victory of Kagetora, Kagekatsu could make peace with Takeda clan and let them get out from the conflict. But Hojo main force steadily advanced into Echigo province, then castles at border area such as Arato castle or Kabasawa castle fell before the attack of Hojo army. 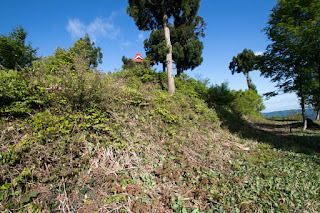 Next Hojo army surrounded Sakado castle, and guardian force of Ueda Nagao clan had to guard the castle without their leader Kagekatsu who stayed distant Kasugayama castle. 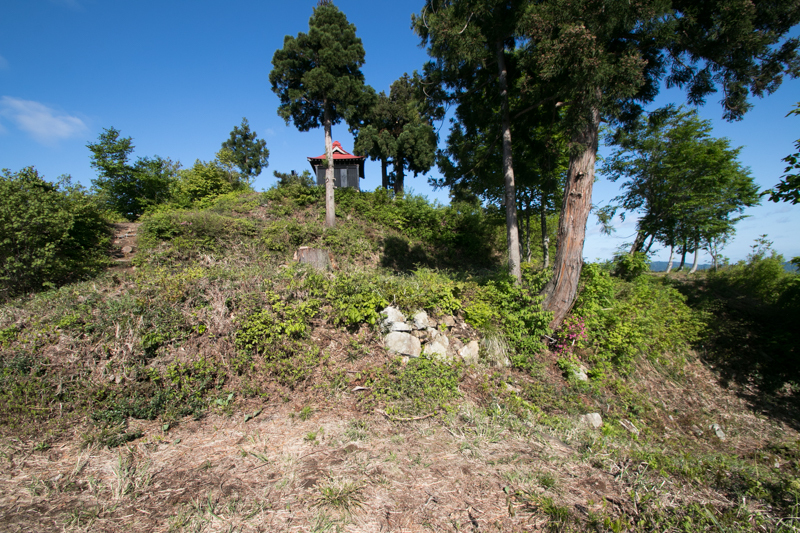 However, secure Sakado castle stood against overwhelming Hojyo army for several months. 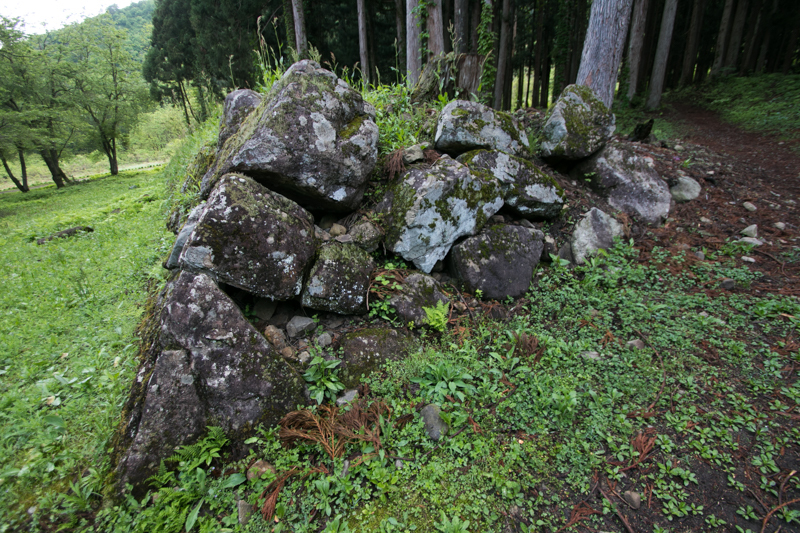 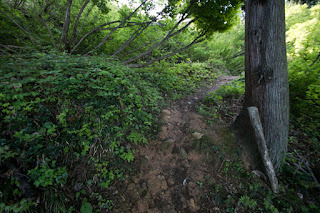 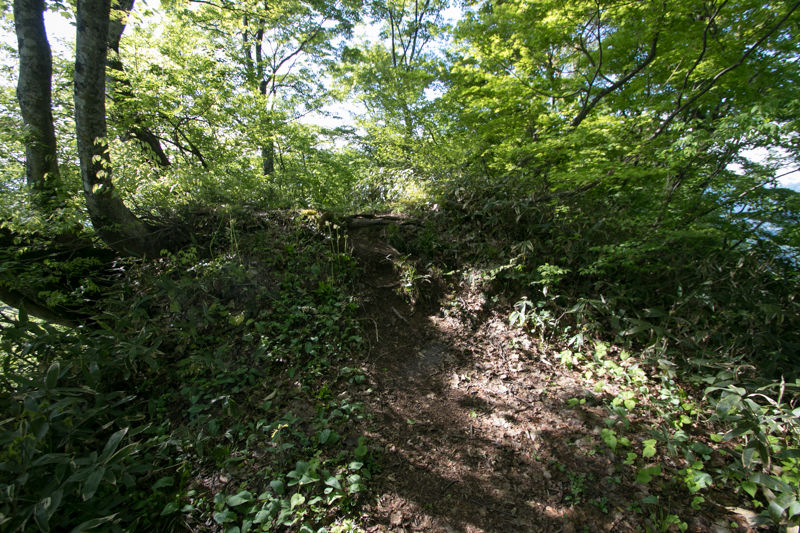 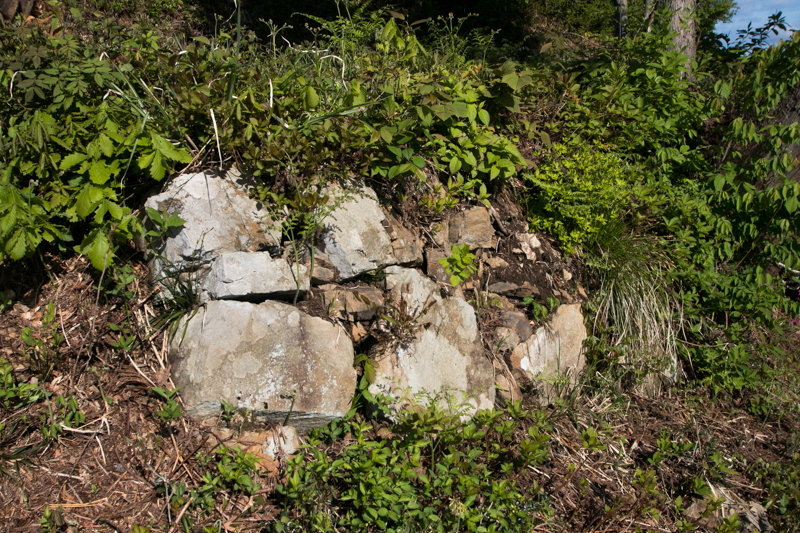 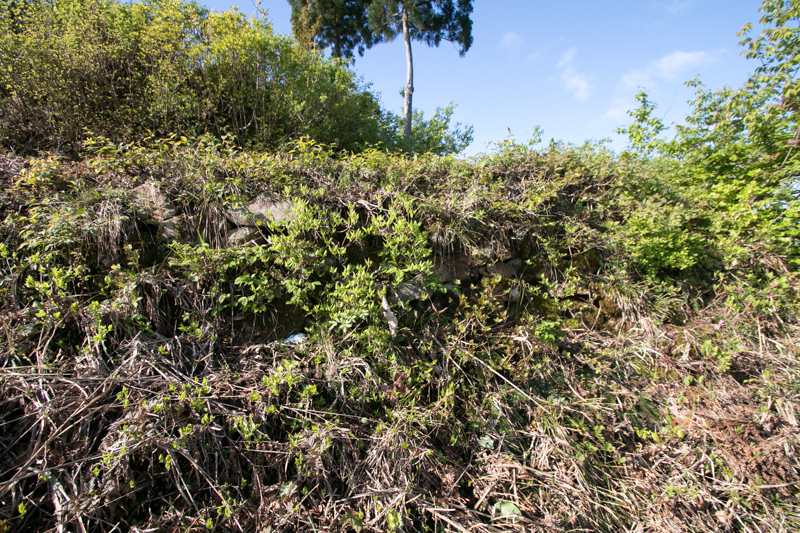 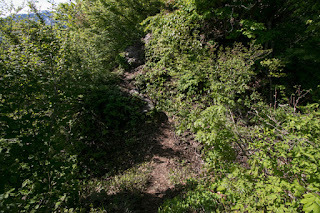 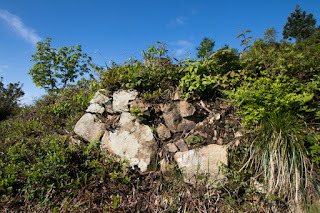 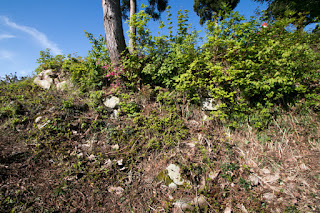 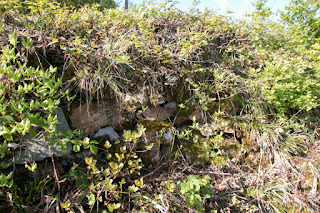 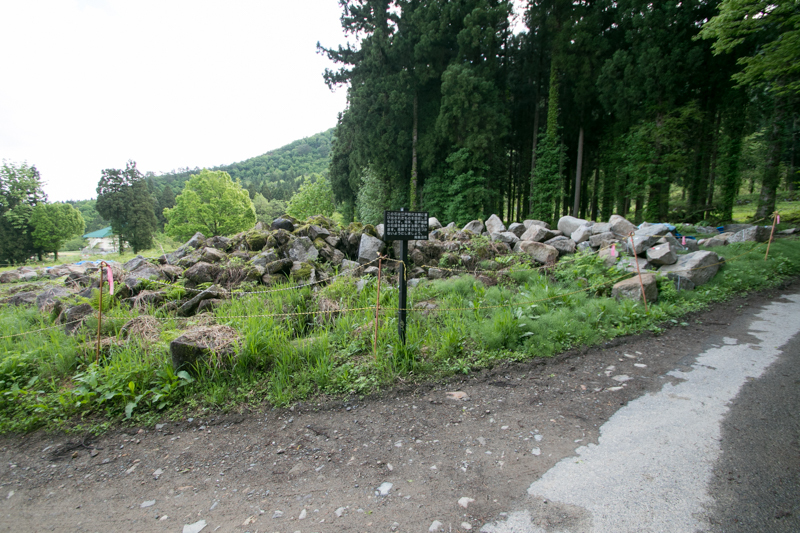 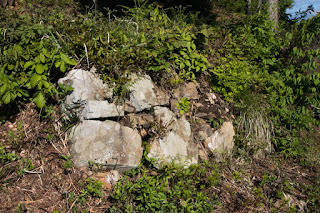 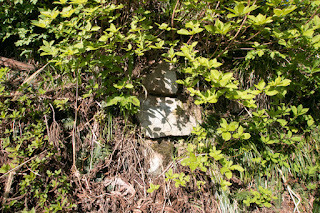 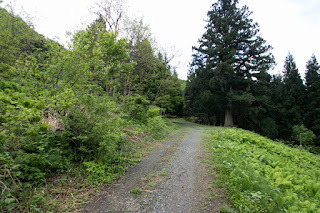 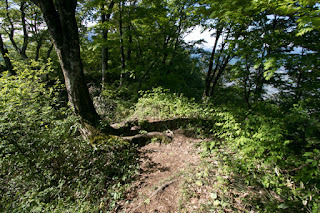 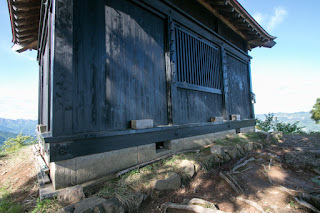 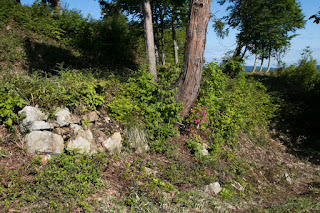 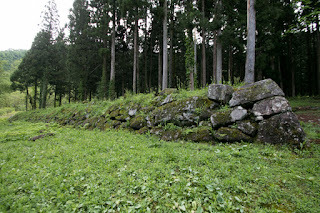 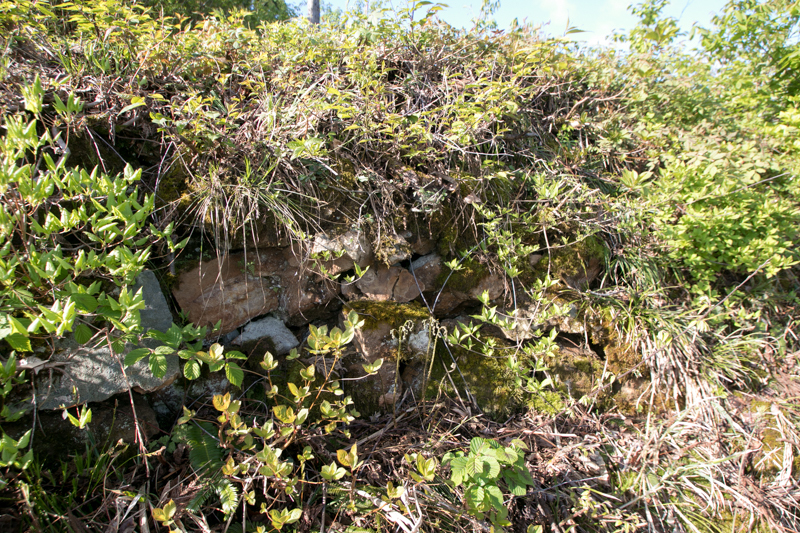 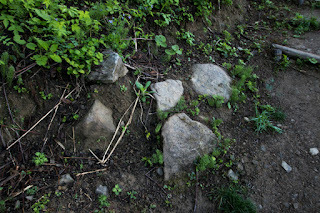 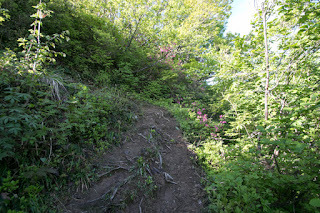 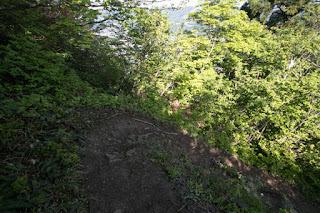 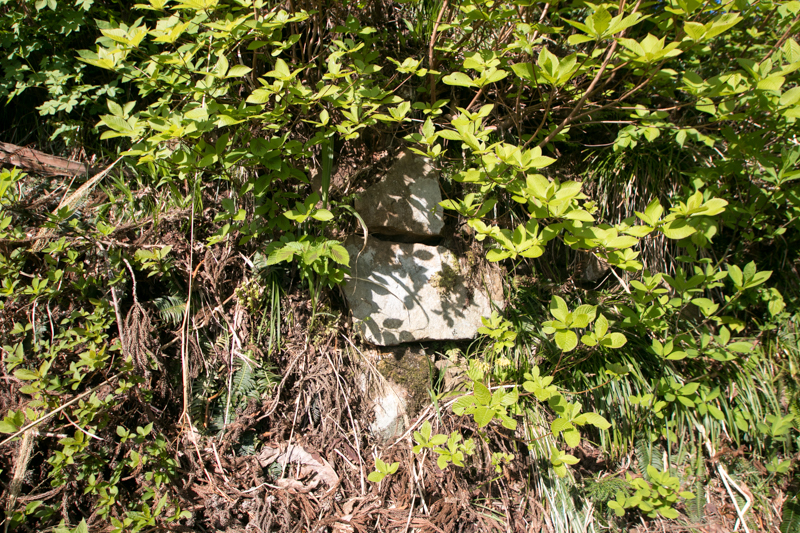 Sakado castle was totally secured sheer wall and only connected with narrow roads, and Hojo clan could not use forcible attack to the castle. 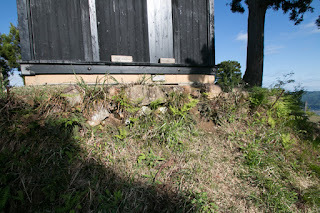 The only possible way to fall this castle is starving out tactics, but as Hojo clan attacked the castle after rice harvest and castle side could prepare supply well. 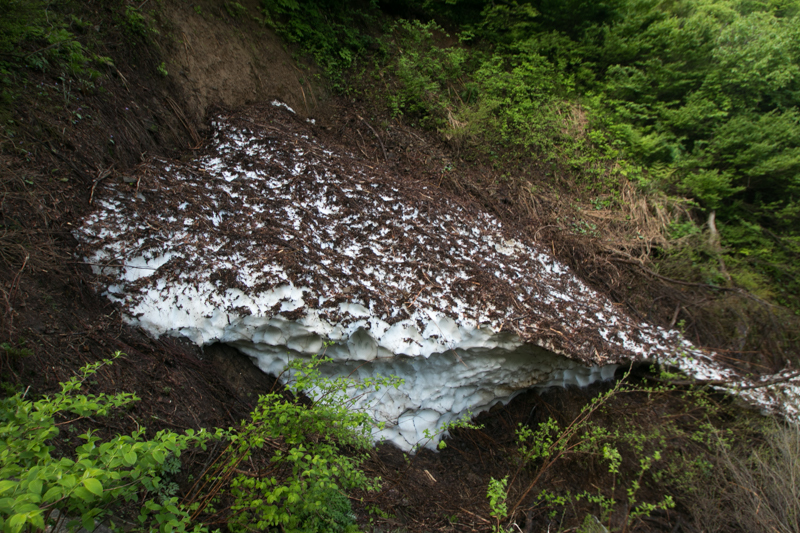 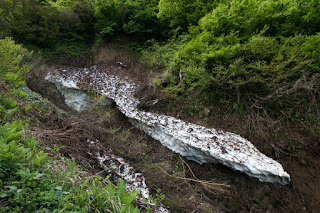 Furthermore, Uonuma area is one of the heaviest snow area in Japan, and once winter comes Hojo army could not transport their supply well. Finally, Hojo army retreated from Echigo province before winter. 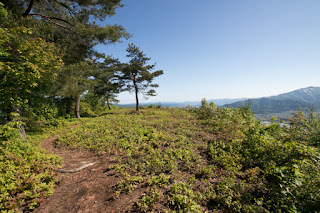 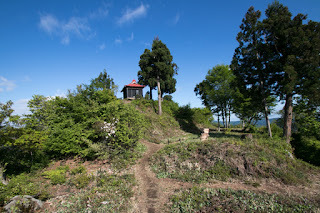 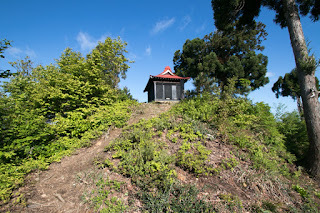 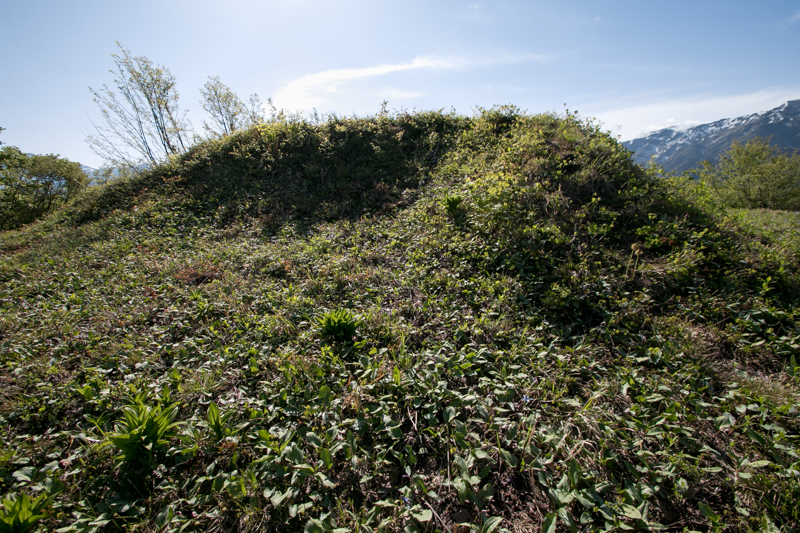 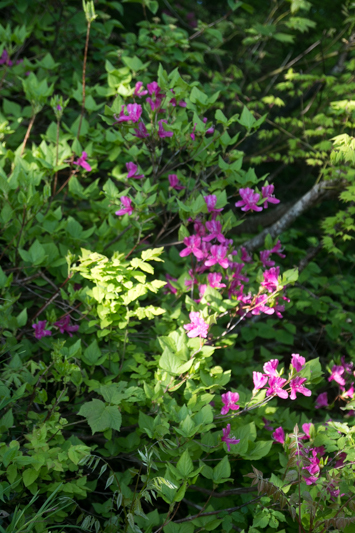 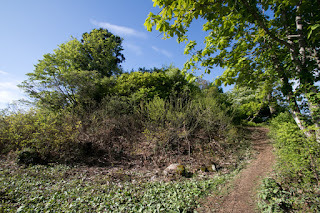 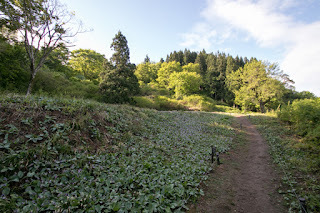 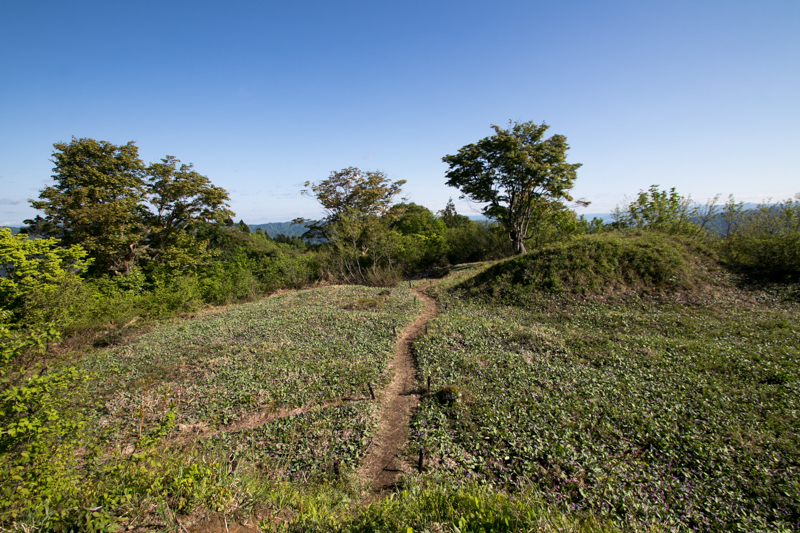 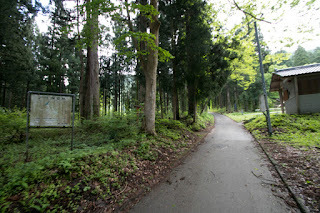 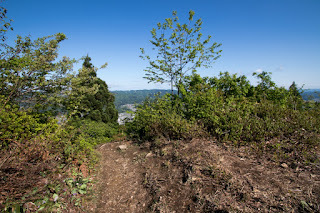 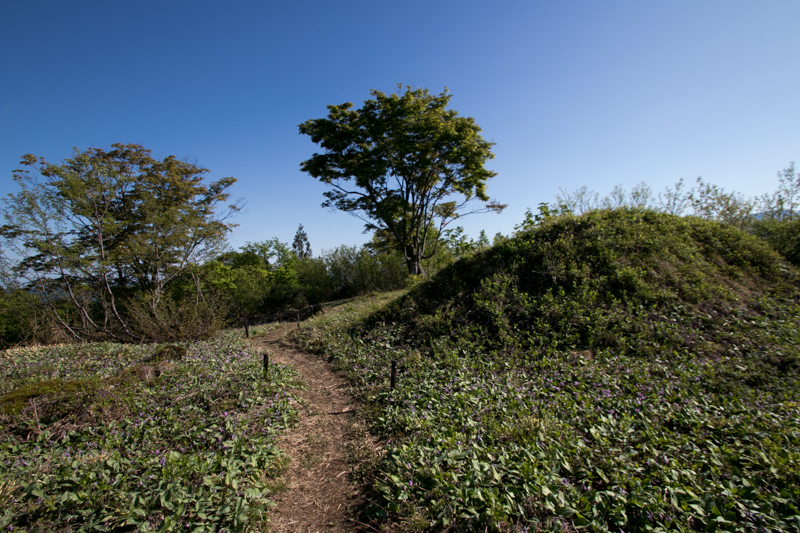 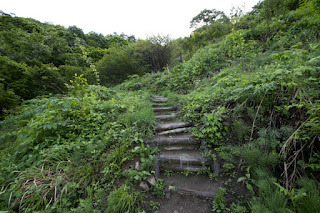 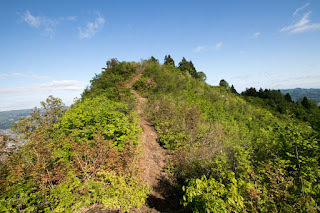 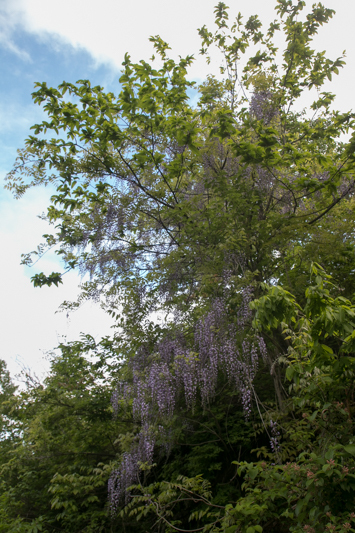 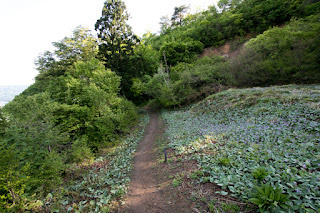 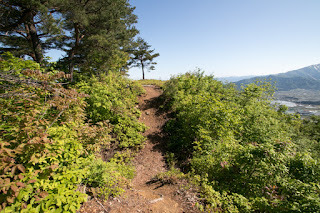 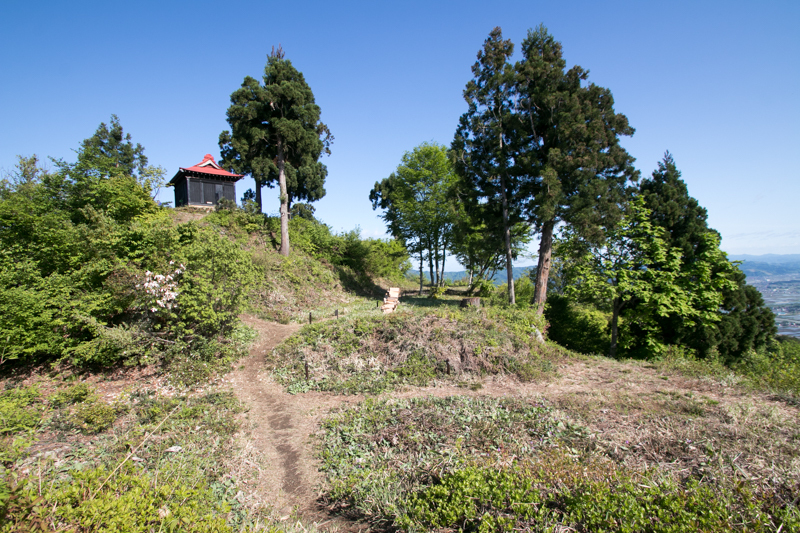 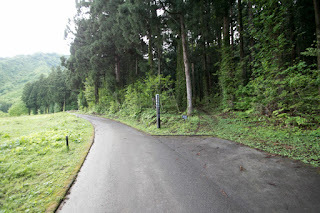 Utilizing confinement of Hojyo army at Sakado castle and retreat, Kagekatsu attacked enemy castles between Kasugayama castle and Uonuma basin to make connection between both area. Before winter Kagekatsu army felled major generals of Kagetora army such as Kagenobu Uesugi or Kagehiro Kitajyo (1548-1579), and could communicate with his main base. 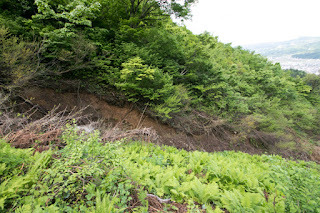 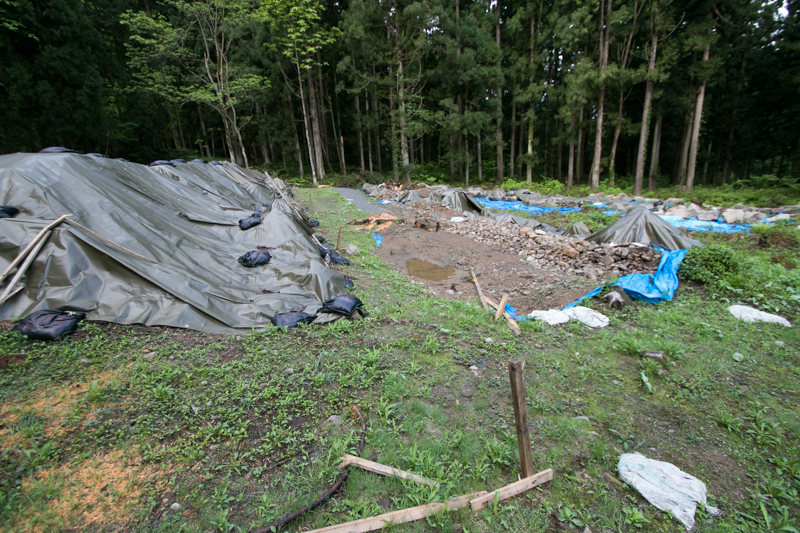 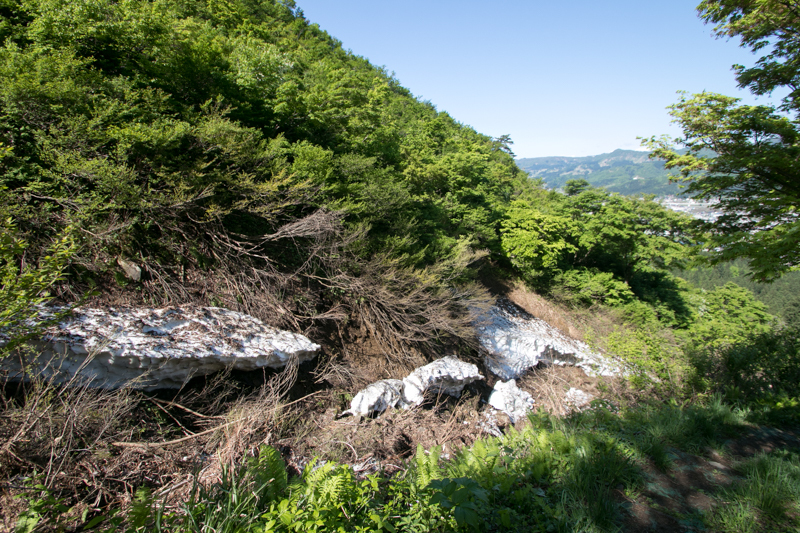 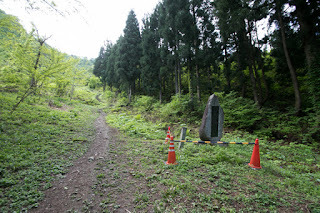 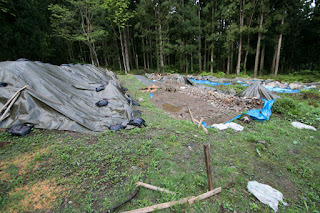 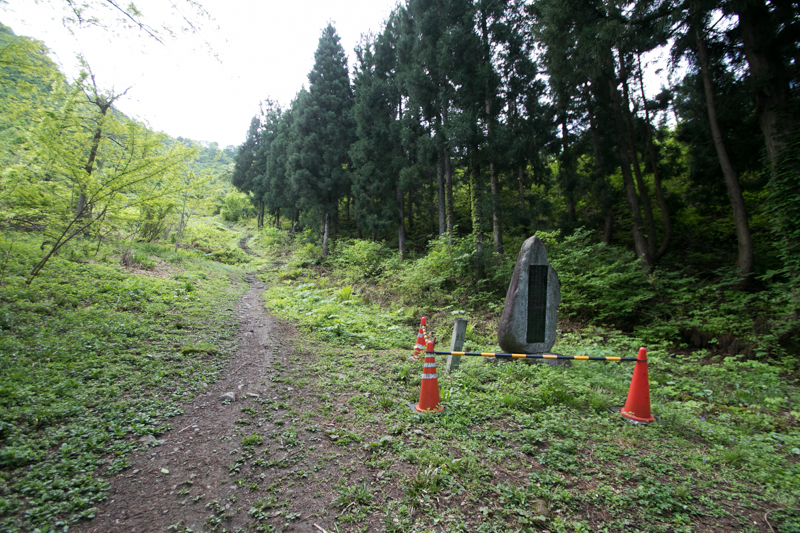 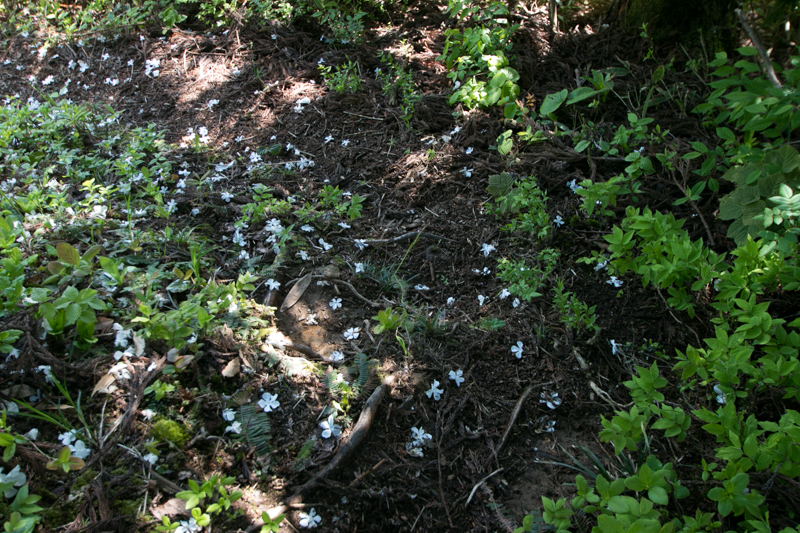 On the other hand, because of shortage of supply and death of major leaders, Kagetora side gradually collapsed. 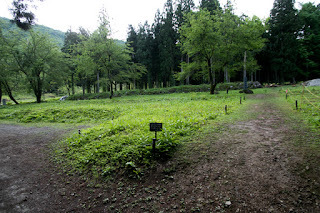 In March 1579, before the arrival of winter and Hojyo army, Kagekatsu made a total attack against Kagetora. 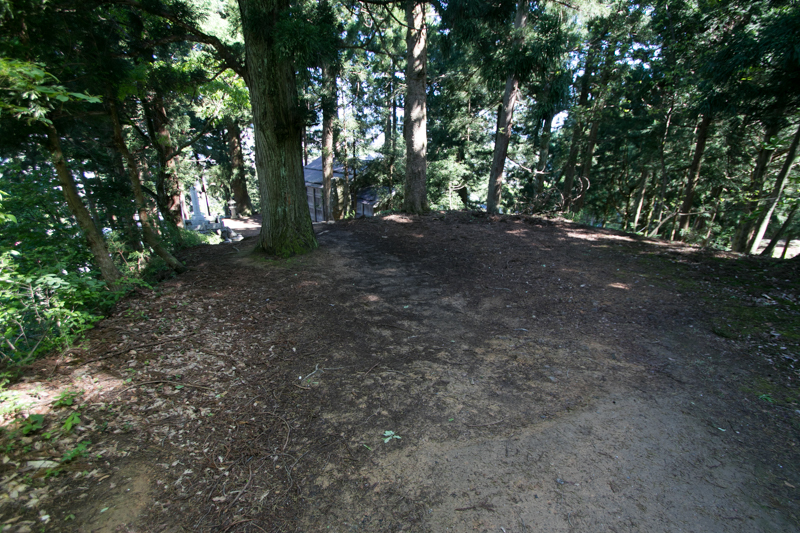 Otate residence fell and Kagetora escaped to Samagao castle, but facing the betrayal of the commander finally killed himself there. 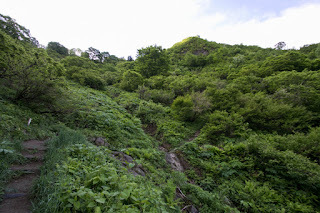 Kagekatsu reversed inferior situation and could succeed Uesugi clan, and brave fight of Sakado castle confined Hojyo army was undoubtedly one of the major factor of victory. Same as its shape, Sakado castle was a bridge for Kagekatsu to pass to the future. After the battle Sakado castle was continuously used as a base of Uesugi clan, but in 1598 Kagekatsu was transferred to the lord of Aizu Wakamatsu castle by Toyotomi government. 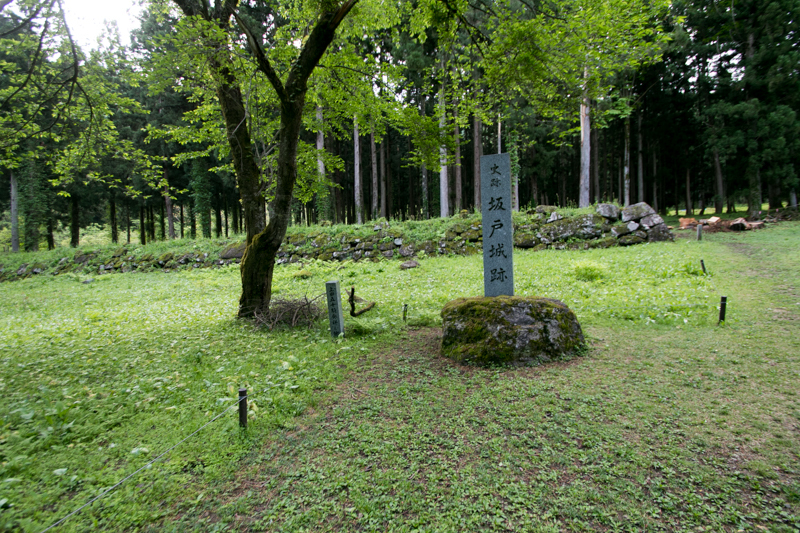 After Uesugi clan, Hideharu Hori (1576-1606) was appointed as a lord of Echigo province. 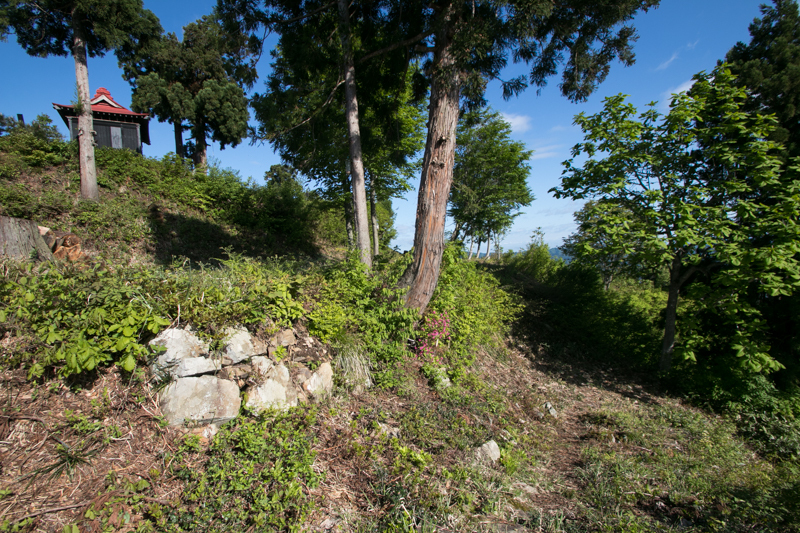 and Hideharu placed his important retainer Naoyori Hori (1577-1639) as the commander of Sakado castle. 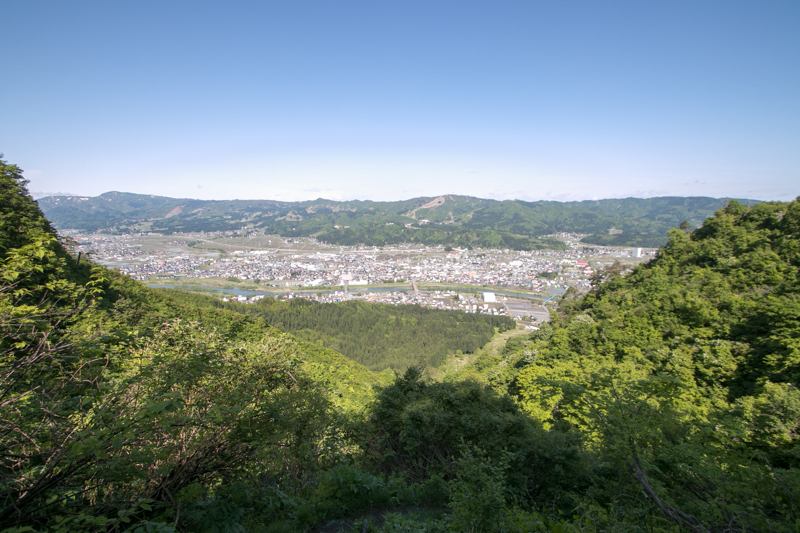 Naoyori reformed hilltop area and hillside residence, but in 1608, was transferred to the lord of Iiyama castle (Nagano prefecture), and Sakado castle was abolished at this time. 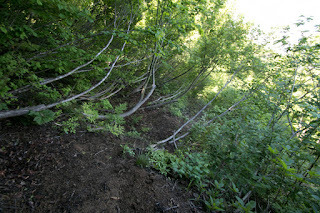 Now all building was lost but terraces at hilltop area well remains. 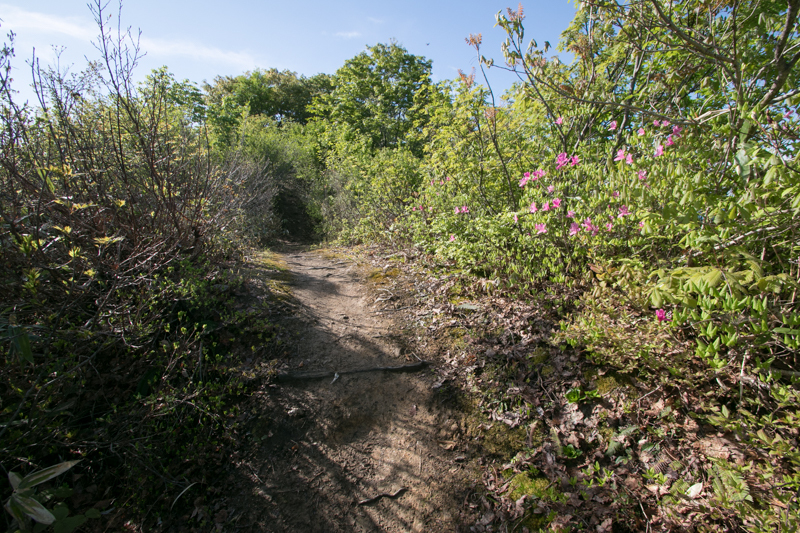 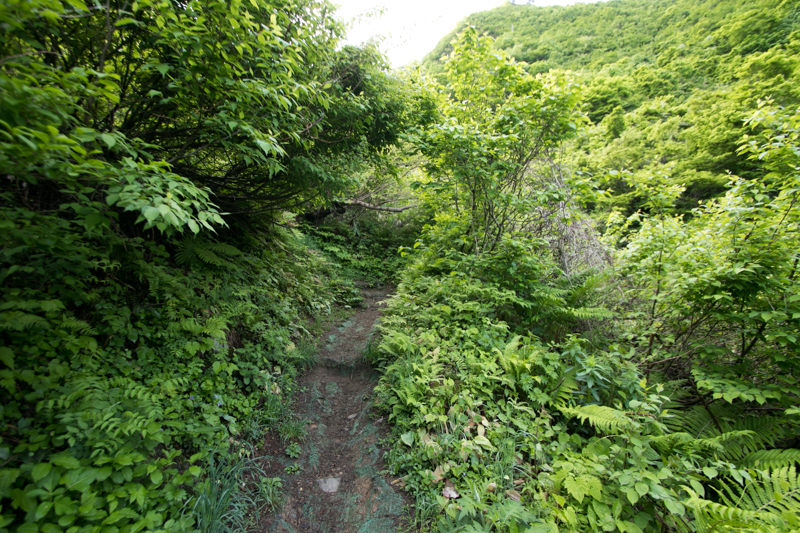 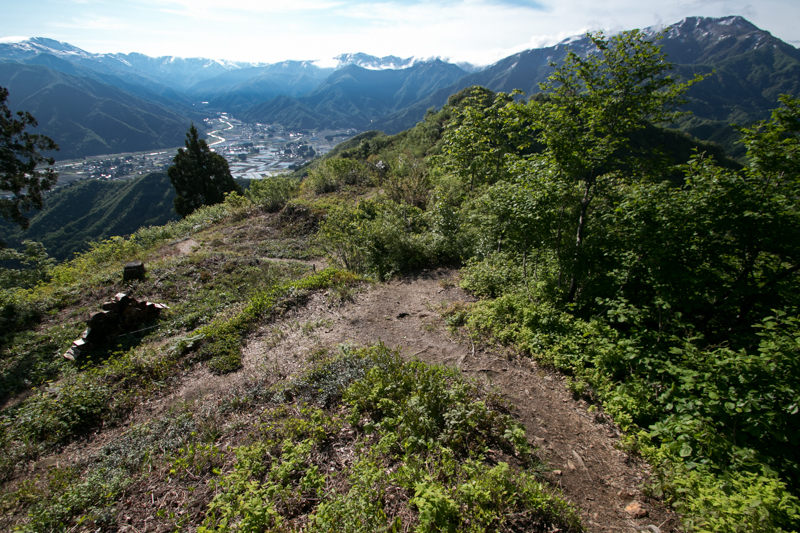 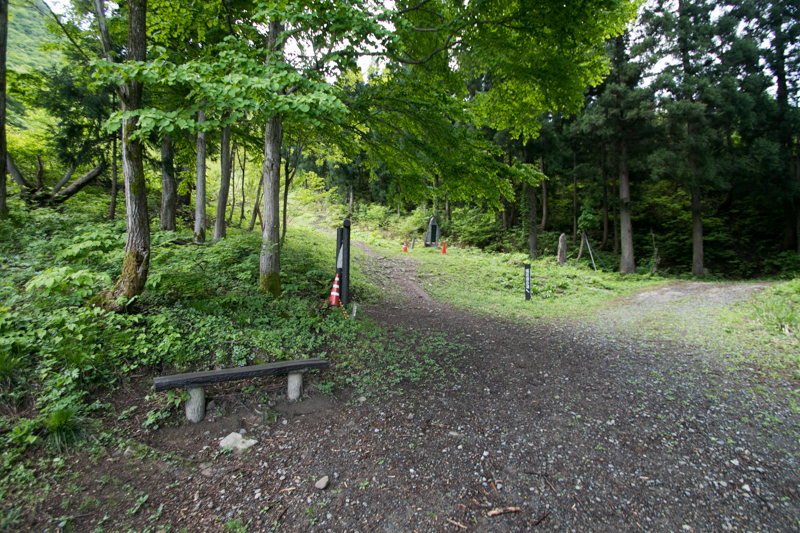 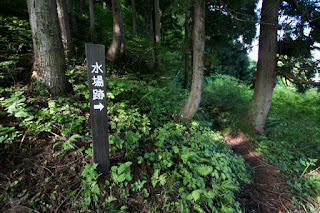 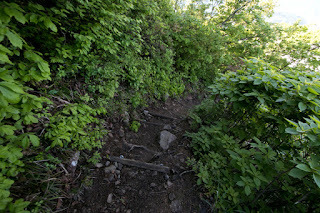 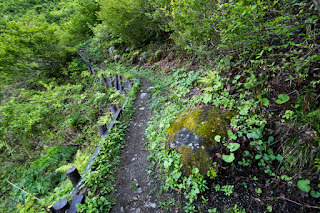 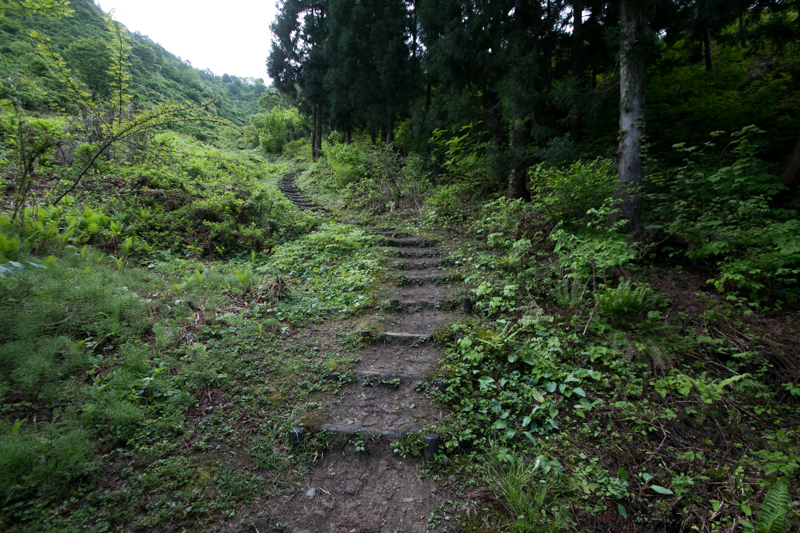 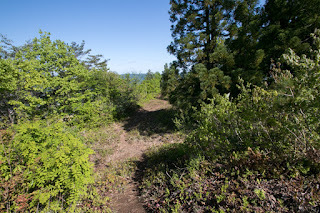 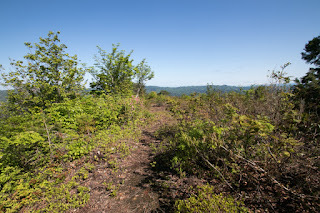 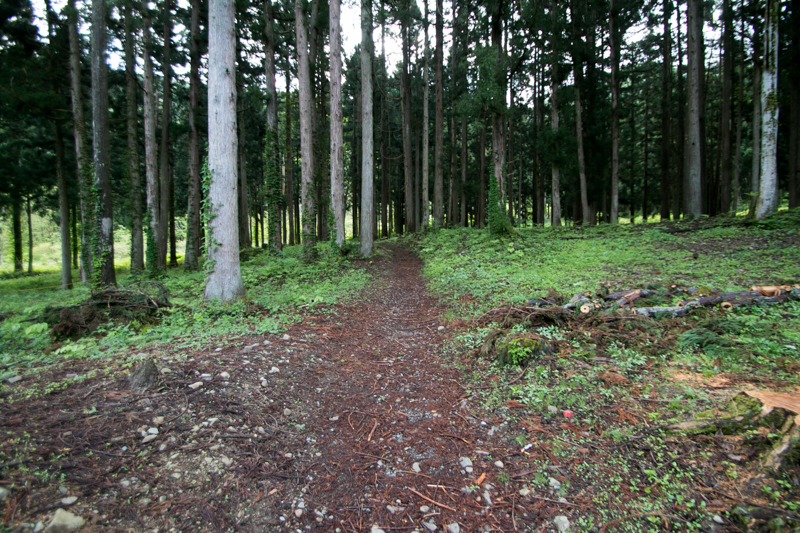 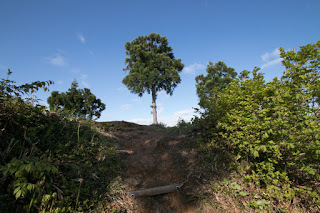 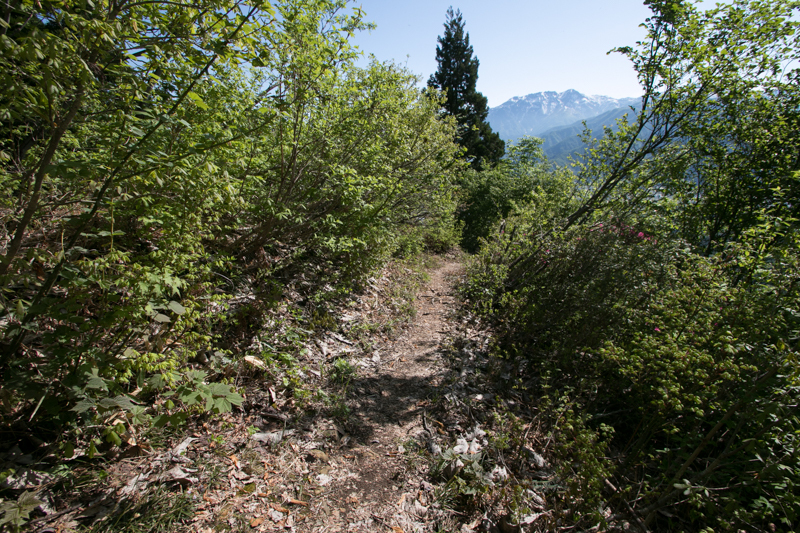 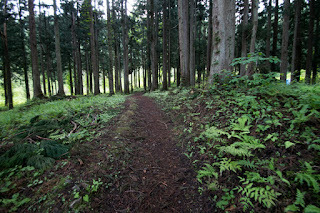 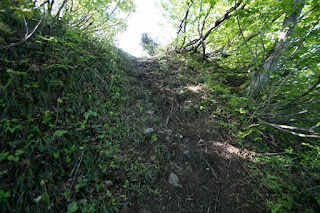 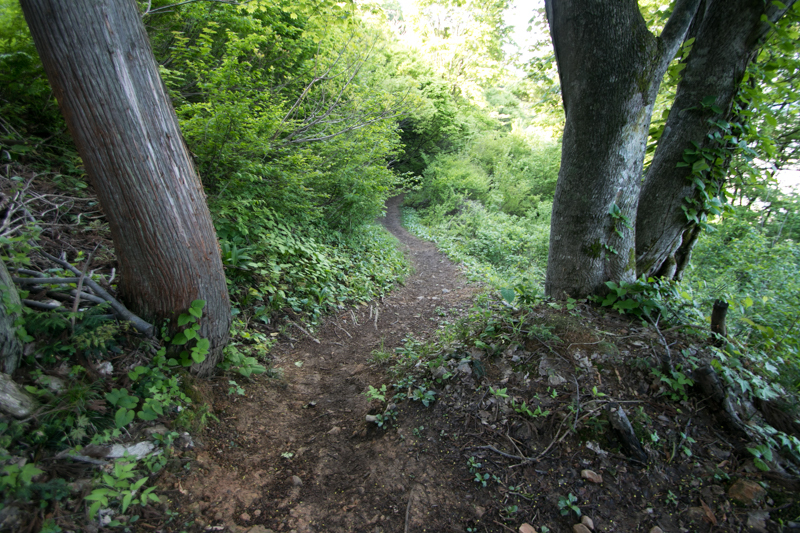 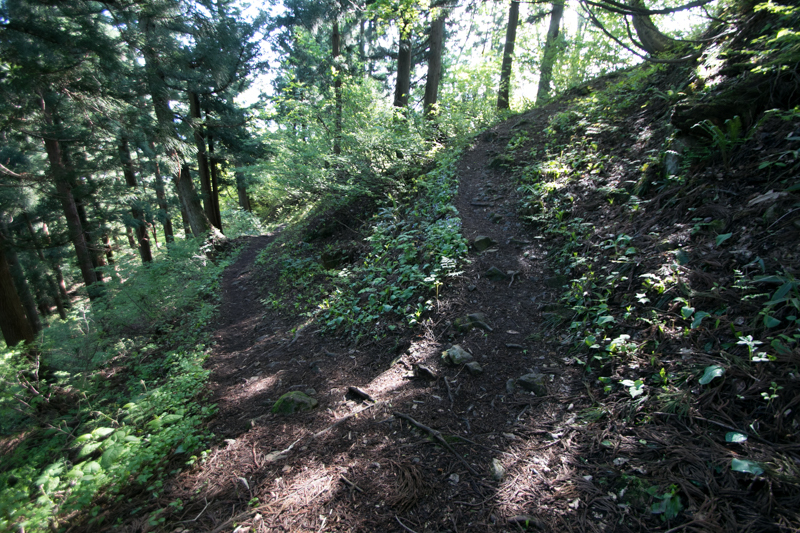 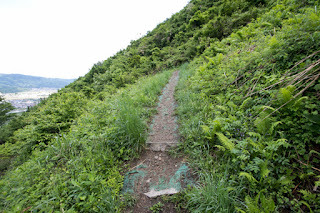 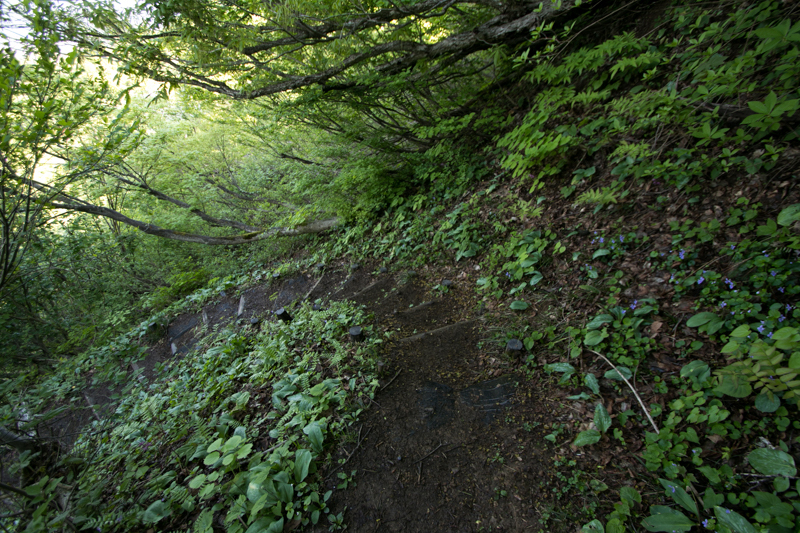 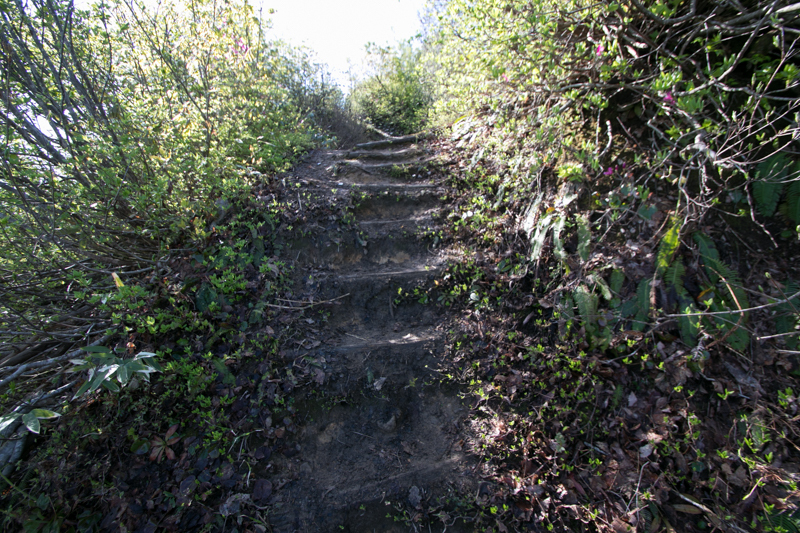 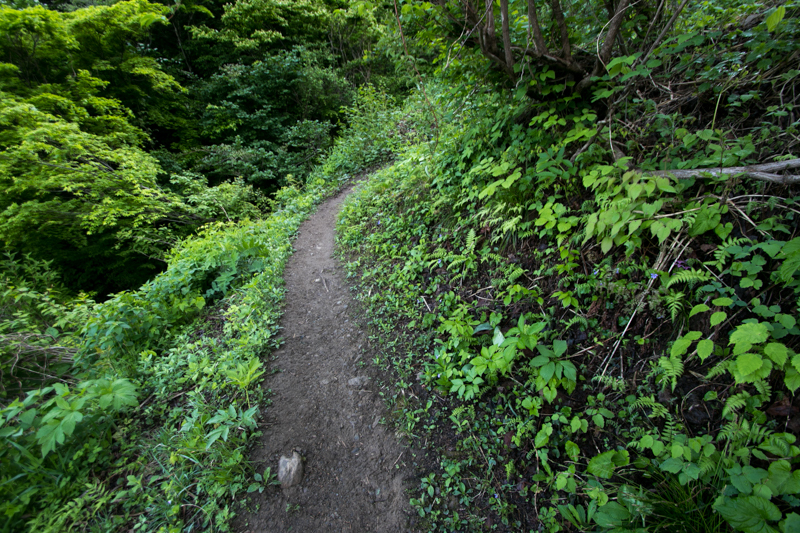 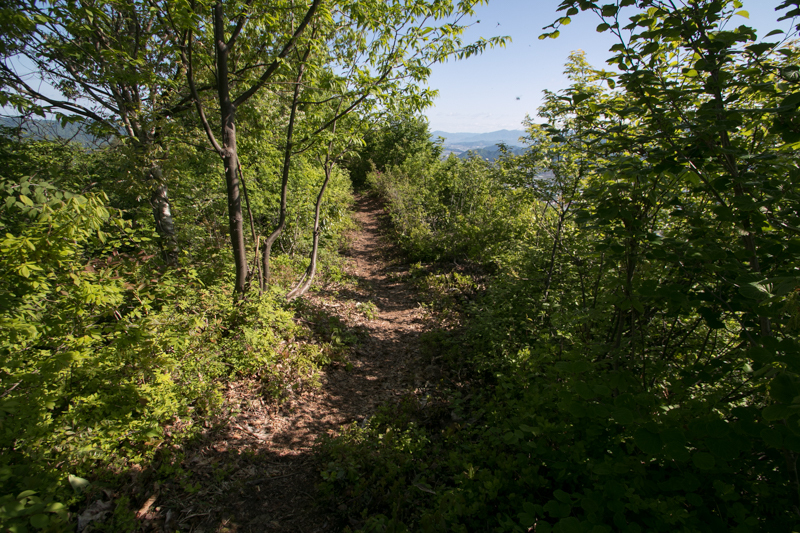 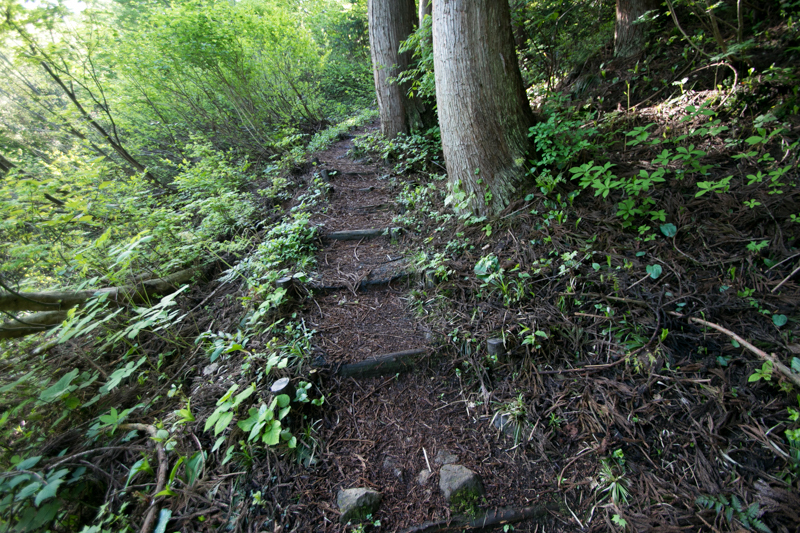 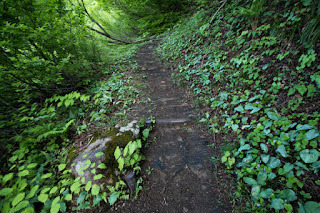 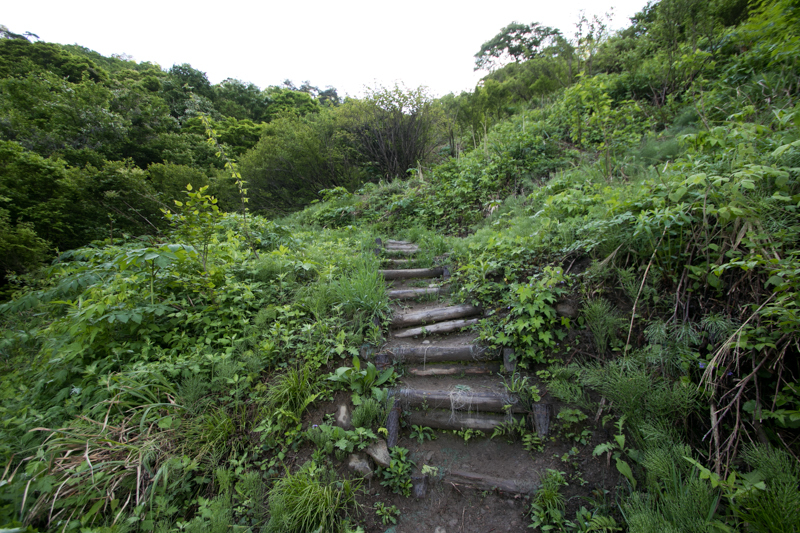 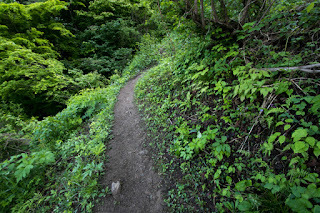 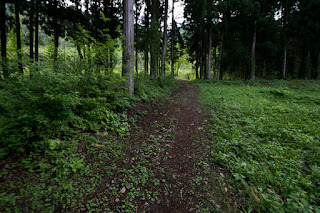 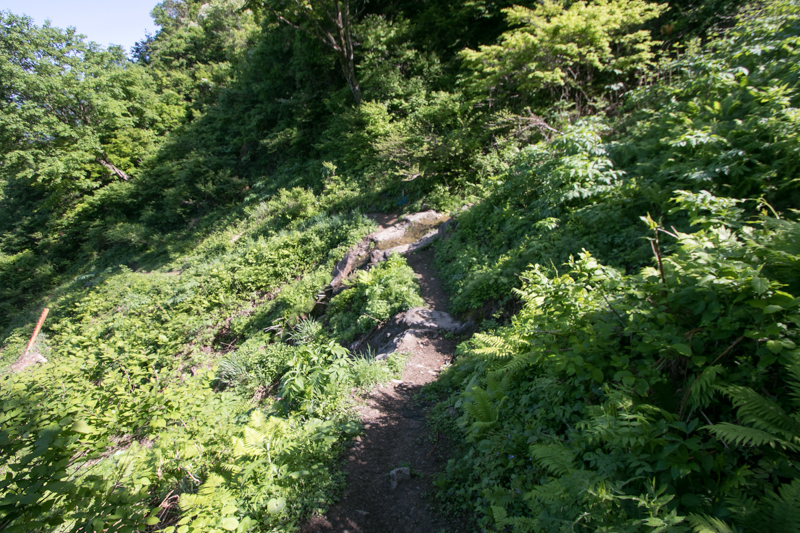 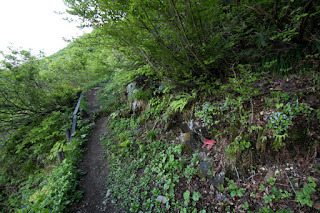 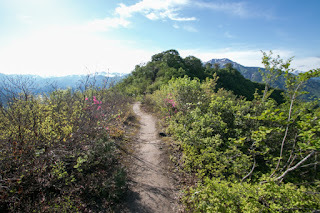 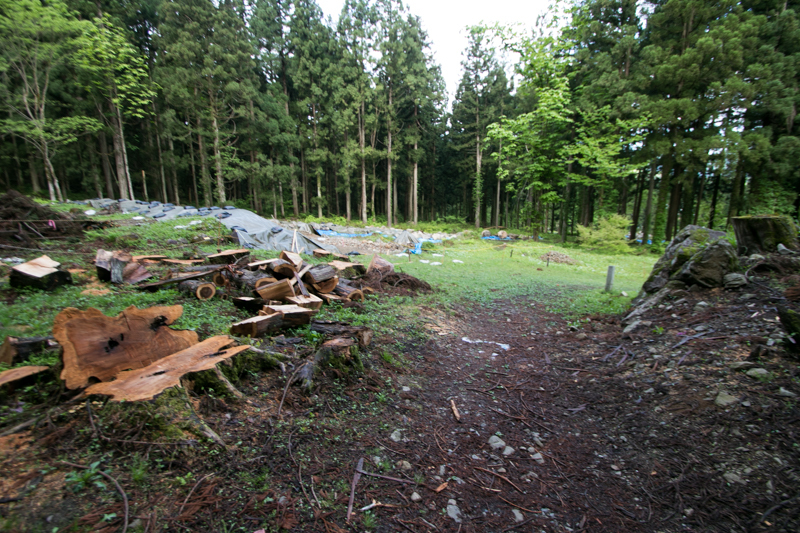 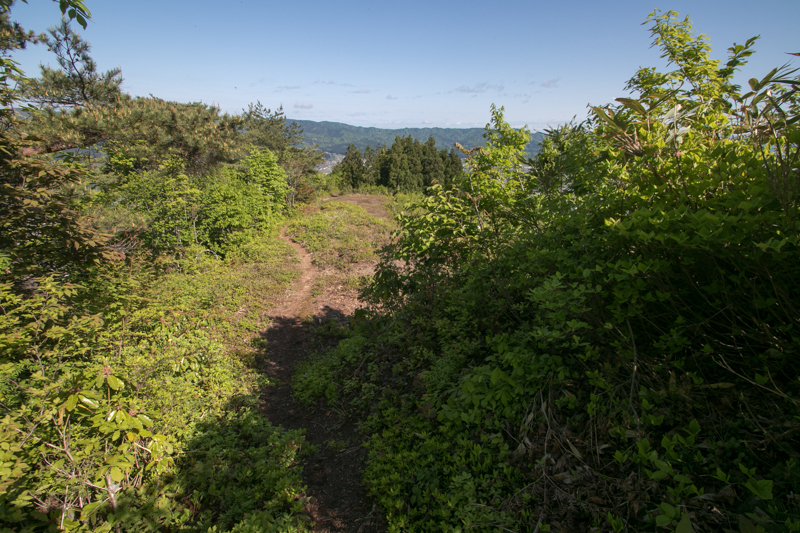 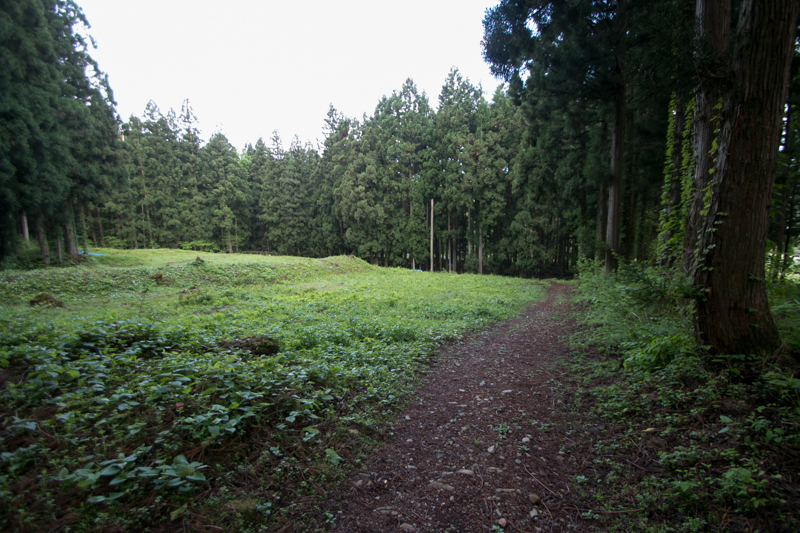 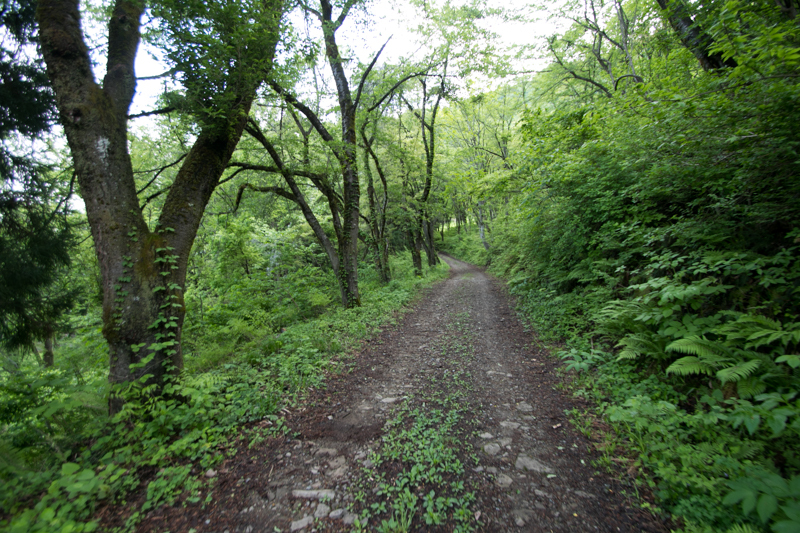 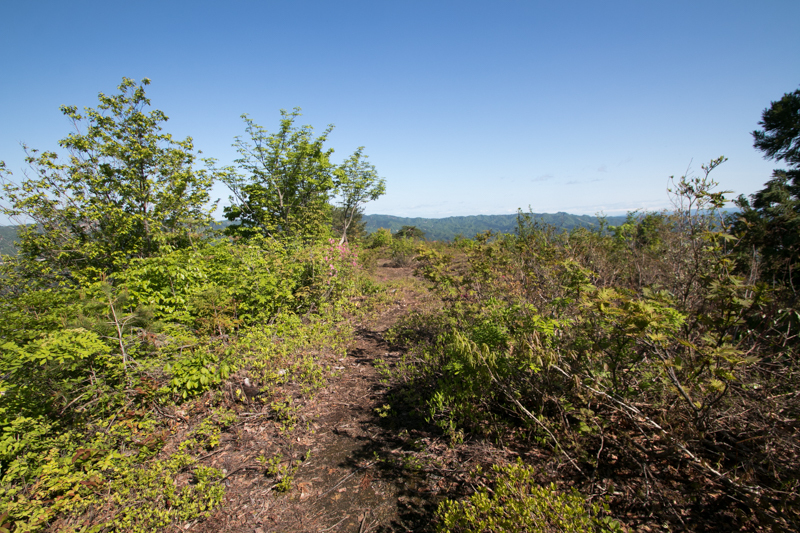 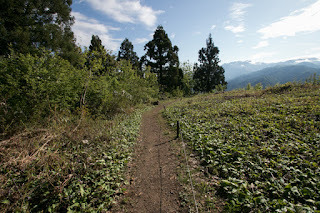 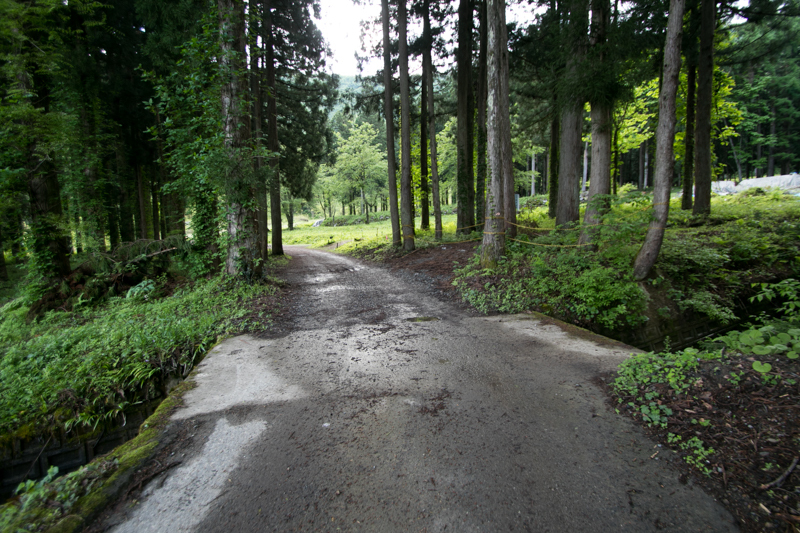 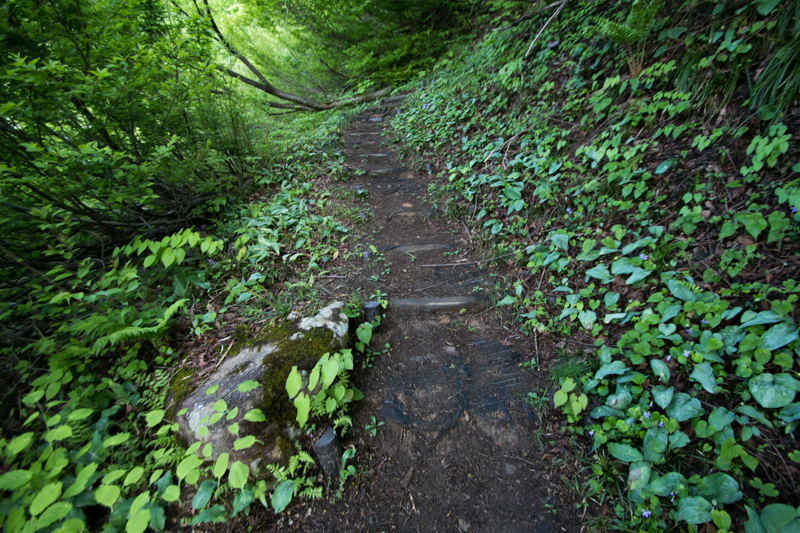 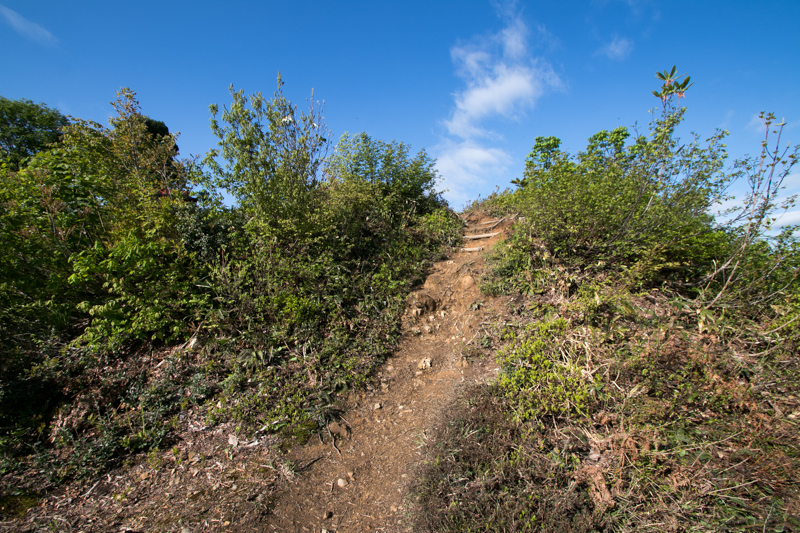 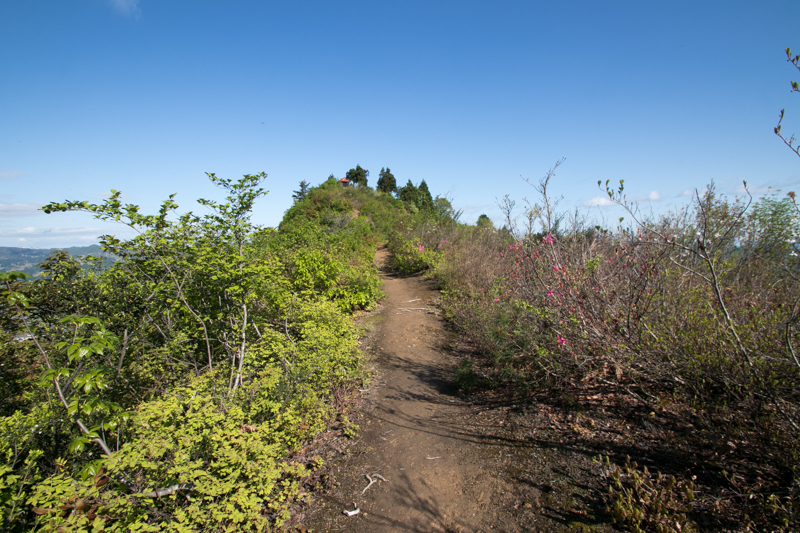 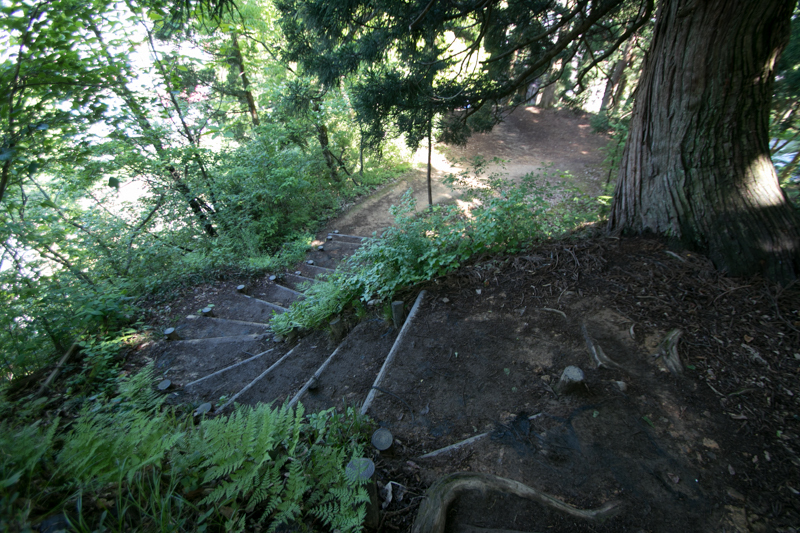 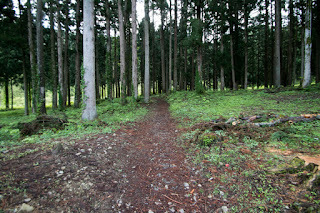 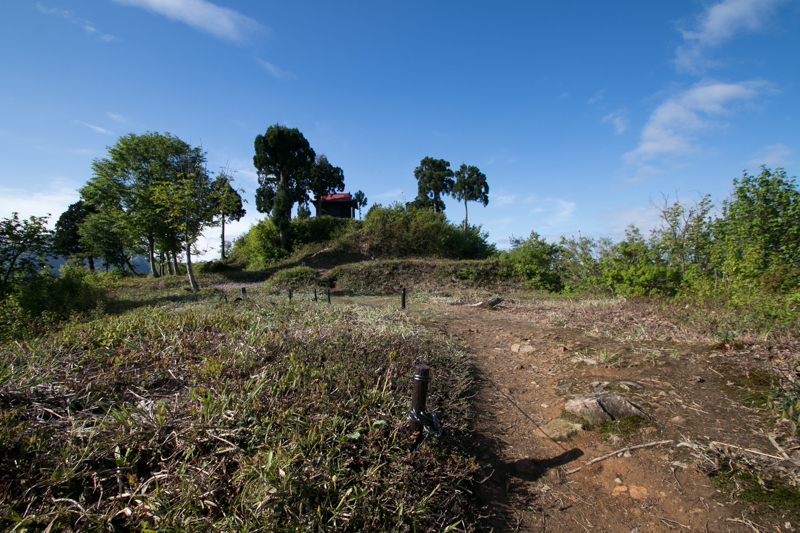 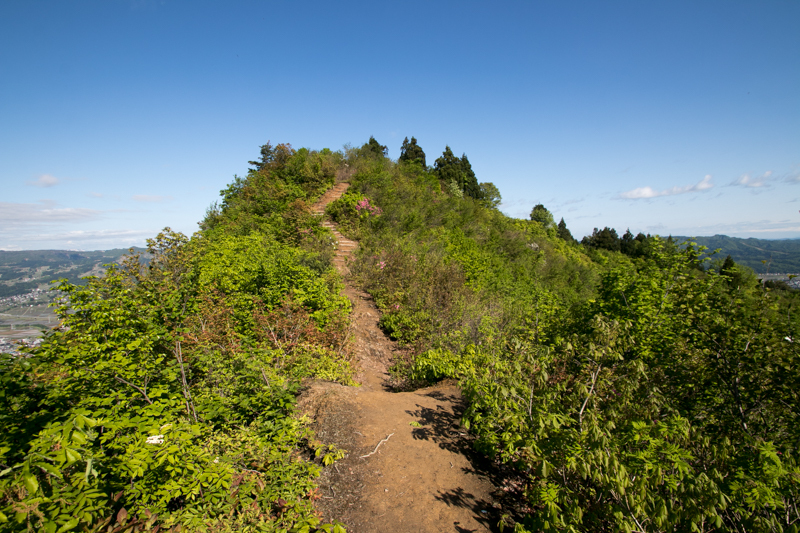 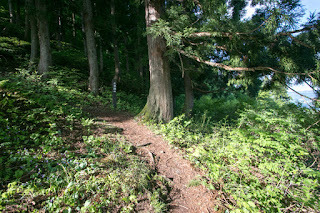 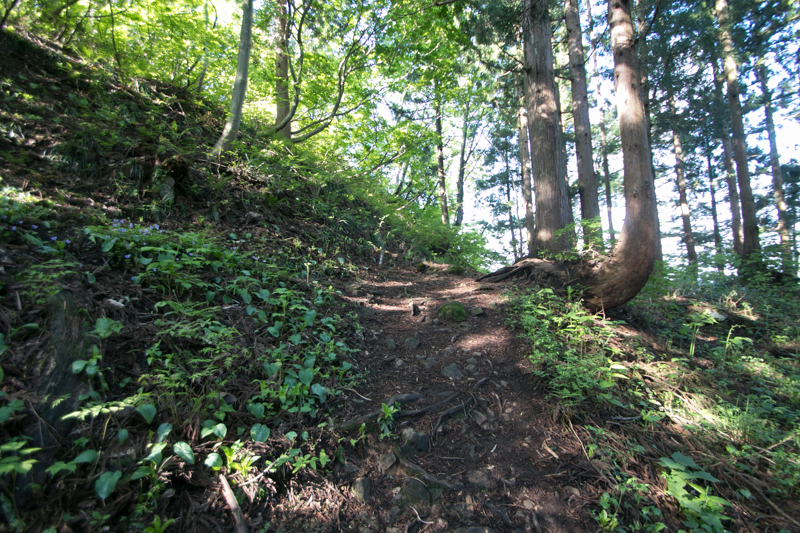 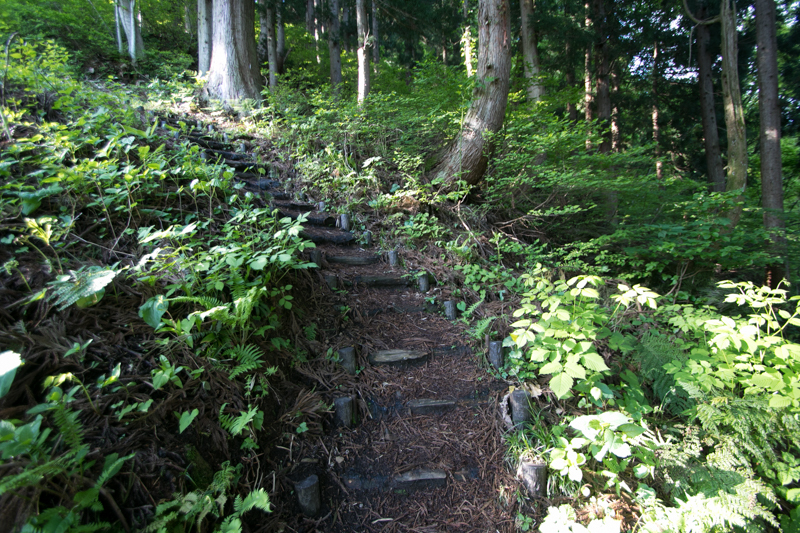 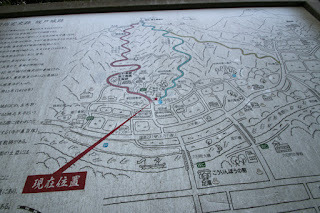 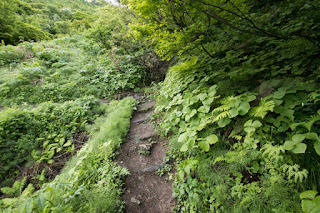 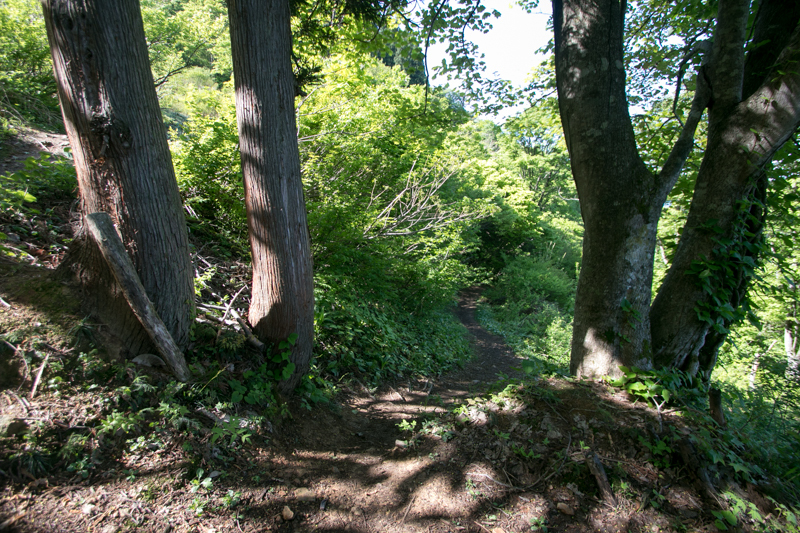 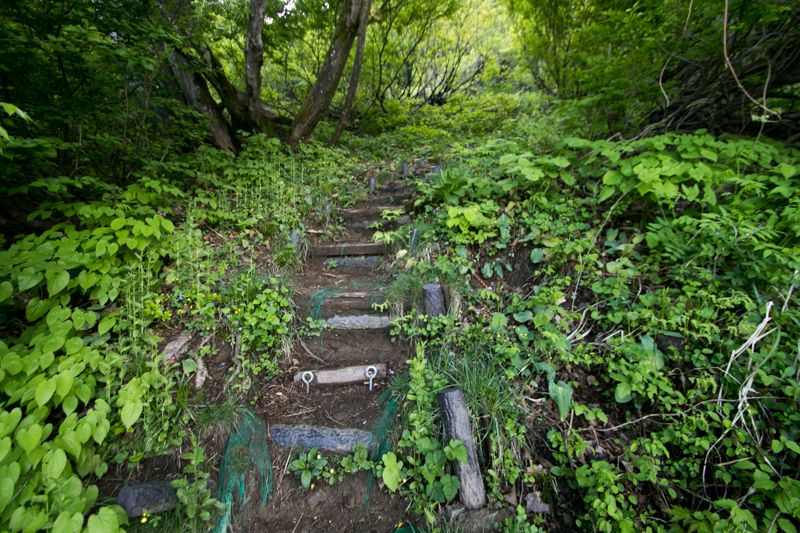 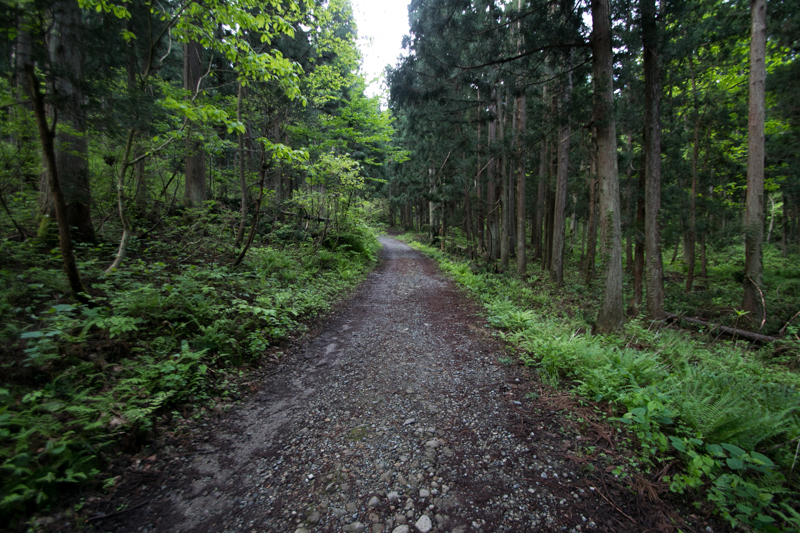 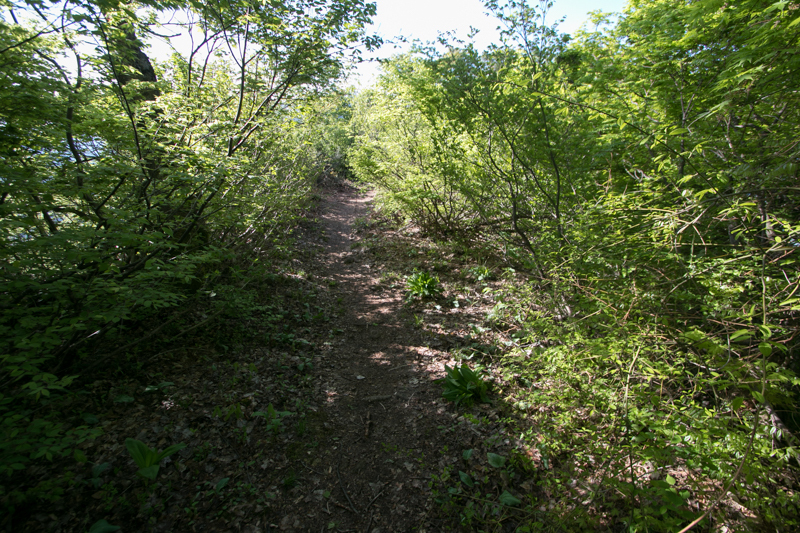 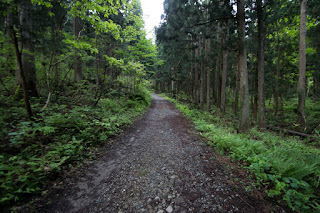 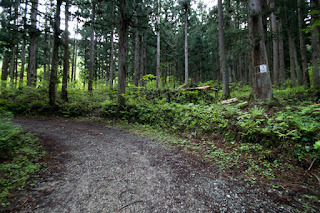 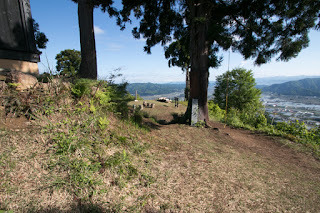 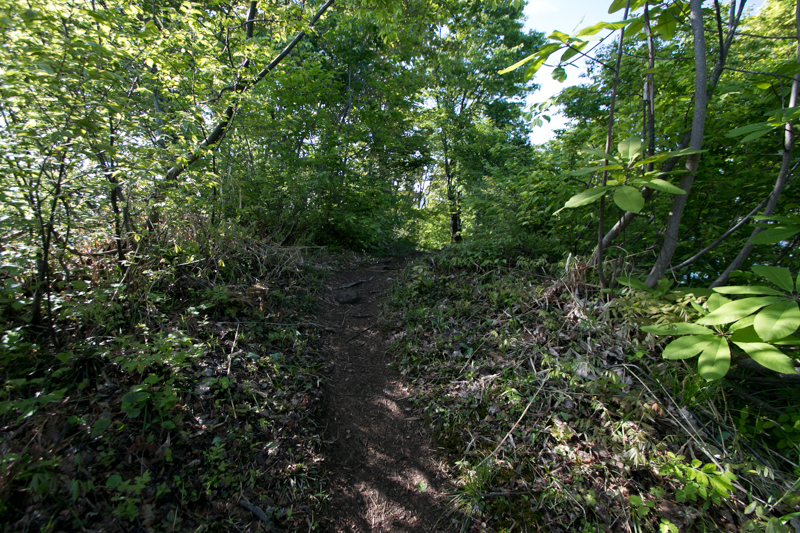 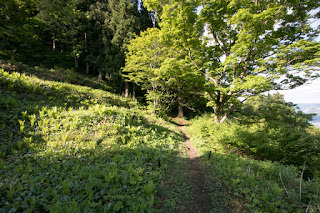 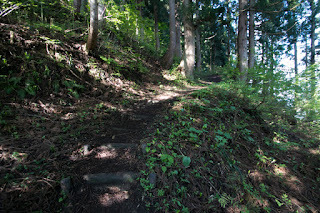 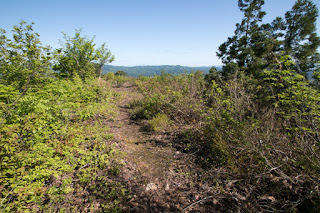 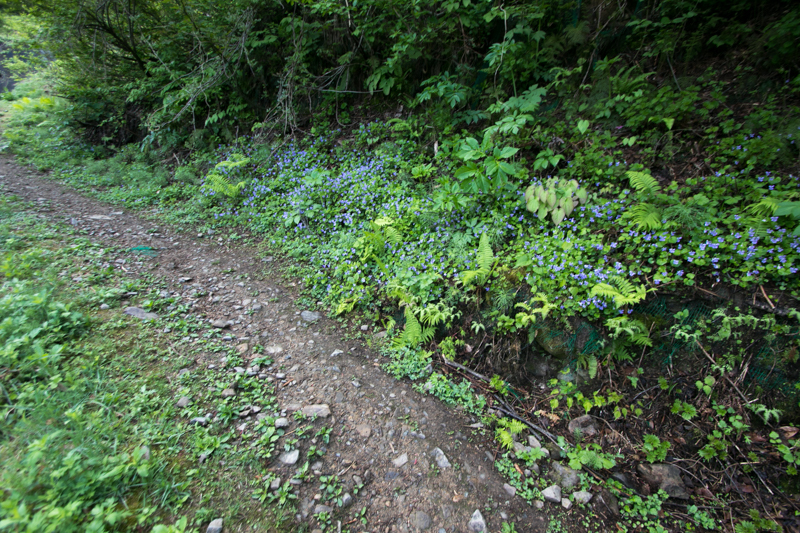 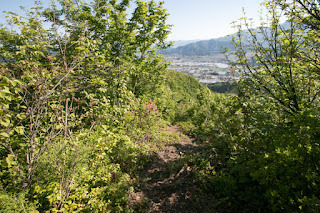 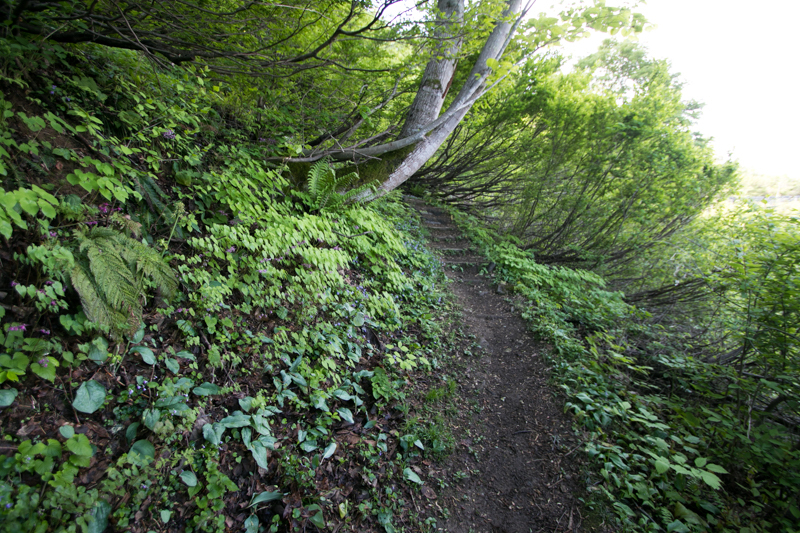 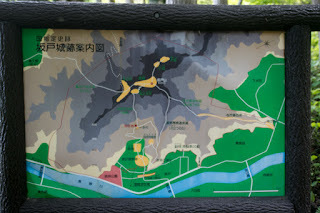 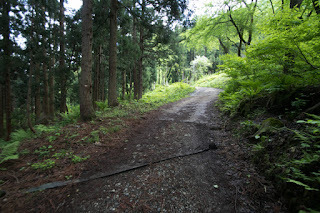 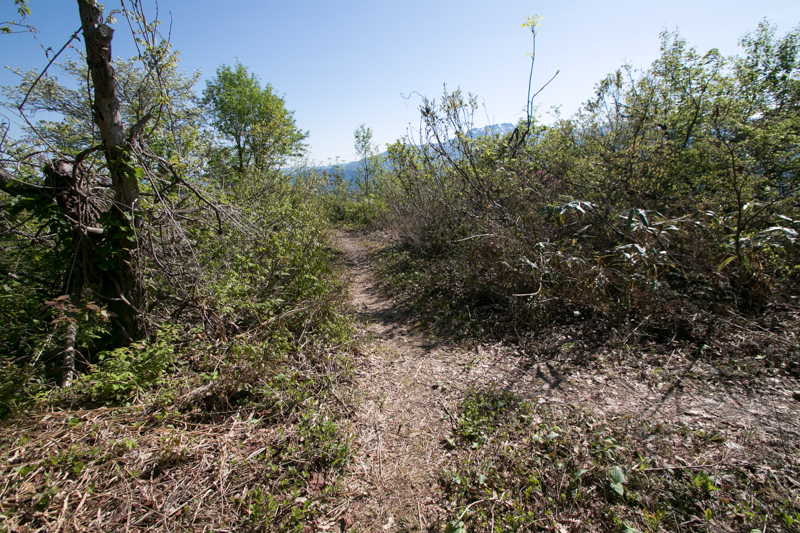 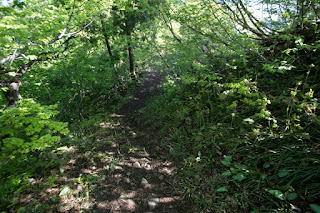 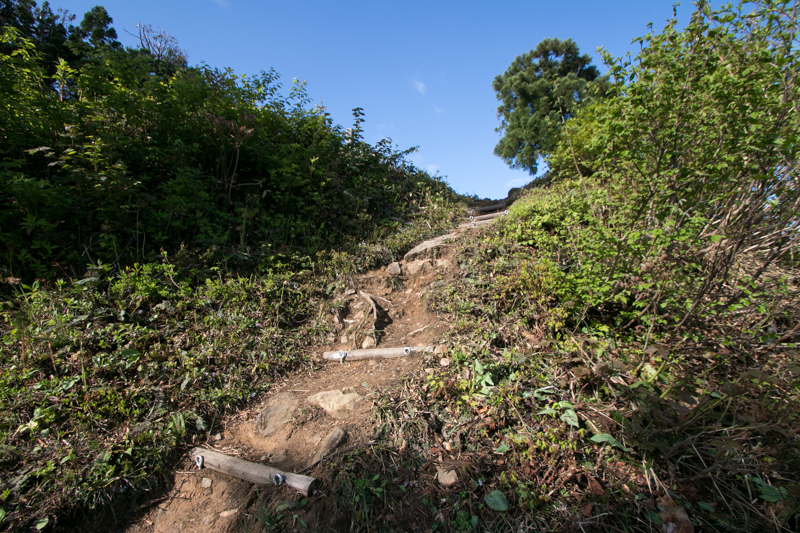 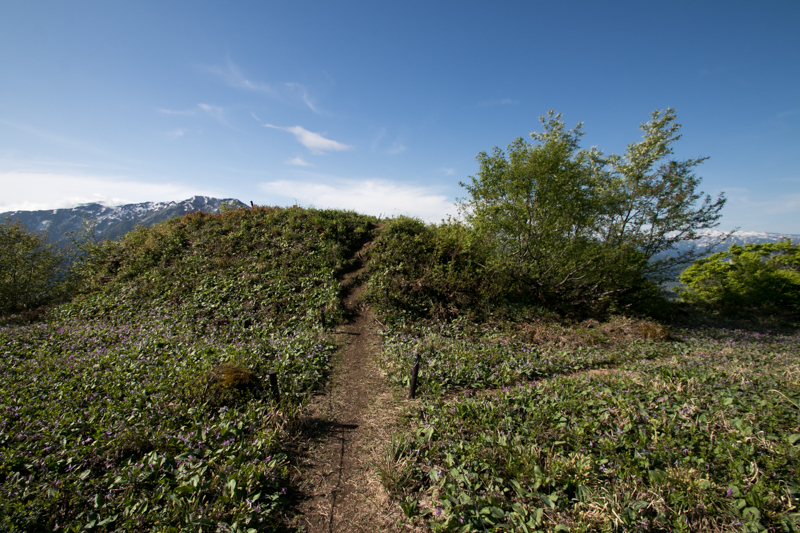 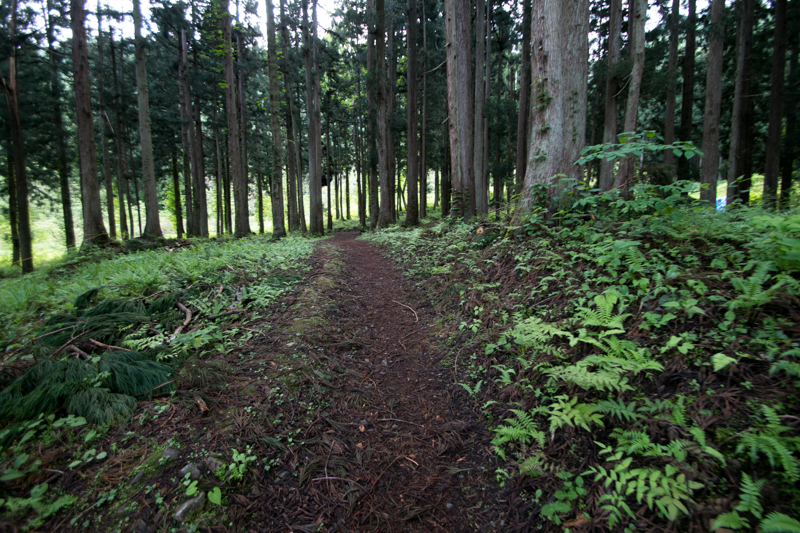 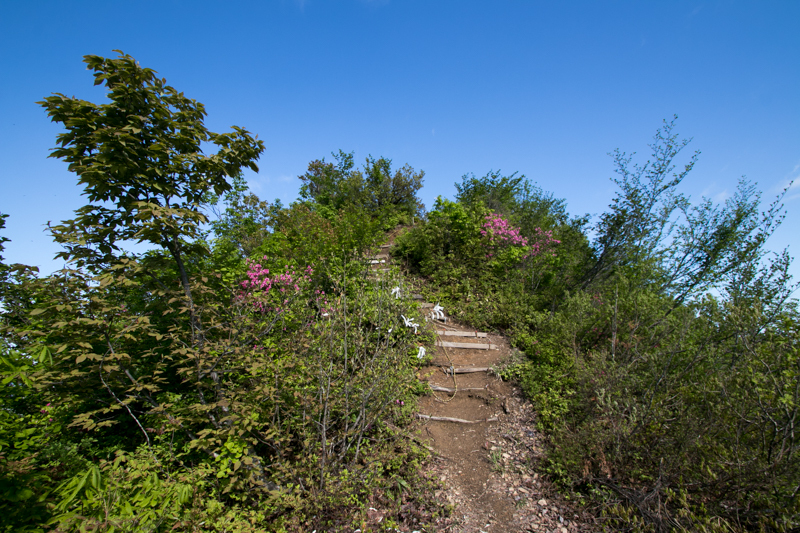 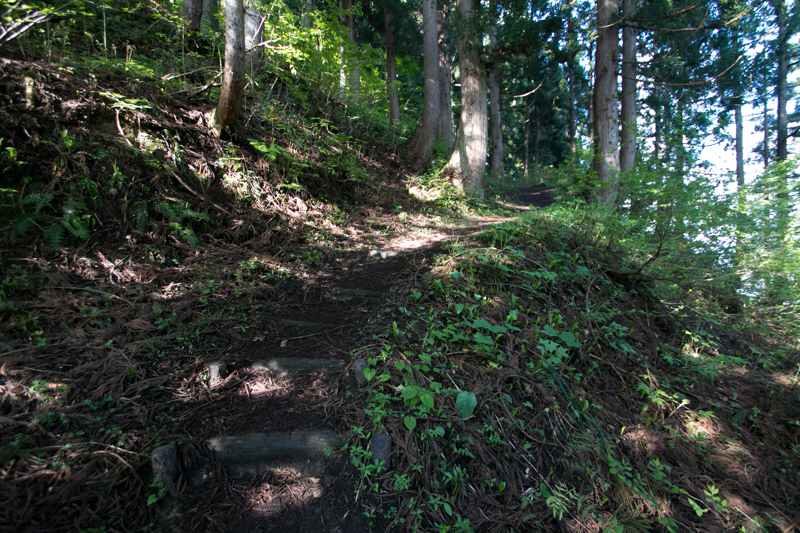 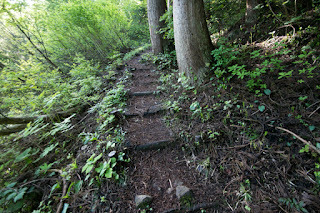 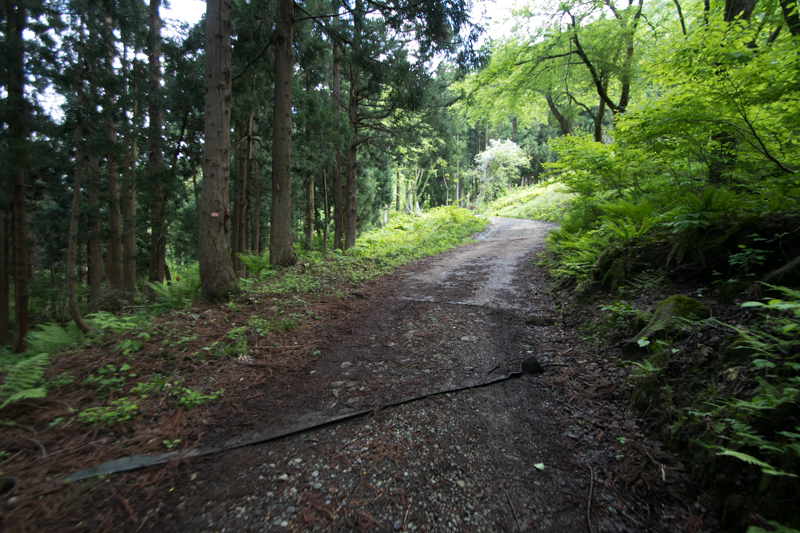 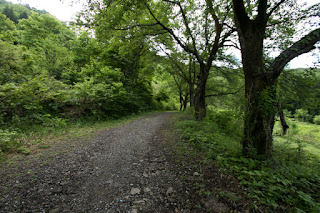 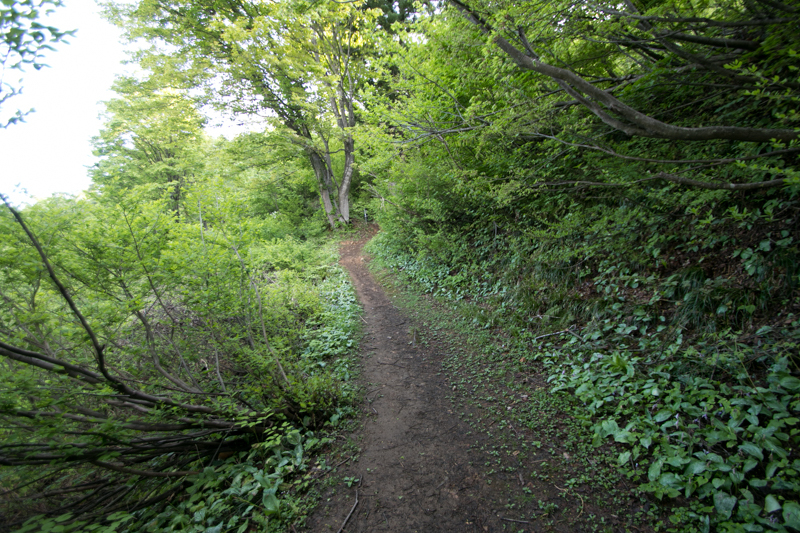 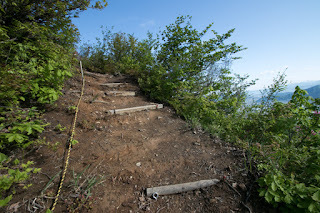 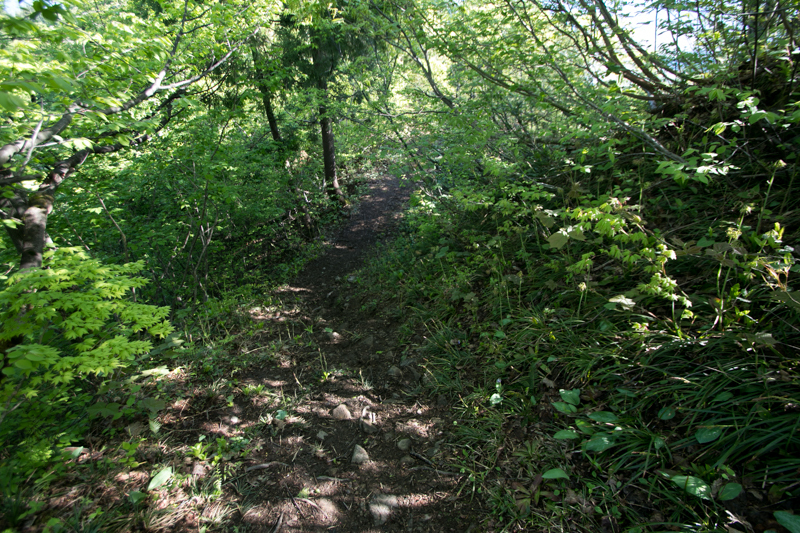 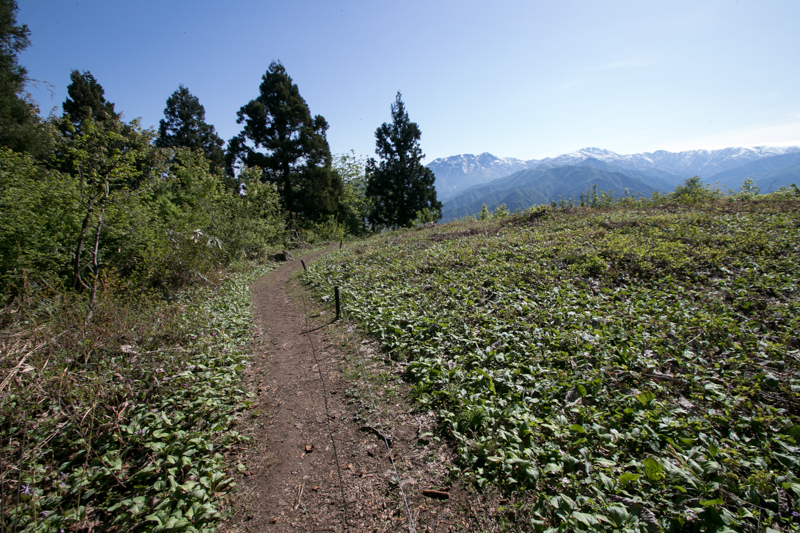 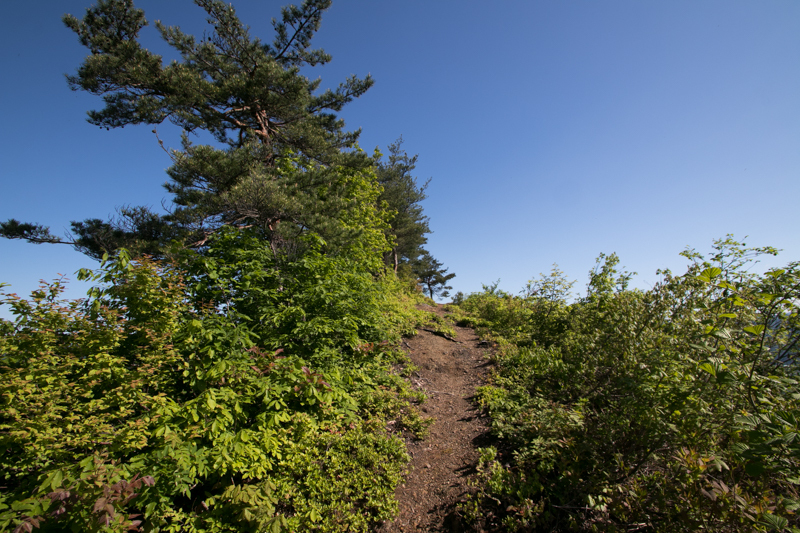 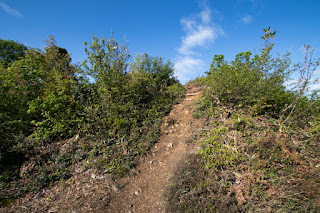 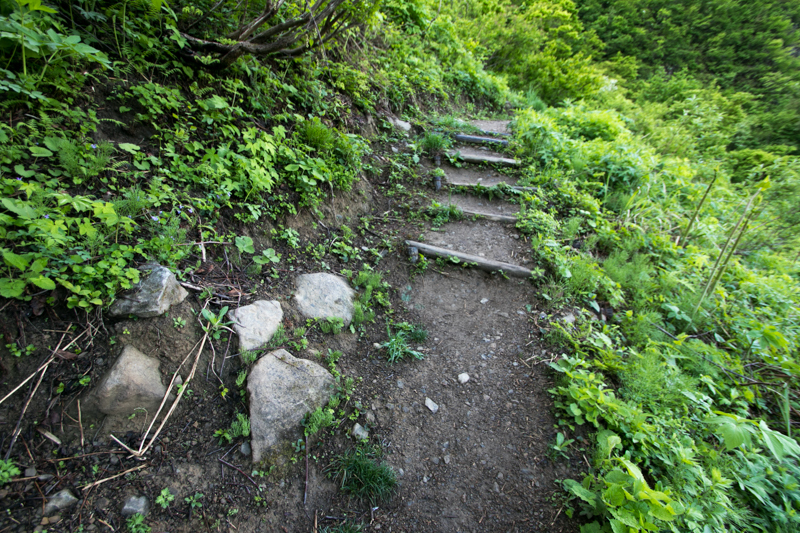 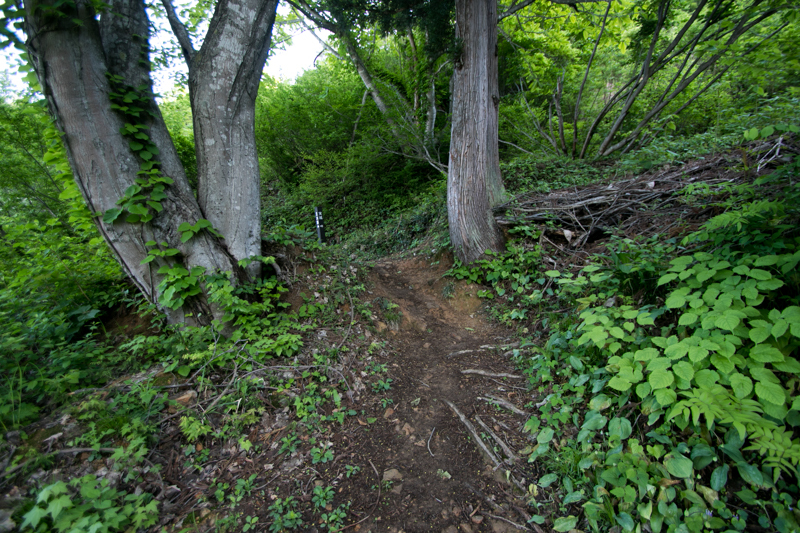 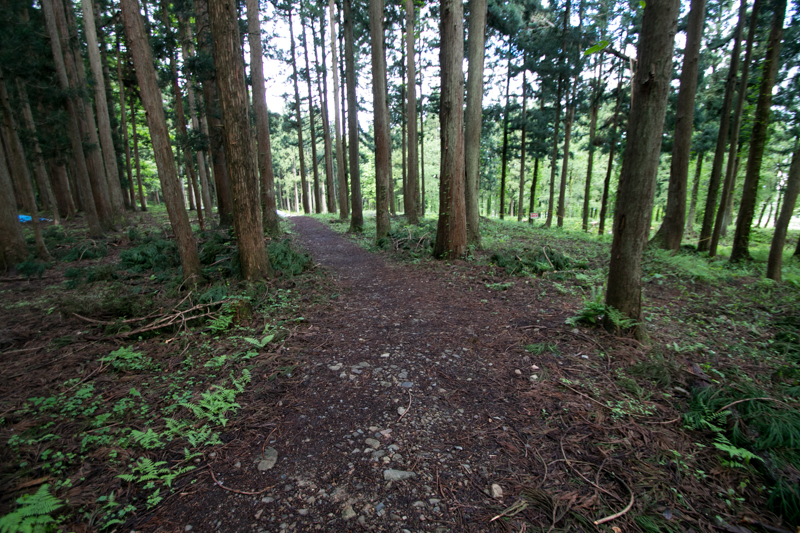 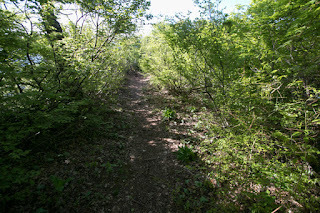 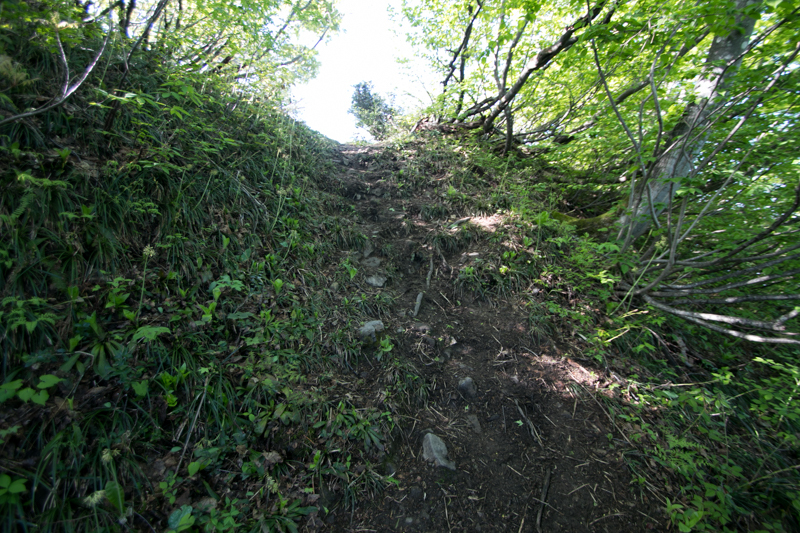 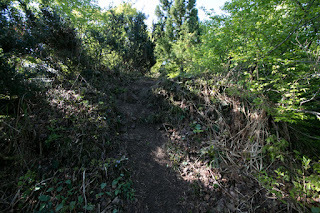 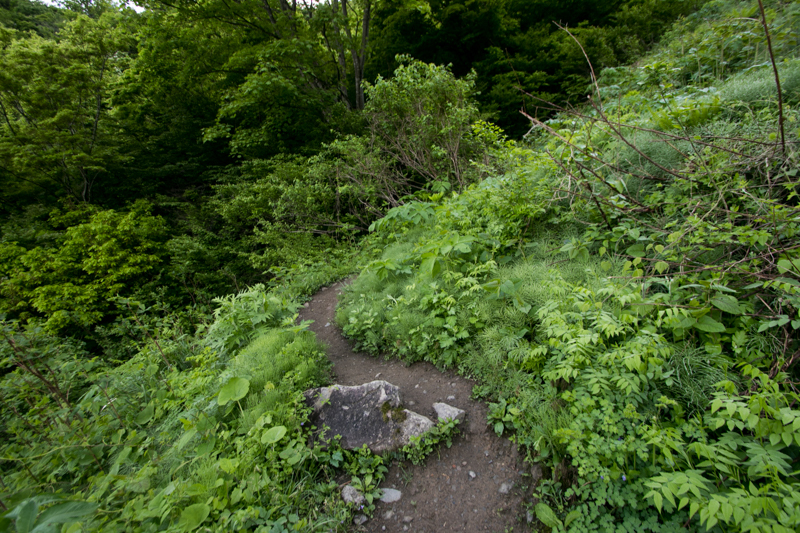 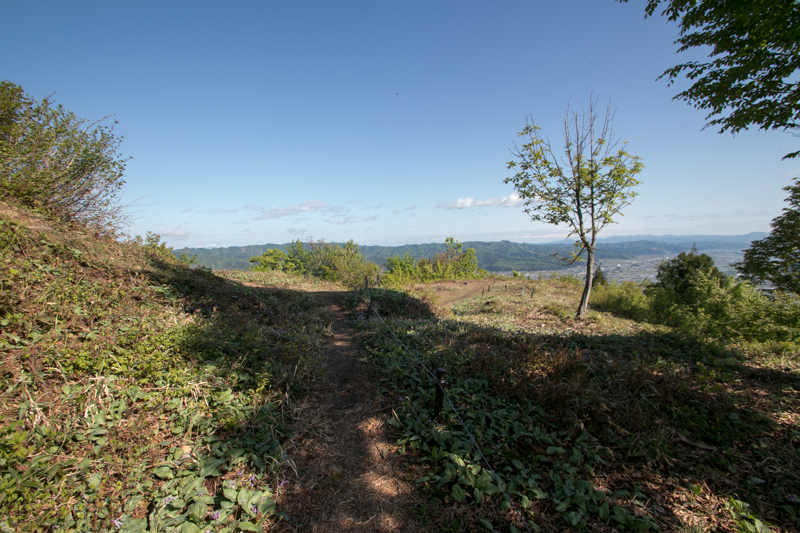 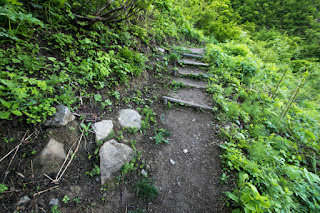 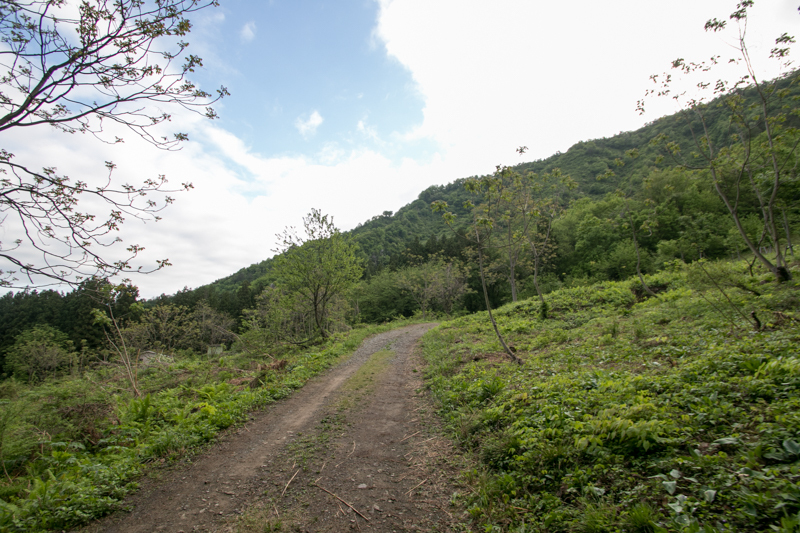 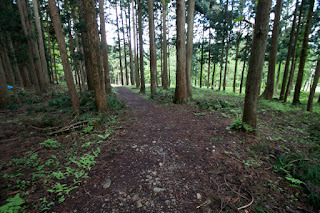 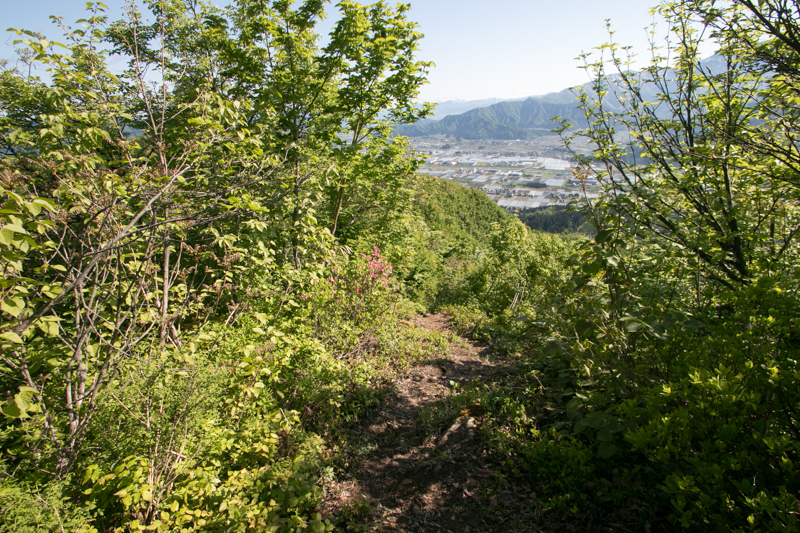 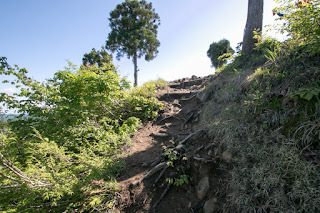 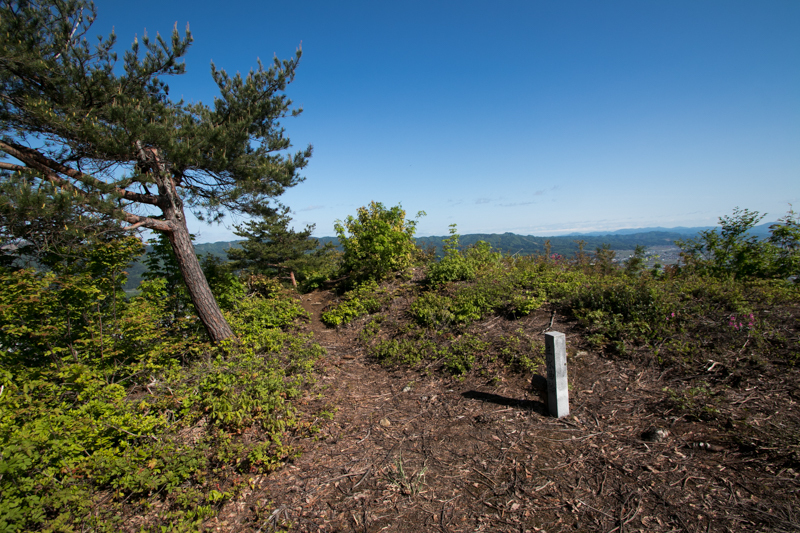 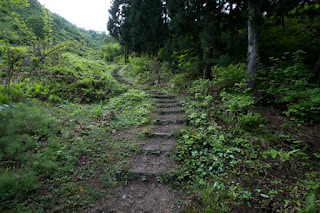 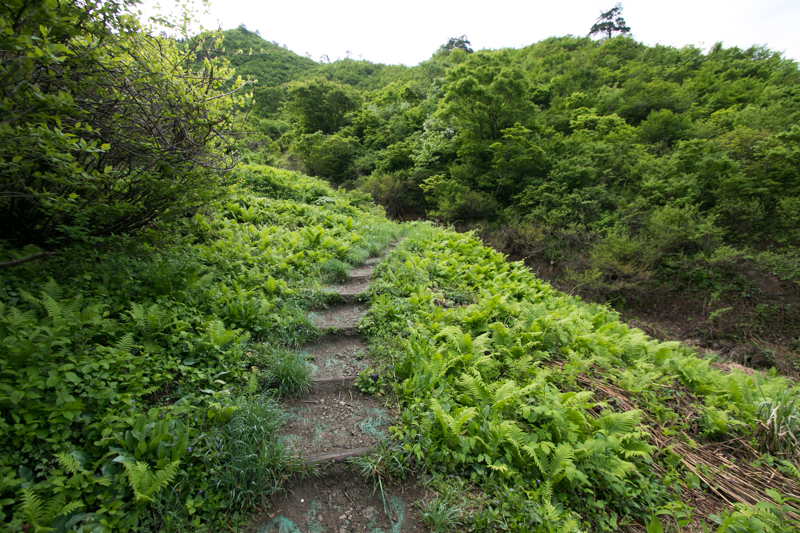 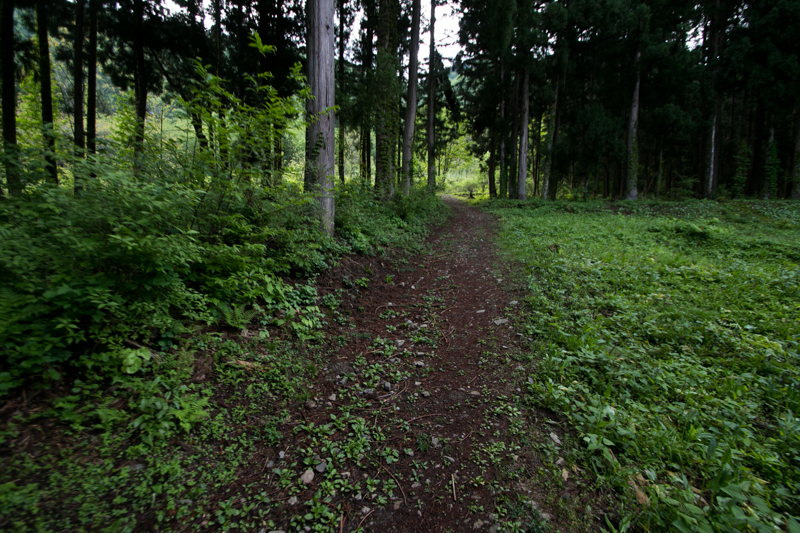 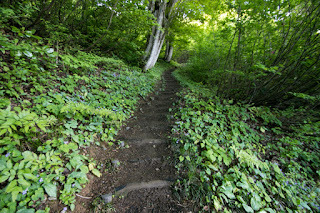 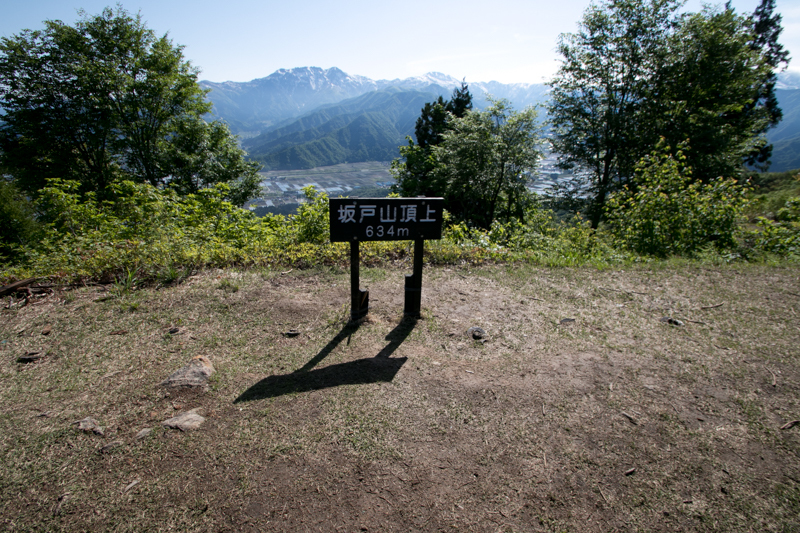 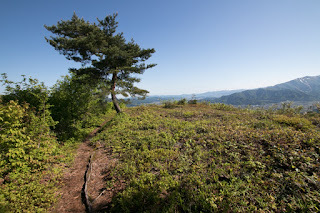 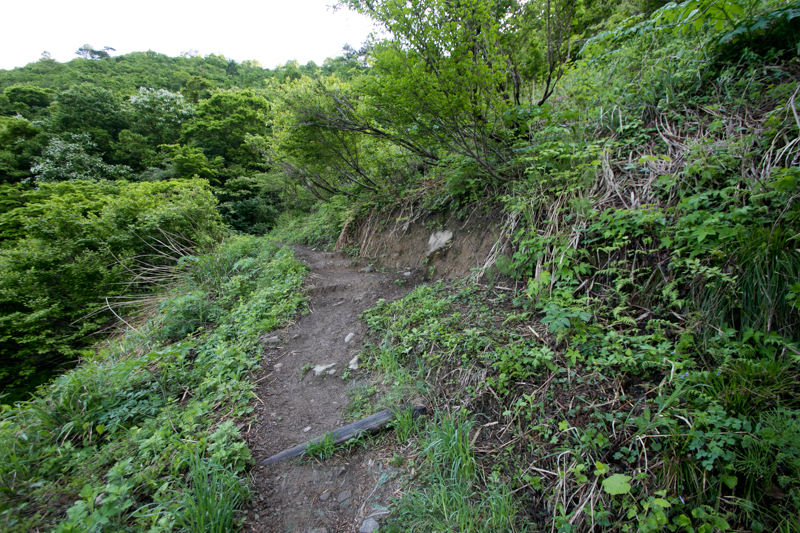 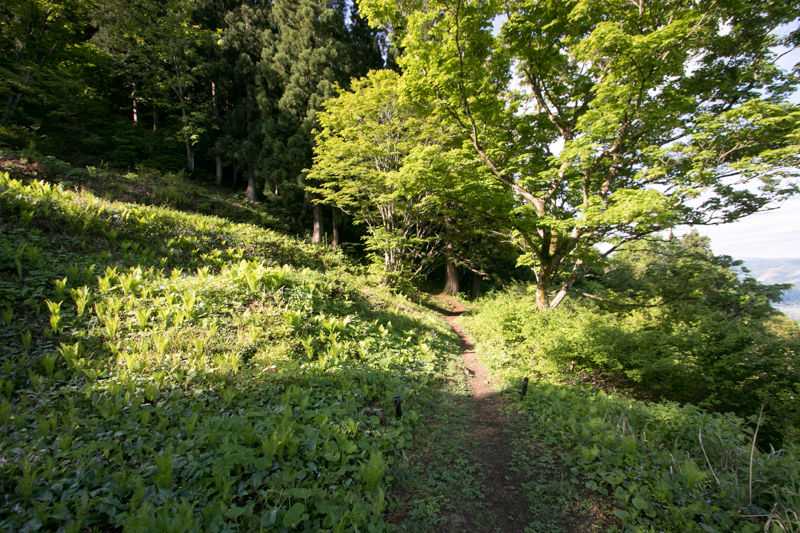 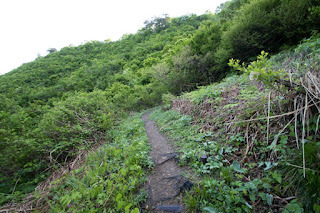 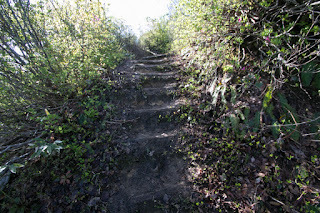 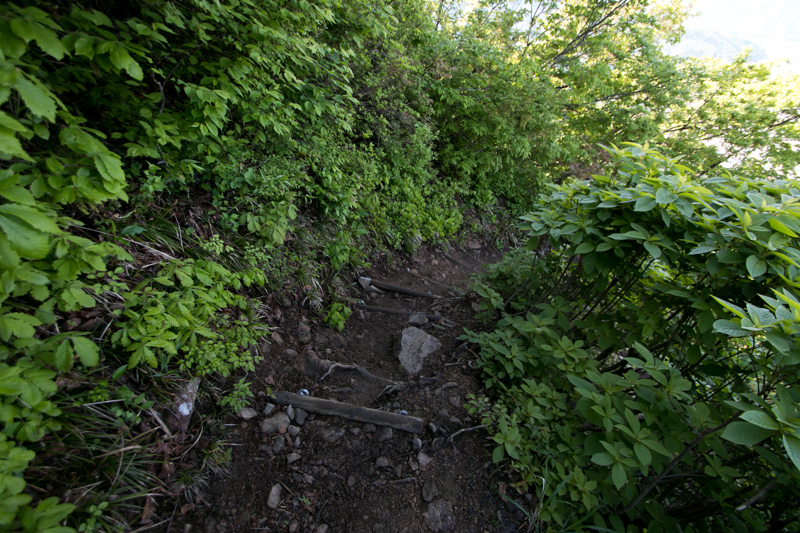 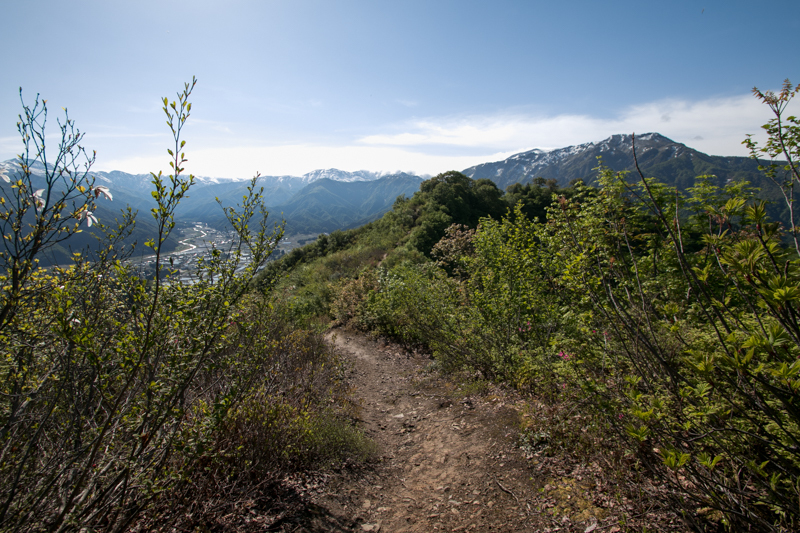 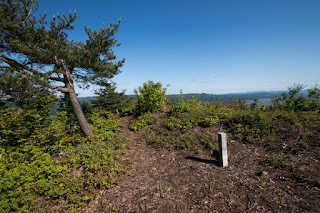 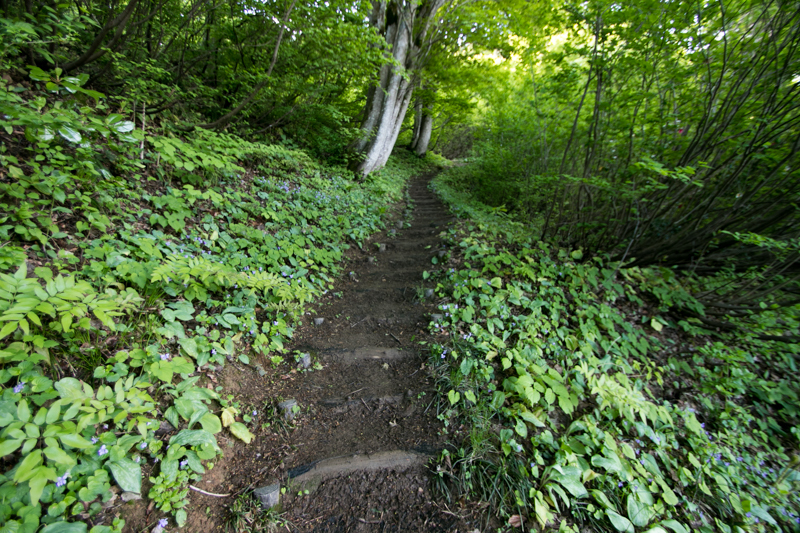 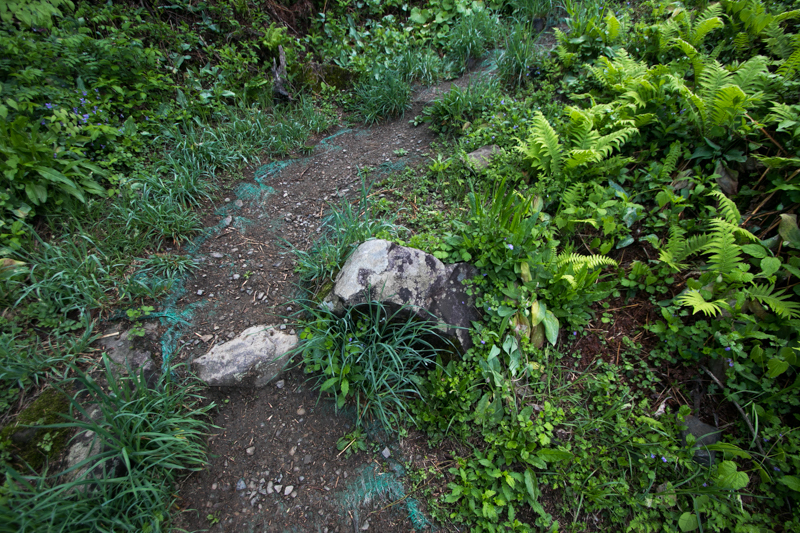 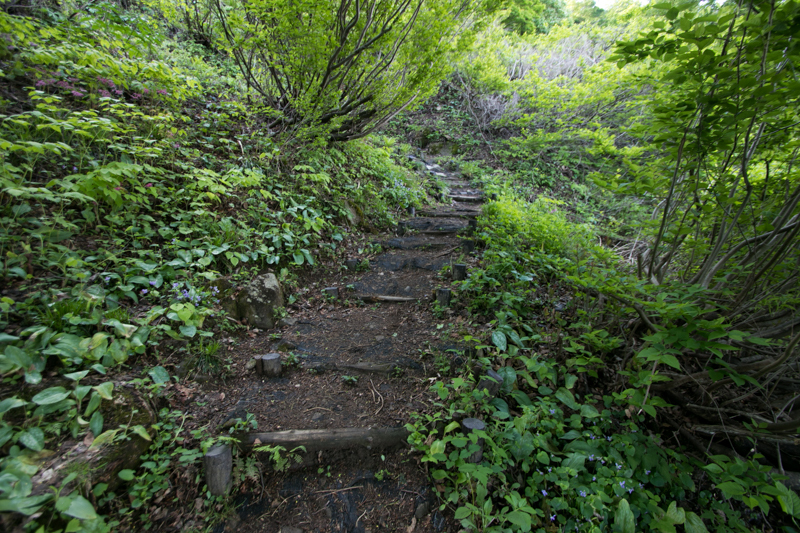 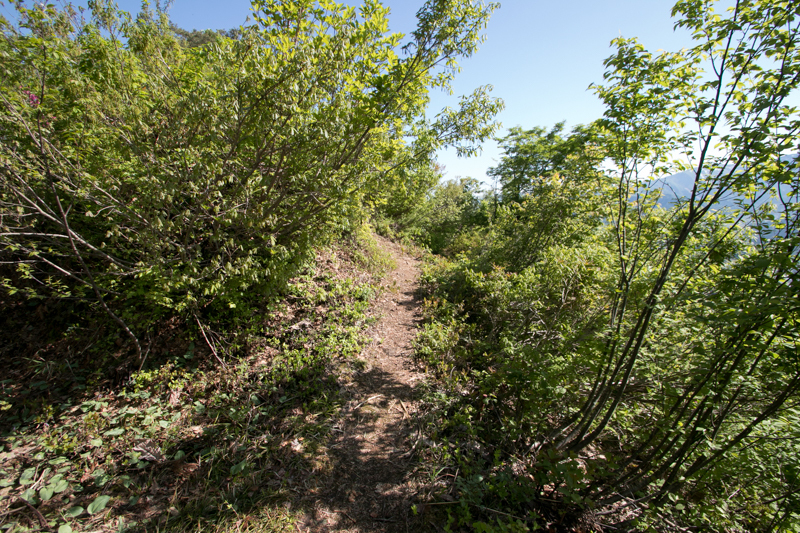 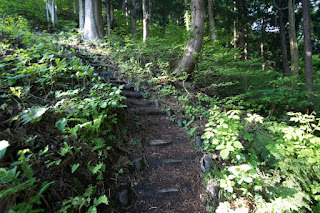 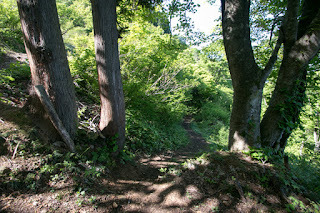 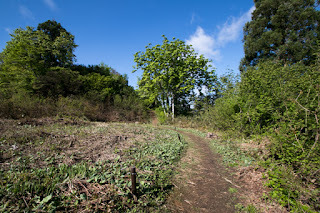 As castle site has a brilliant scenery of whole direction, it now becomes a hiking course of local people. 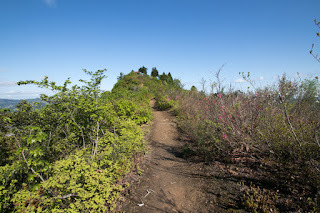 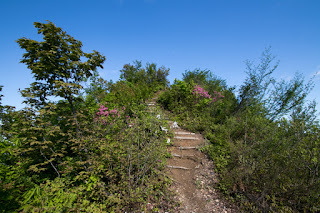 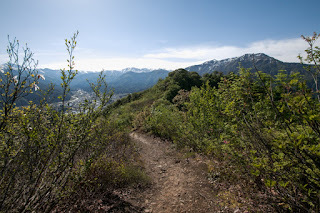 It is necessary to walk up tough slope and steps over 30 minutes to reach the peak, but magnificent view from the peak is worth more than hard way. 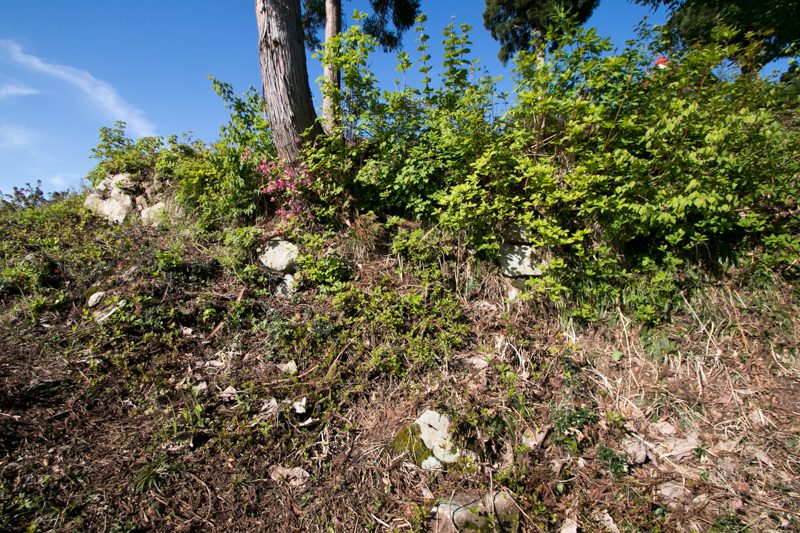 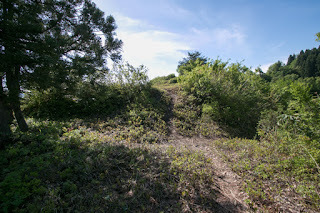 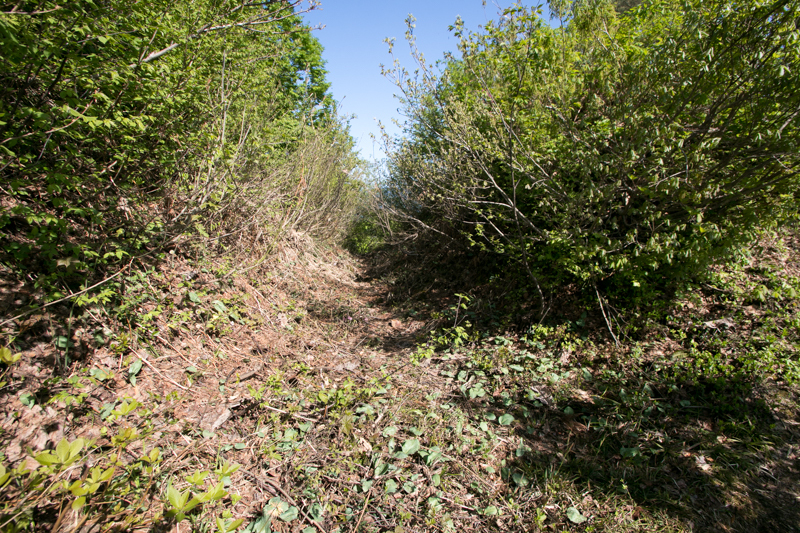 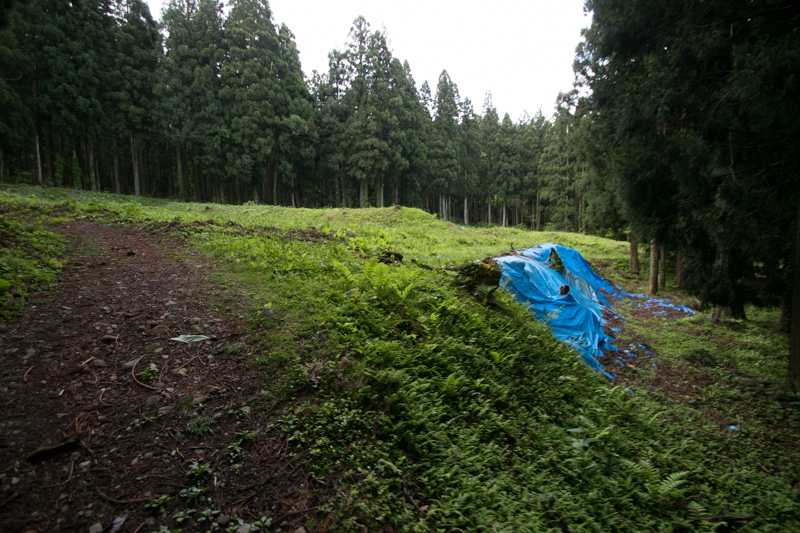 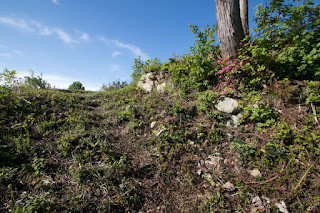 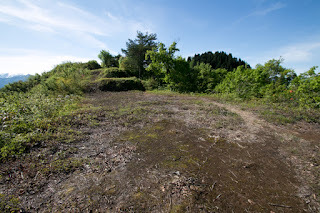 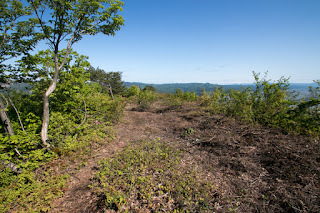 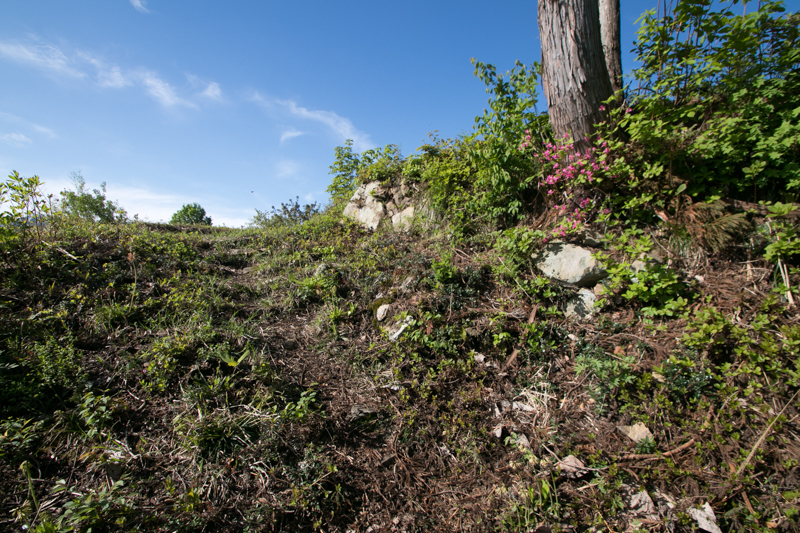 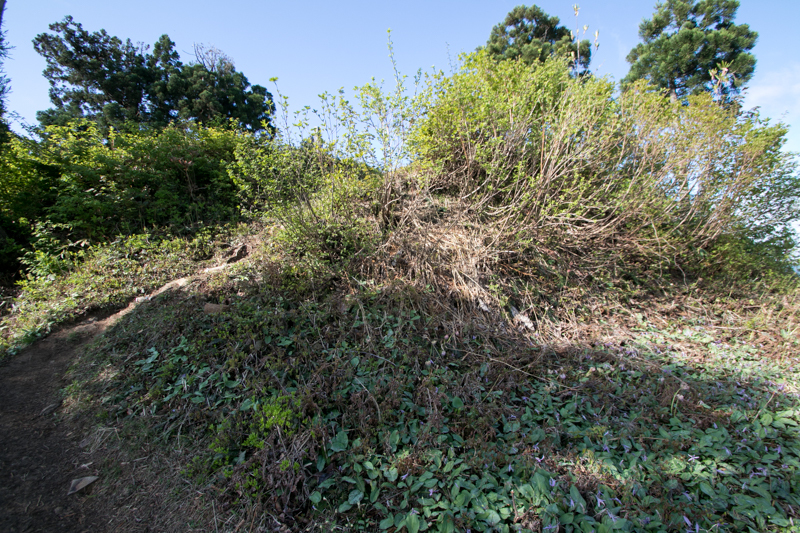 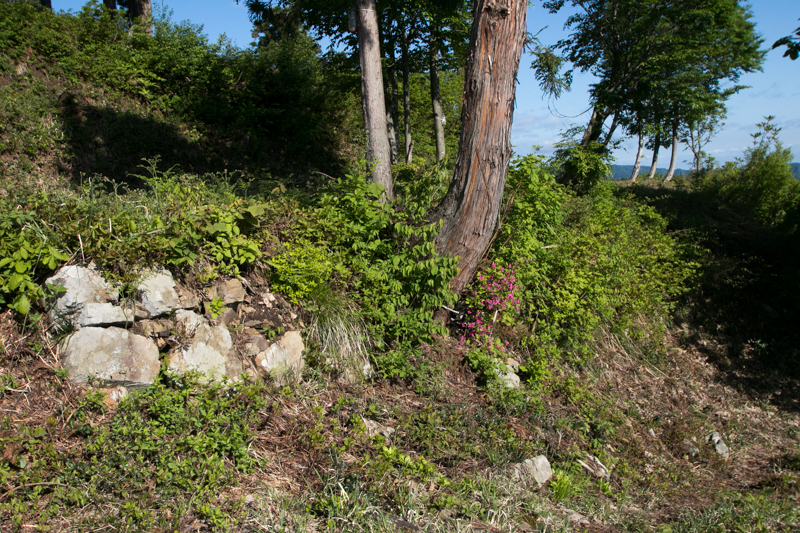 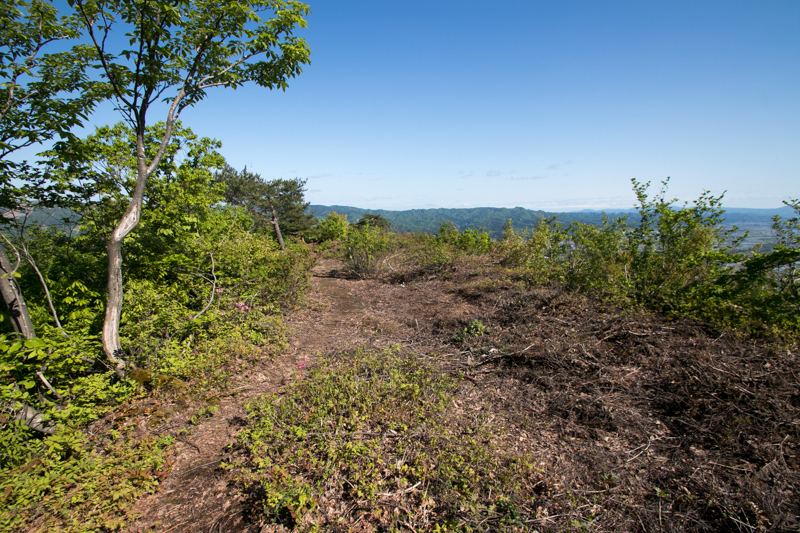 Standing at the castle site over 500 meter long and being isolated in the sky, pressure from attacking force at hillside is not imagined, and this might enabled desperate defense battle against overwhelming enemy. 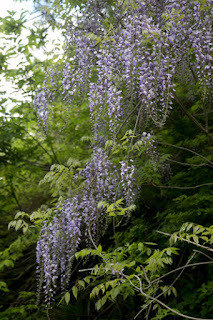 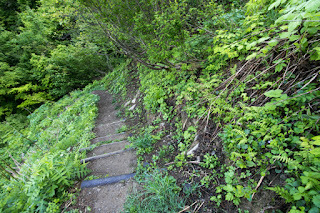 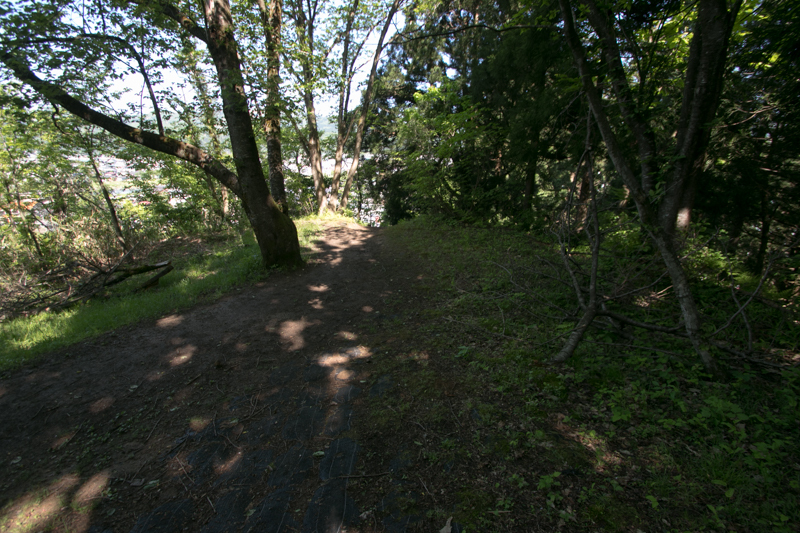 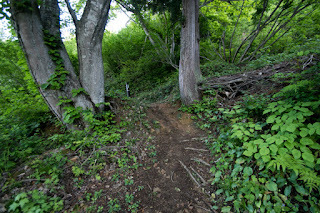 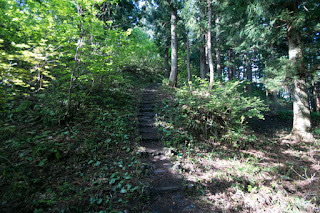 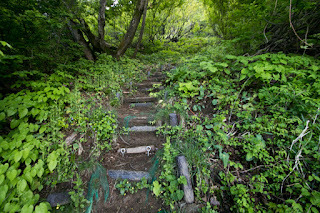 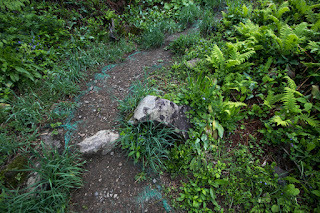 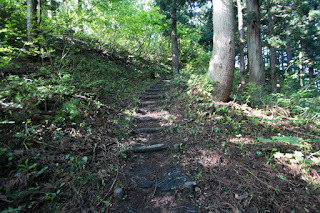 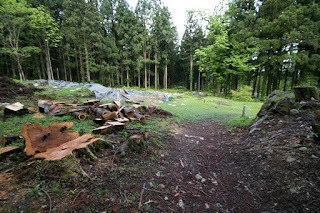 20 minutes walk from JR East Joetsusen line /Hokuetsu-Kyuko line Hokuhokusen line Muikamachi station to hillside entrance. 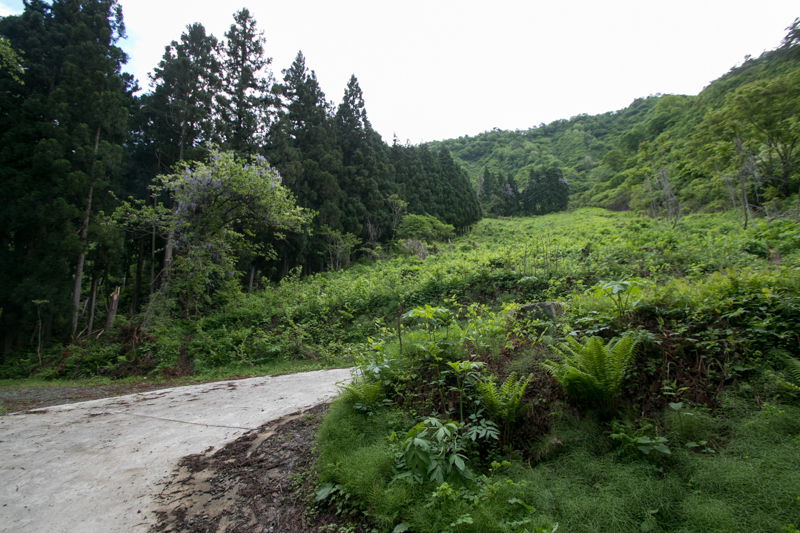 10 minutes drive from Kanetu-Jidoshado Expressway Muikamachi interchange. 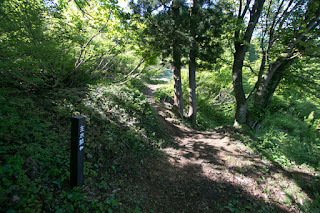 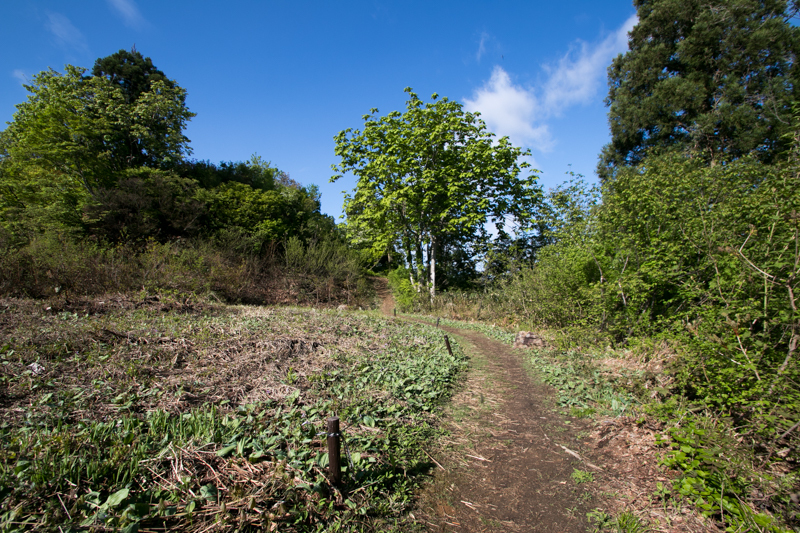 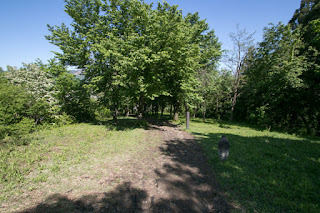 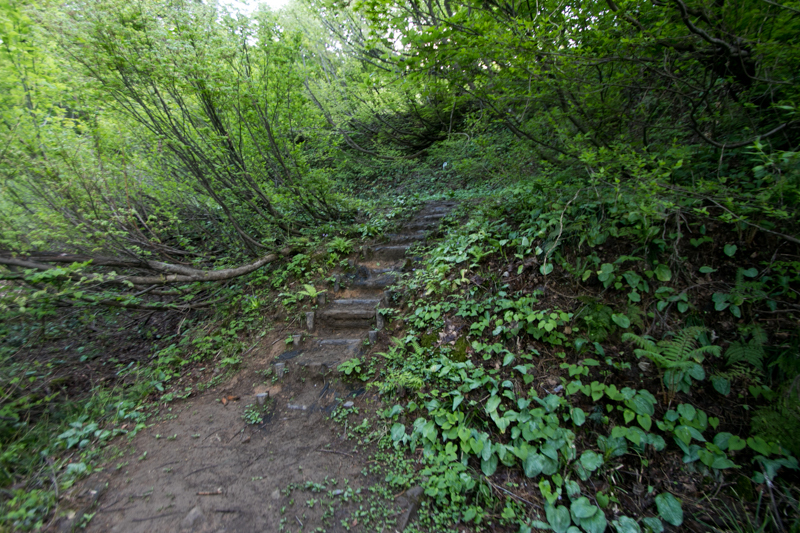 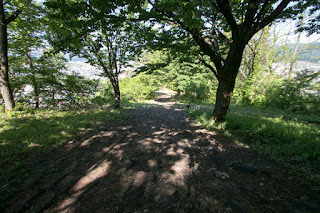 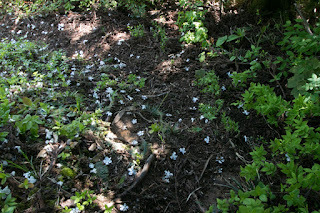 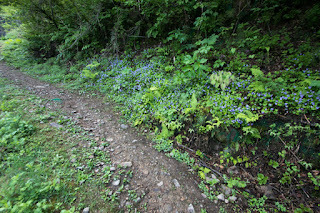 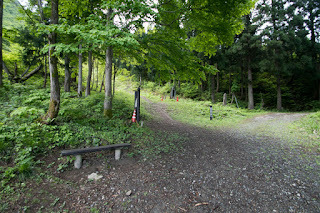 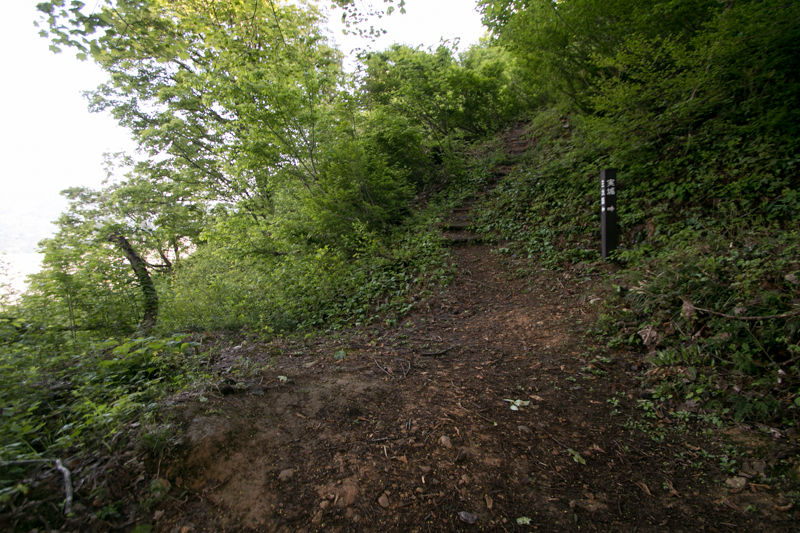 60 minutes walk from hillside entrance to hilltop castle.